on the matters set out in the attached Agenda. The Agendas for Council Meetings and Council Reports for each meeting will be available to the public on Council’s website as close as possible to 5.00 pm on the Thursday prior to each Ordinary Meeting. A hard copy is also made available at the Bega Administration Building reception desk and on the day of the meeting, in the Council Chambers. The Minutes of Council Meetings are available on Council's Website as close as possible to 5.00 pm on the Monday after the Meeting. 5. The Minutes of each Council meeting are published in draft format, and are confirmed by Councillors, with amendments if necessary, at the next available Council Meeting. There are no reports to Standing Committees. 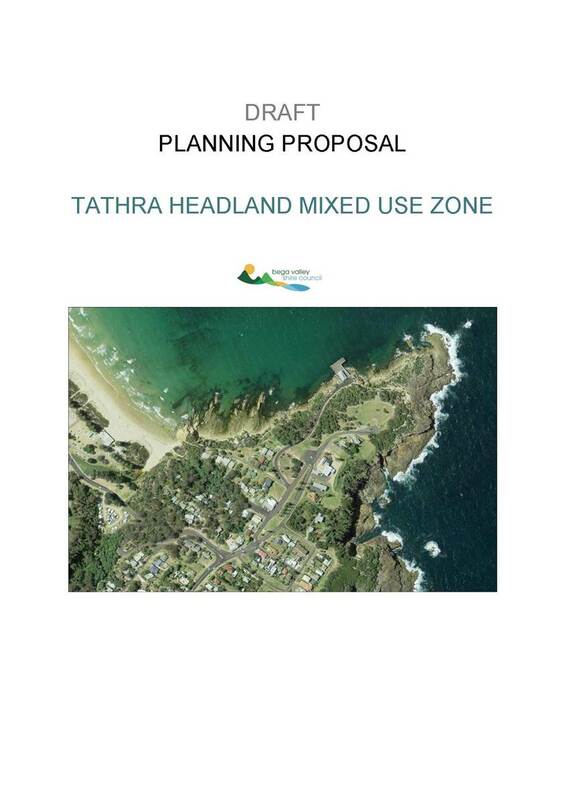 This report seeks Council approval to refer for Gateway Determination a Planning Proposal to rezone land at the Tathra Headland to B4 Mixed Use under Bega Valley Local Environmental Plan 2013. 1. 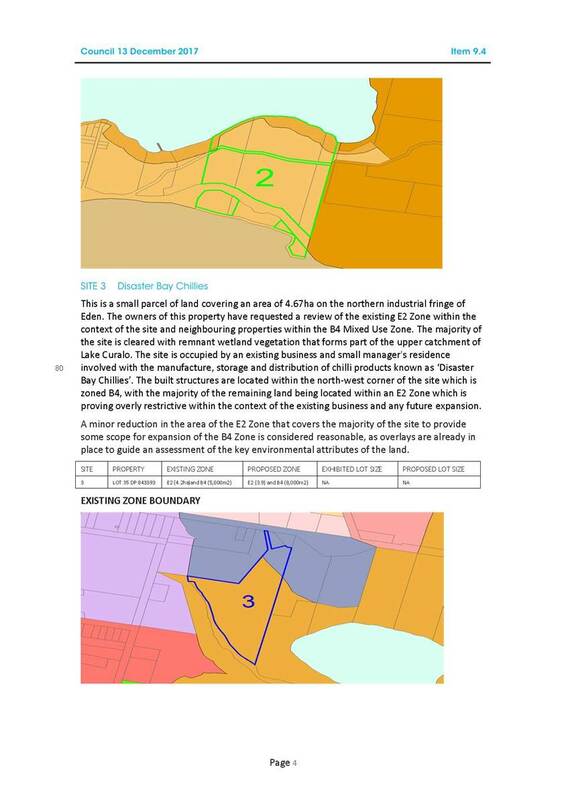 That Council resolve to support, in principle, the recommended zoning amendment from B2 Local Centre to B4 Mixed Use as detailed in Attachment 3. 2. 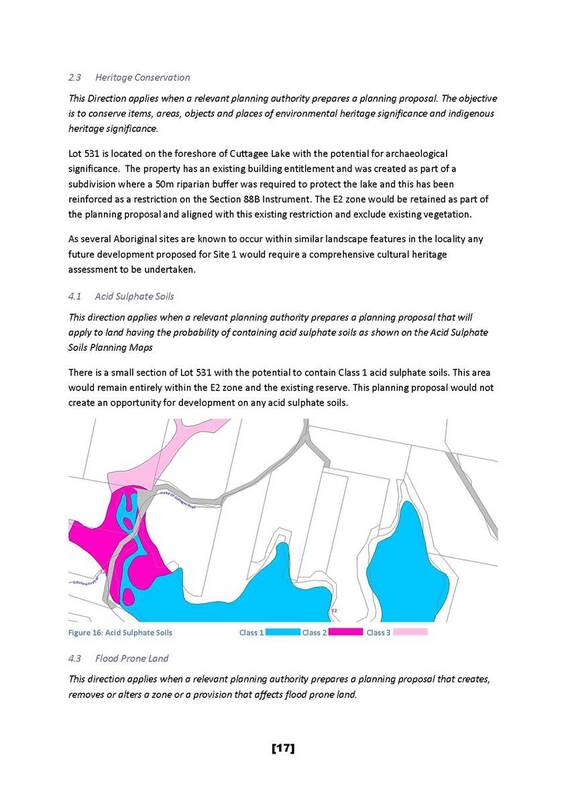 That Council officers be authorised to submit this planning proposal (Attachment 4) to the NSW Department of Planning for Gateway Determination. 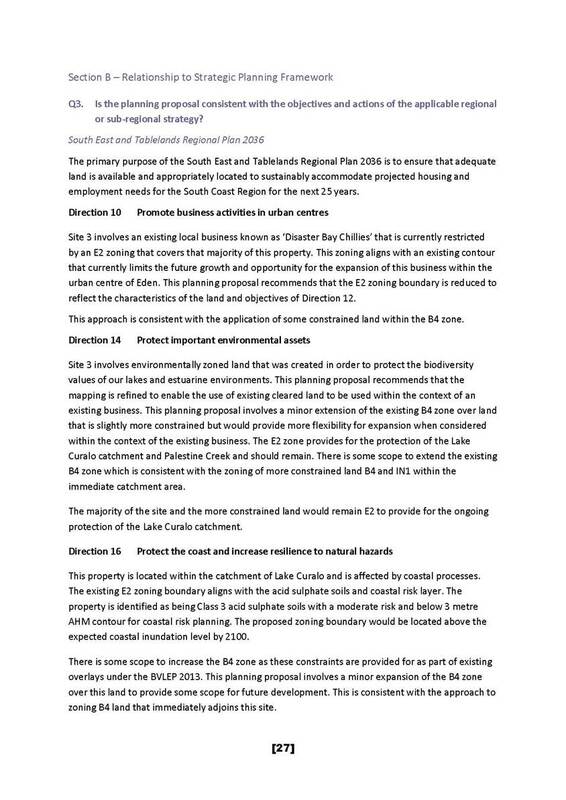 This report recommends that land on the edge of the existing Tathra Headland commercial precinct be rezoned from B2 Local Centre to B4 Mixed Use under Bega Valley Local Environmental Plan (BVLEP) 2013. 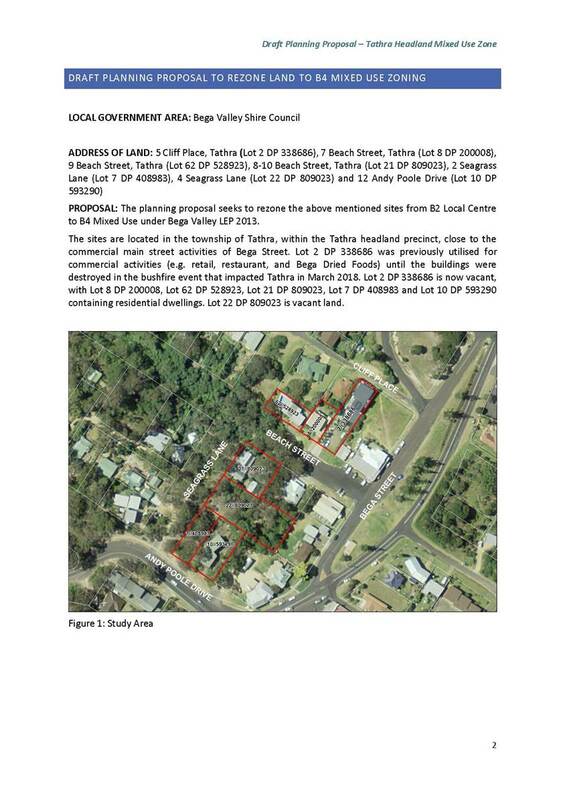 Council received a request from the owners of Lot 2 DP 338686, 5 Cliff Place, Tathra (formerly Cliff Place Cafe) to rezone their property from commercial to a higher density residential zone such as R3 Medium Density Residential after the building was destroyed by bushfire in 2018. 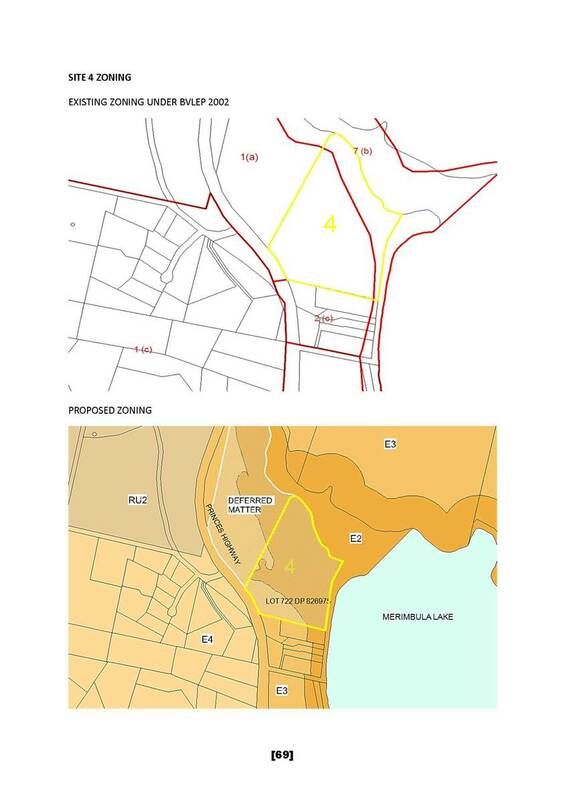 The initial request to rezone the land was not supported as the spot rezoning of this land would be out of place within the context of adjoining properties and the Tathra Headland precinct. 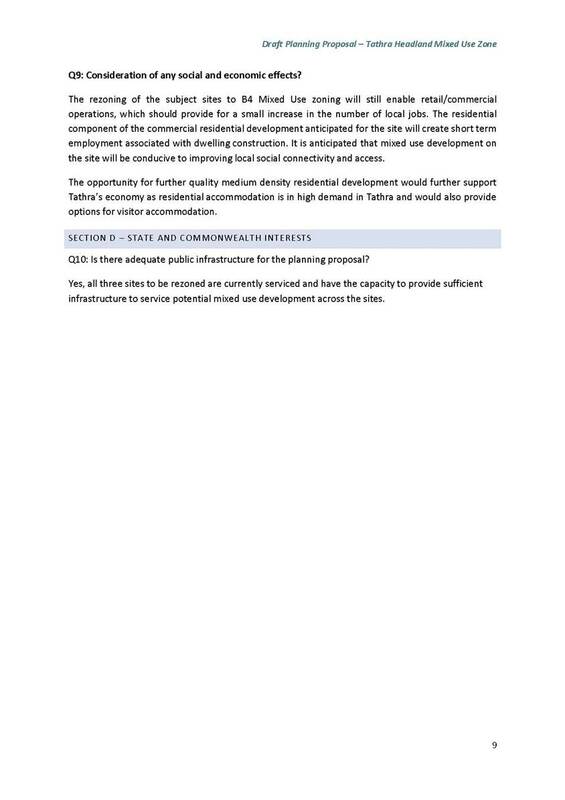 Instead, the request was considered within the context of the site and adjoining properties to determine the best approach for the future growth and development of Tathra. 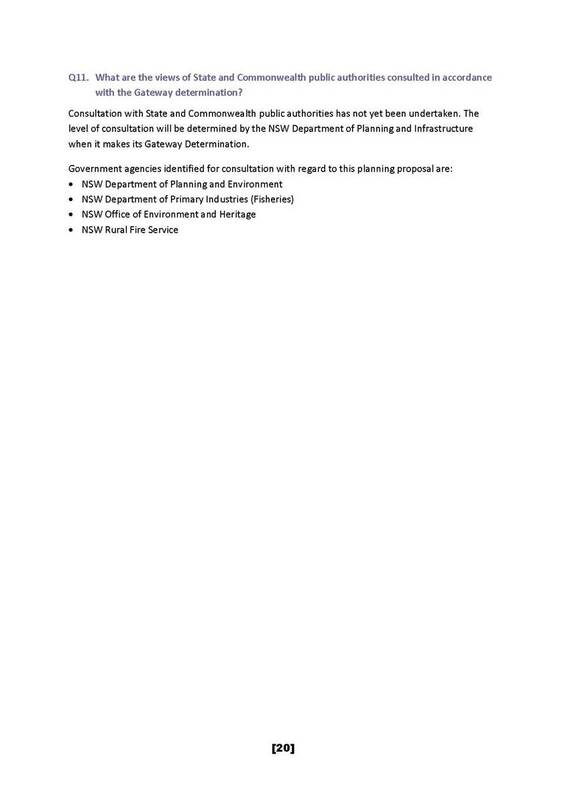 The NSW Department of Planning and Environment offered its assistance as part of the bushfire recovery process and volunteered time to help Council draft this PP. 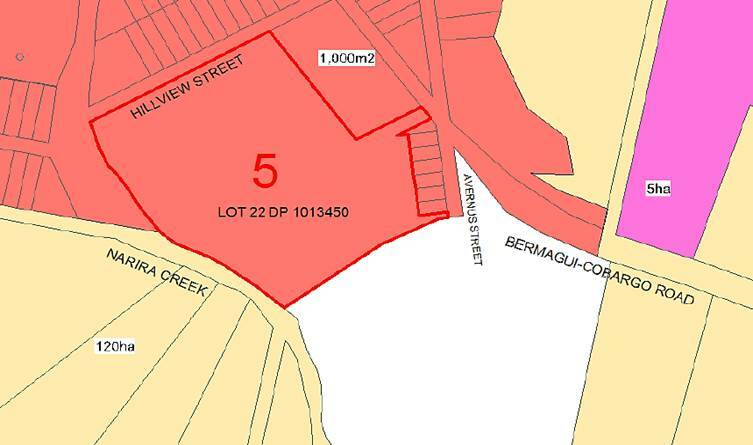 The sites are located in the township of Tathra, within the Tathra Headland precinct, close to the commercial activities on Bega Street (Attachment 1). Lot 2 DP 338686 was previously utilised for commercial activities (e.g. Retail, Restaurant, and Bega Dried Foods) until the buildings were destroyed and is now vacant. 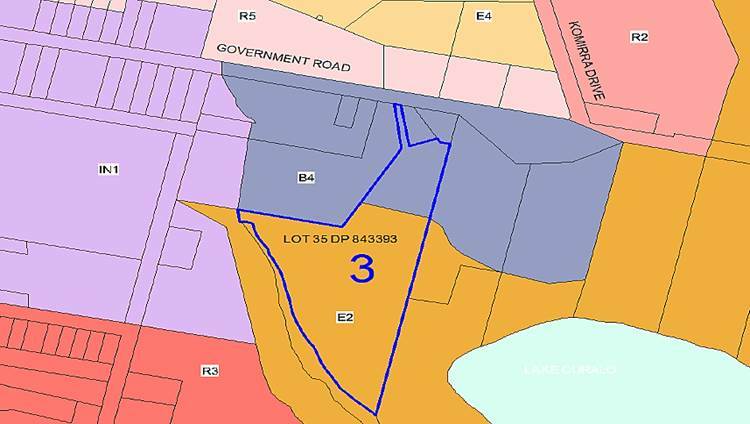 Lot 8 DP 200008, Lot 62 DP 528923, Lot 21 DP 809023, Lot 7 DP 408983 and Lots 8-10 DP 593290 contain existing residential dwellings. 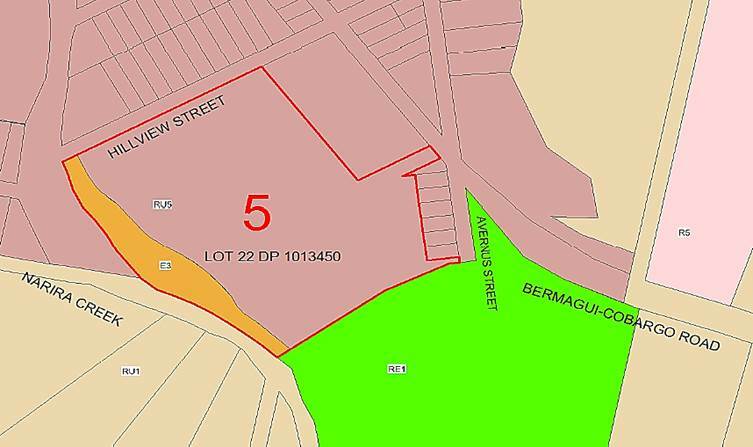 Lot 22 DP 809023 is vacant land. 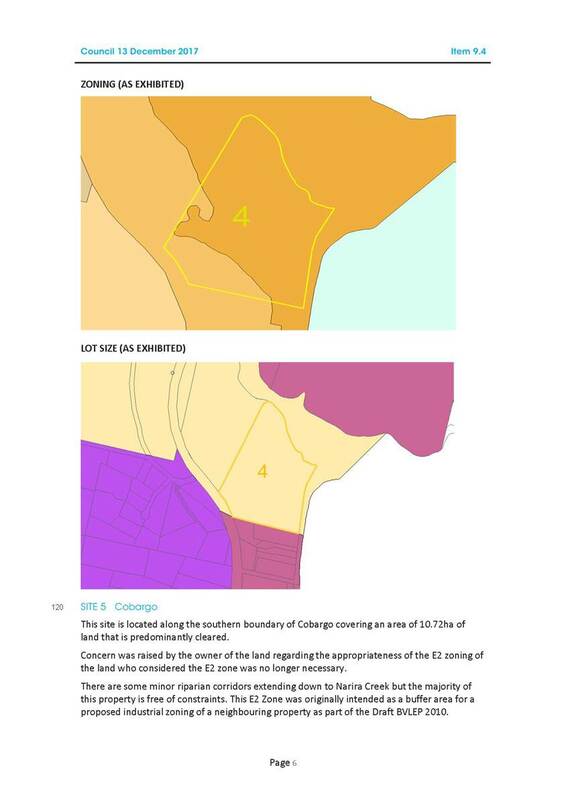 The existing B2 Local Centre zone (Attachment 2) carried over from previous zoning BVLEP 2002 and has not resulted in any significant commercial investment over the last 20 years, apart from the recently destroyed Cliff Place Cafe. New commercial development within the Tathra Headland precinct has generally been ancillary to a residential use. 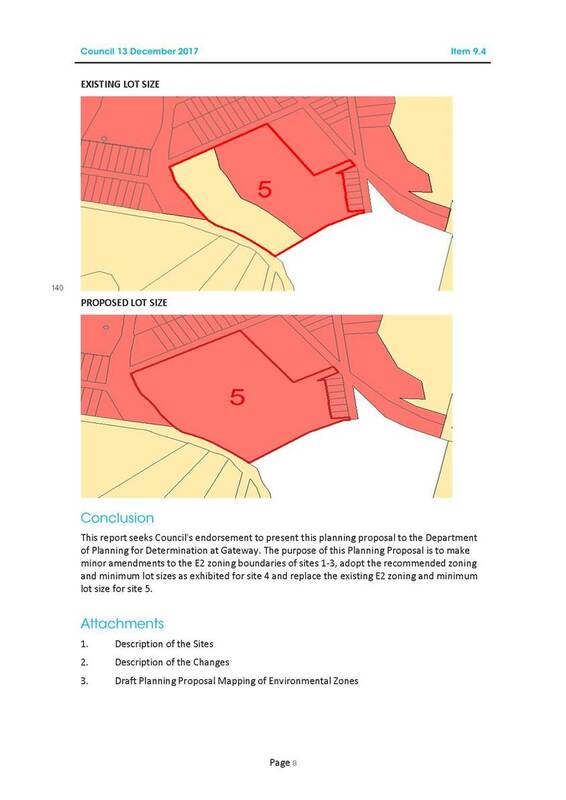 The sites that are subject to this PP are either vacant or occupied by existing low-density dwellings. 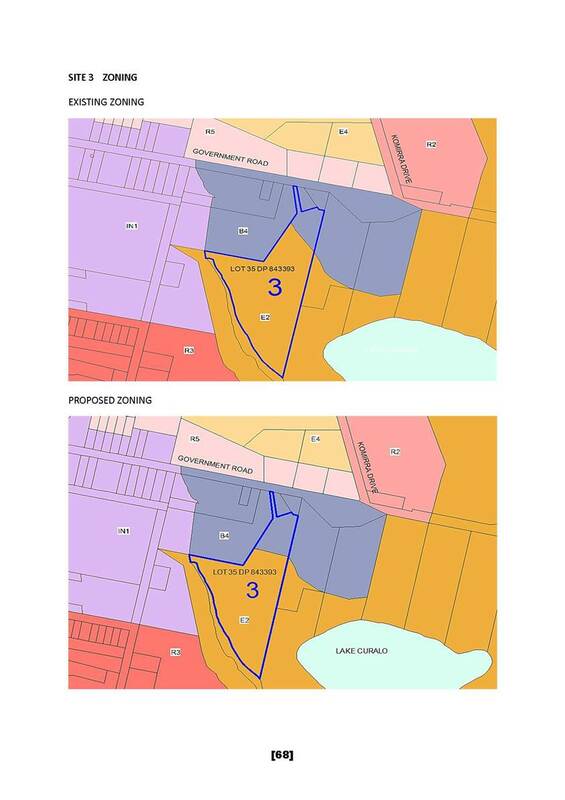 The B4 Mixed Use zone is recommended to create a transitional zone between the existing Commercial B2 Local Centre zone and R2 Lower Density Residential Zone further to the west. 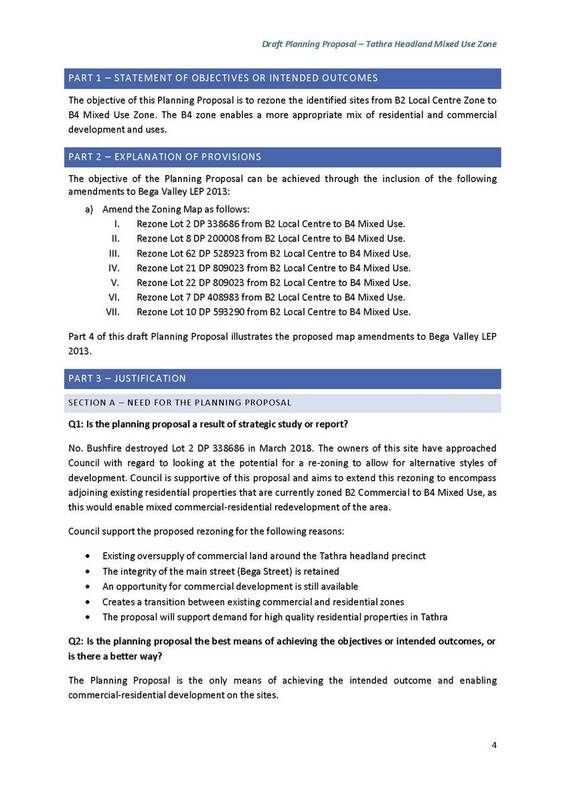 The application of a B4 Mixed Use zone is consistent with the approach previously used in other town centres throughout the Shire such as Pambula, Eden and Bega during the drafting of BVLEP 2013. 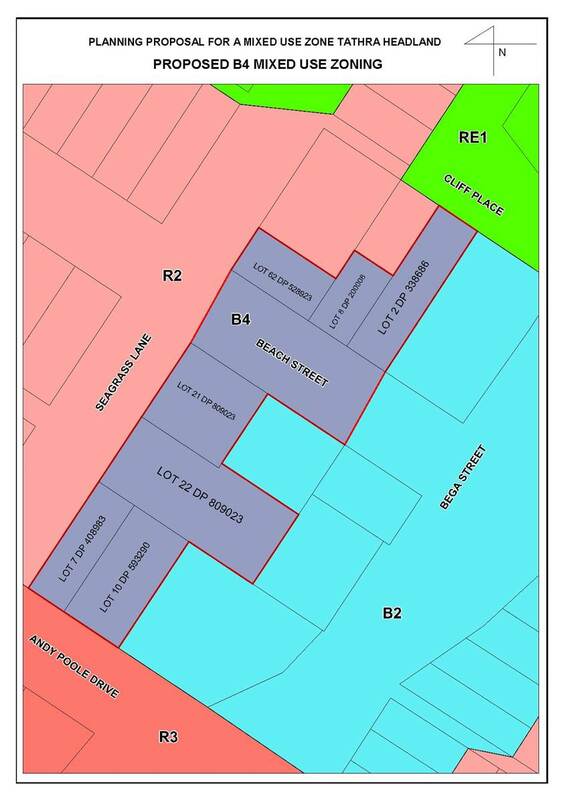 This proposed rezoning (Attachment 3) would provide greater flexibility in the consideration of residential development without losing the commercial opportunities provided by a B4 Mixed Use zone. Preliminary consultation was undertaken with two property owners on Beach Street adjoining the former Cliff Place Café site. 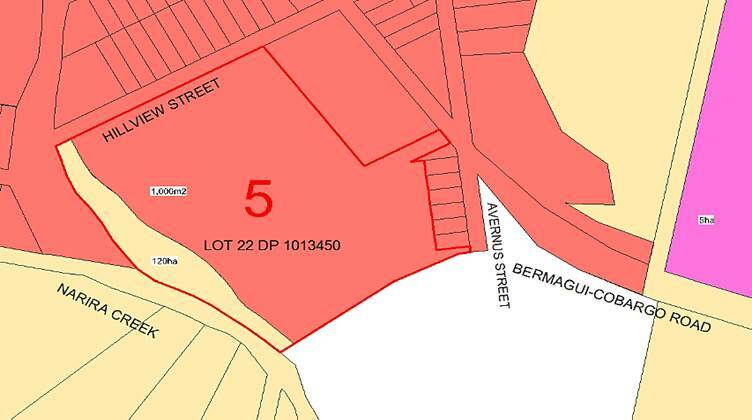 During this consultation, concerns were raised by the owners of the property immediately to the west of the former Cliff Place Cafe (Lot 8 DP 200008, 7 Beach Street) about the proposed rezoning and potential impacts if a unit development was constructed next door to them. The existing commercial zone enables development to the boundary and a height of 10m with shop-top housing, which is similar to the scale of the destroyed building. The B4 Mixed Use zone does permit multi-dwelling housing. Development of the land would be subject to a future Development Application and assessment in accordance with Council’s planning controls. This assessment would consider the amenity of any proposal, such as its bulk and scale, privacy, and overshadowing. 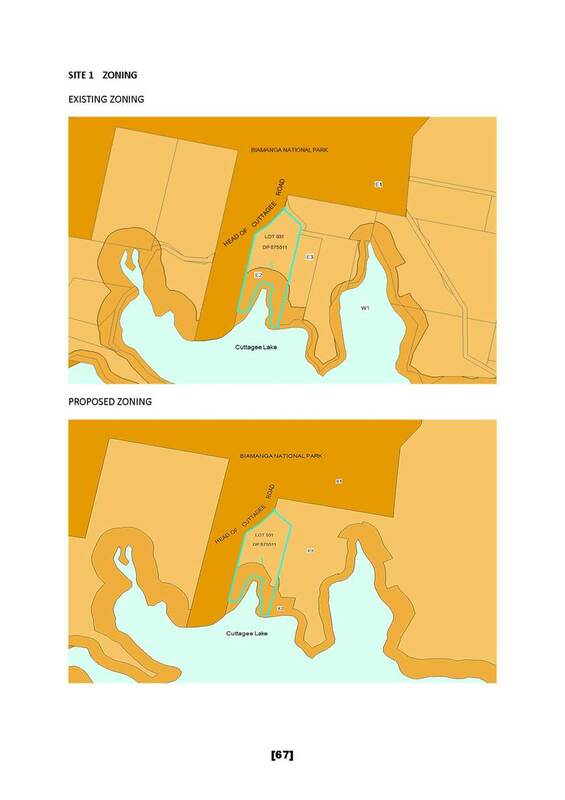 During the consultation process, a request was also received from neighbouring land owners on Seagrass Lane and Andy Poole Drive to include their properties within the PP. This request has been reviewed and is supported. 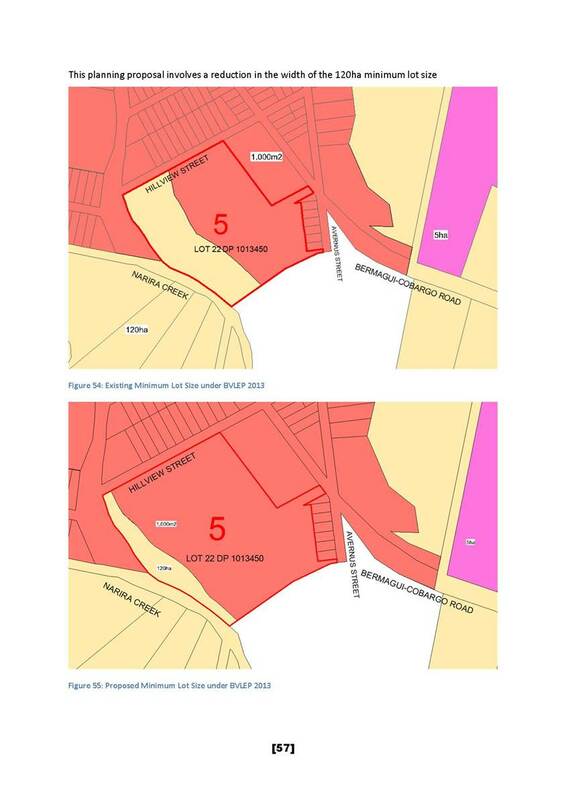 These properties have a current height limit of 10m which is not proposed to be amended. 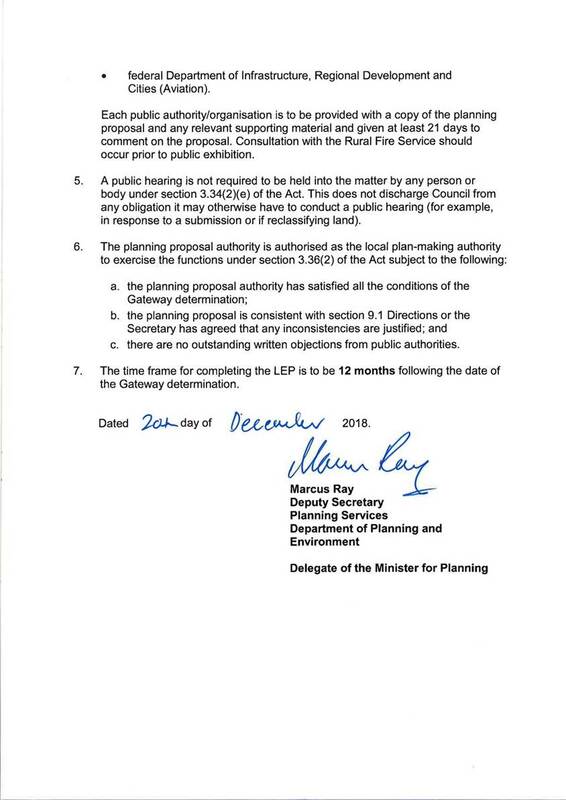 Should Gateway approval be issued by the Department of Planning and Environment, public consultation would be invited through public exhibition of the PP for a period of 28 days. 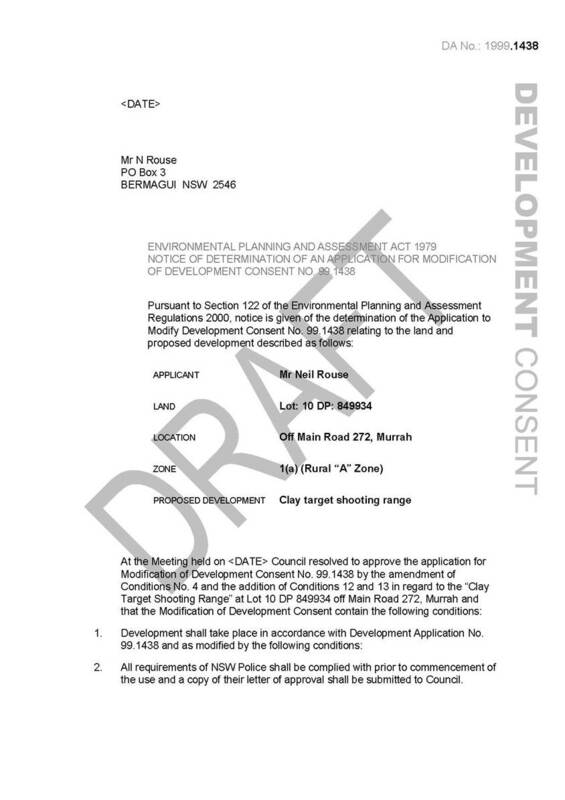 Council is in receipt of a Section 4.55 Application to Modify Development Consent 1999.1438, issued for a Clay Target Shooting Range. The application requests the opportunity to undertake an additional 12 shooting days per year for the purpose of safety training, including the flexibility to hold a State Shoot Event on one weekend throughout the year. 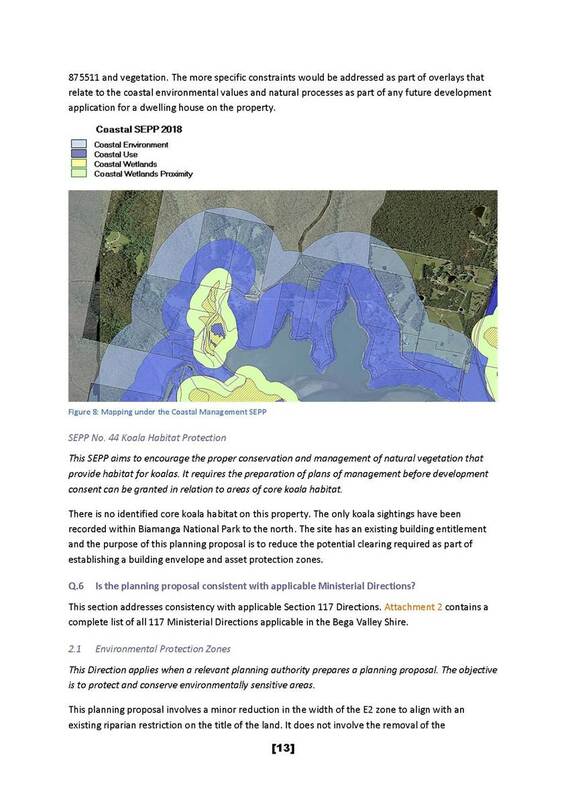 This Application is being reported to Council for determination as past Applications have previously been considered by Council and a total of 84 submissions have been received both supporting and objecting to the proposed modification. The Application for modification is recommended for approval, subject to the draft Modified Consent (provided as Attachment 4 to this report). 1. 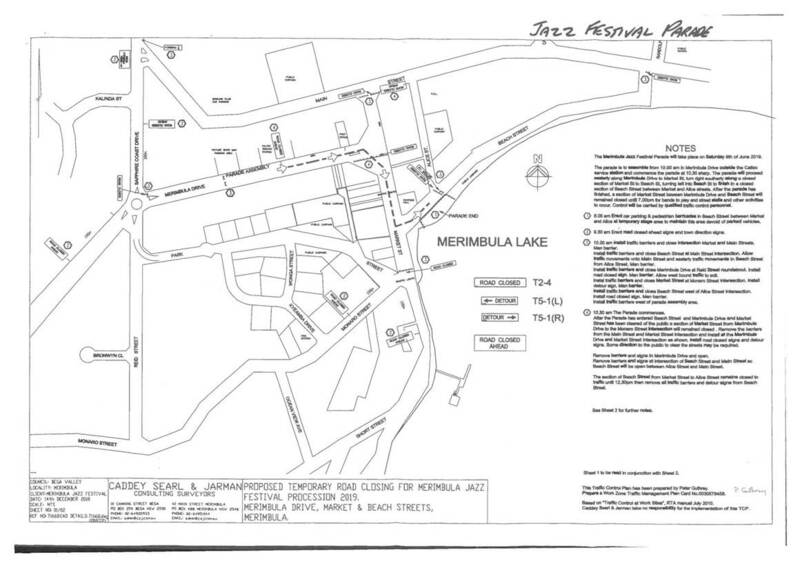 That the Section 4.55 Application to Modify Development Consent 1999.1438 for the Clay Target Shooting Range on Lot 101 DP 1172182, Murrah River Road, via Bermagui, be approved by amending Condition 4 and including additional Conditions 12 and 13; as detailed in Attachment 4 to this report. 2. That those persons who lodged a submission be notified of Council’s decision. 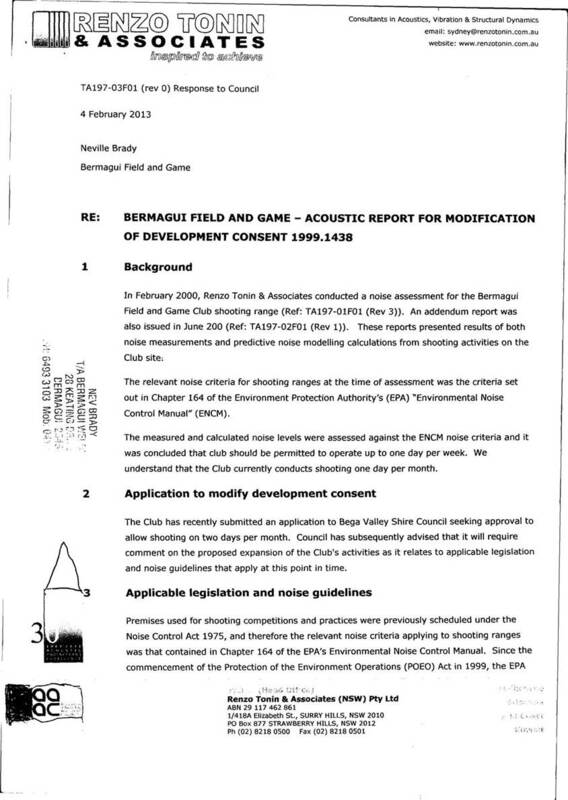 On 20 June 2017 Bermagui Field and Game lodged a Section 4.55 Application (formerly known as Section 96 Application) to modify Development Consent 1999.1438, seeking approval for an additional 12 shoot days per year of the purpose of safety and training, with provision for potentially holding a State Shoot Event. 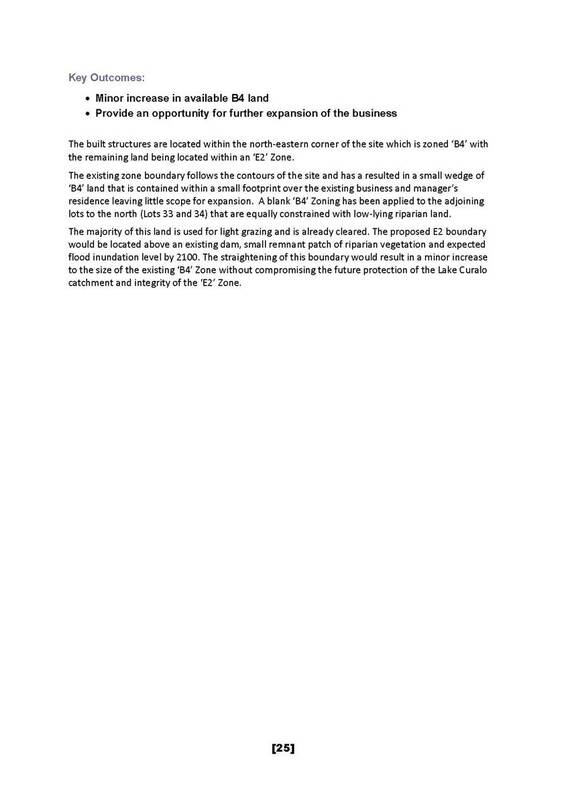 The Application was accompanied by an Acoustic Report by Renzo Tonin and Associates Pty Ltd, dated 4 February 2013. This report was lodged with a previous modification application to increase the number of shoot days and is still current. 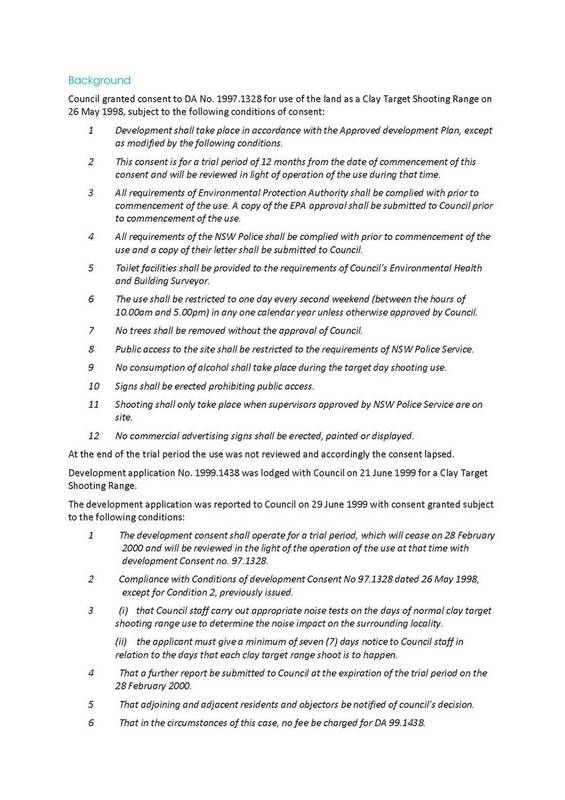 In support of the request, the applicant has submitted that the 12 additional shoot days, limited to one per month, would ensure owners of shotguns within the Bega Valley can safely and efficiently use their firearms. 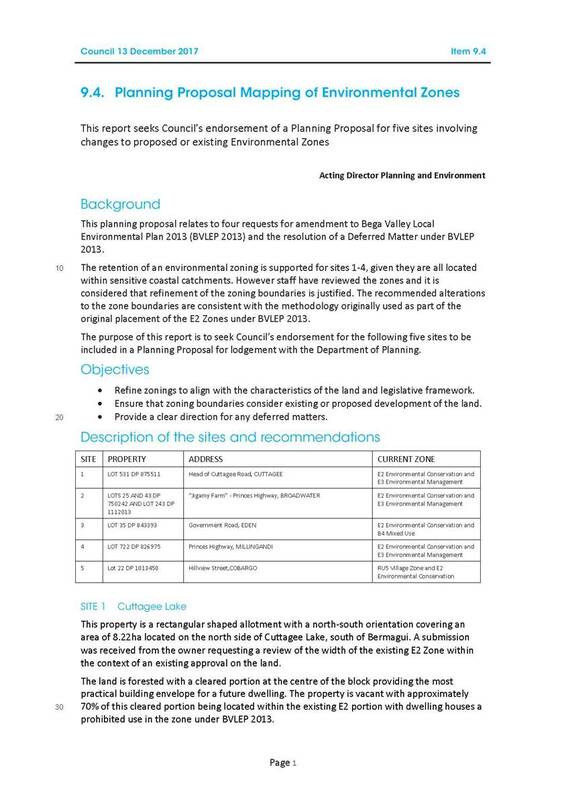 Council officers have assessed the information provided and are satisfied that an additional 12 shoot days would not adversely impact on the environment and that suitable mitigation measures can be included in a Modified Consent to ensure impacts on amenity can be adequately monitored and controlled. 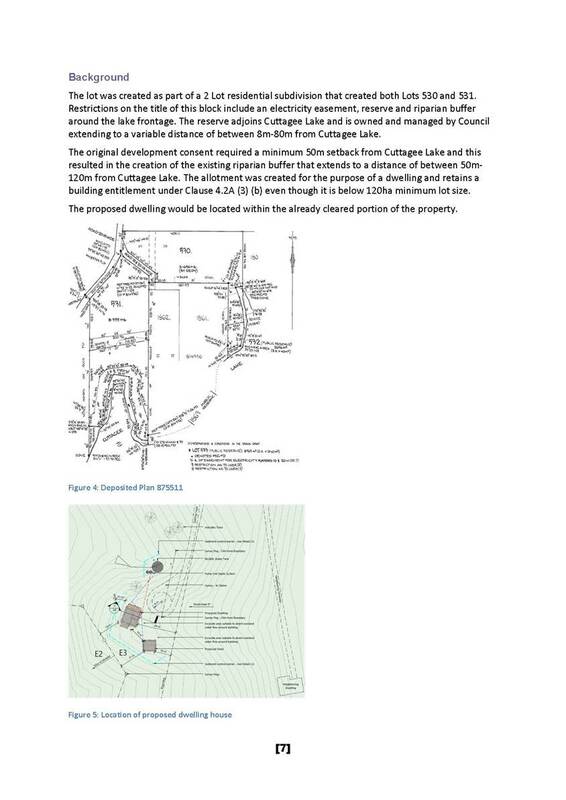 The development approved under Development Consent 1999.1438 is for the use of the site as a Clay Target Shooting Range for a maximum of 12 shoot days per year. The submitted Section 4.55 Application to Modify requests the opportunity to undertake an additional 12 shoot days per year for the purpose of safety and training, with the ability to also hold a State Shoot Event. If approved, the Modified Consent would allow for a maximum of 24 shoot days per year on a Sunday. A copy of the applicant’s justification for the modification is provided as Attachment 1 to this report. 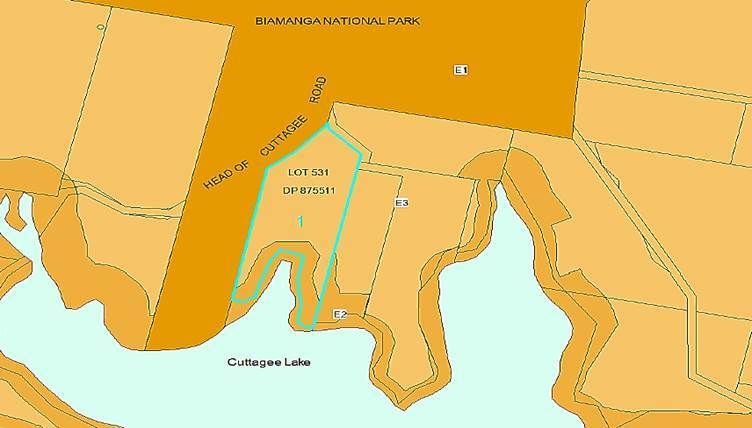 The site is described as Lot 101 DP 1172182 (formerly part of Lot 10 DP 849934) and is located approximately 10 kilometres south of Bermagui (Attachment 2). 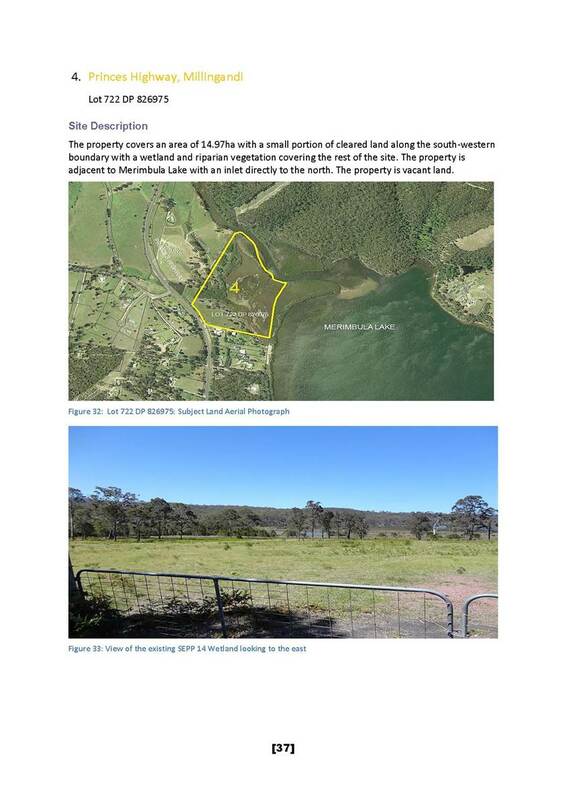 The site occupies an area of 24.6 hectares, is well vegetated and is accessed through Forestry Corporation of NSW land via Murrah River Road. The site is described as undulating with a small ridgeline traversing the site in a north-south direction. The site retains a number of free-standing structures including shipping containers that accommodate the storage needs of the Club. 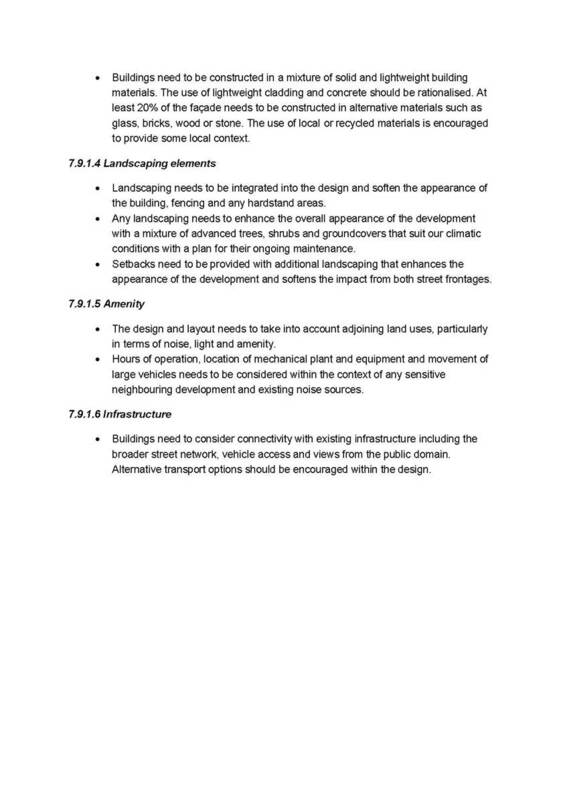 The land use has considerable development history, a summary of which is provided as Attachment 3. 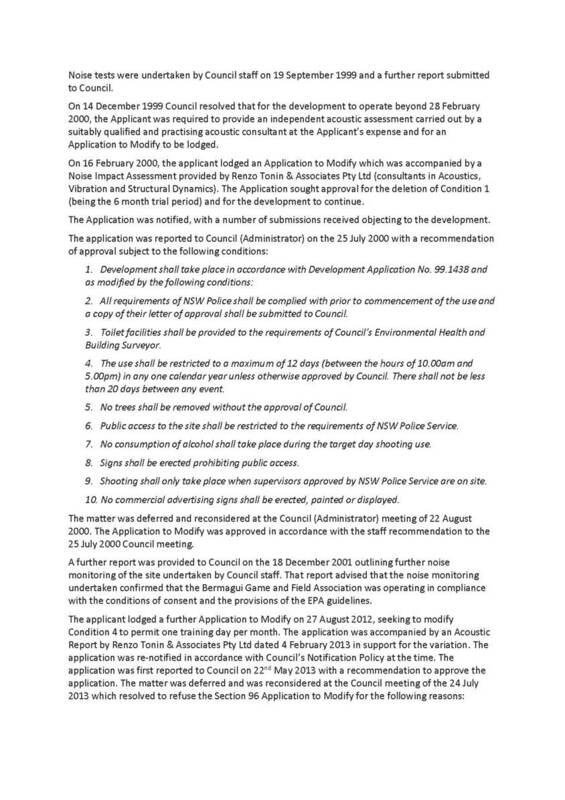 Council last considered this matter on 25 February 2015, in relation to the applicant’s request for a Review of Determination, after Council had refused the applicant’s Modification Application for an additional 12 shoot days per year (for training purposes). 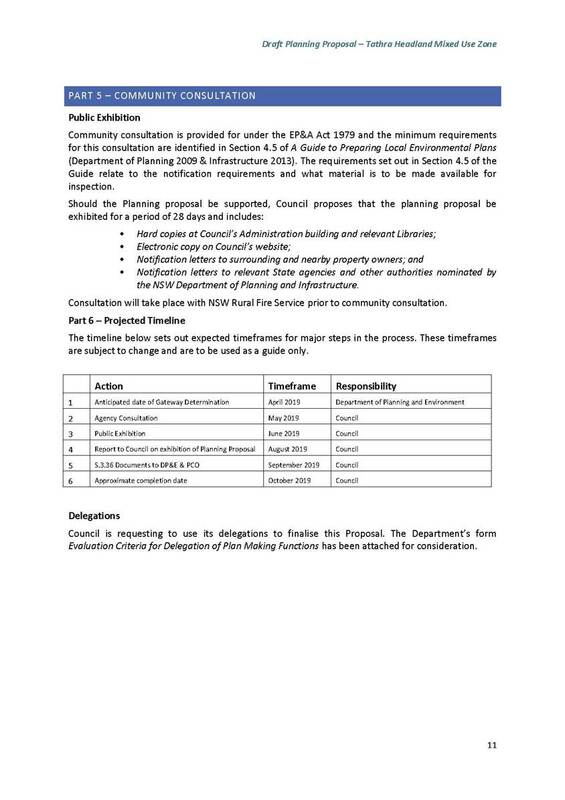 That on review, Council re-confirm the refusal of the modification to DA 199.438 in line with Item 8.3 of the meeting held on 24 July 2013, resolution number 7/13. 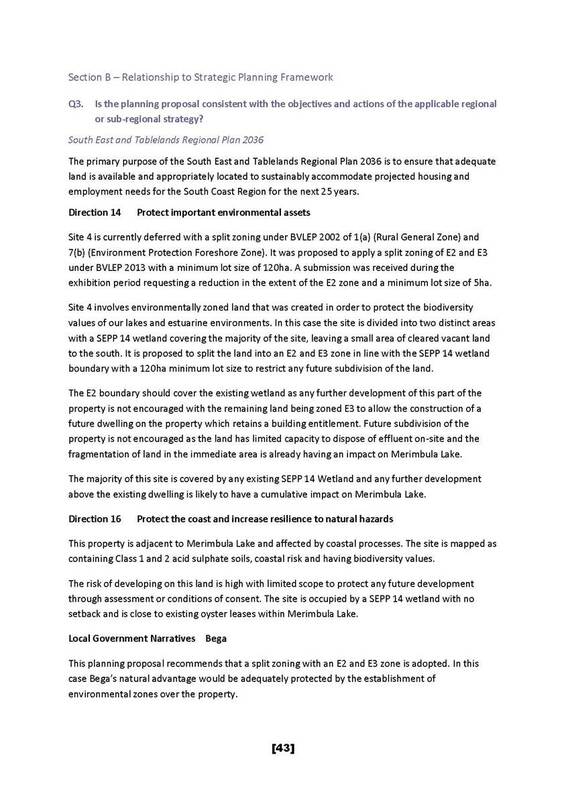 The proposal currently before Council has been assessed in accordance with the Matters for Consideration under Section 4.55 of the Environmental Planning and Assessment Act 1979. Council officers highlight the key issues of the proposal in this report for Council’s consideration. A copy of the assessing officer’s Section 4.55 assessment will be available at the meeting. 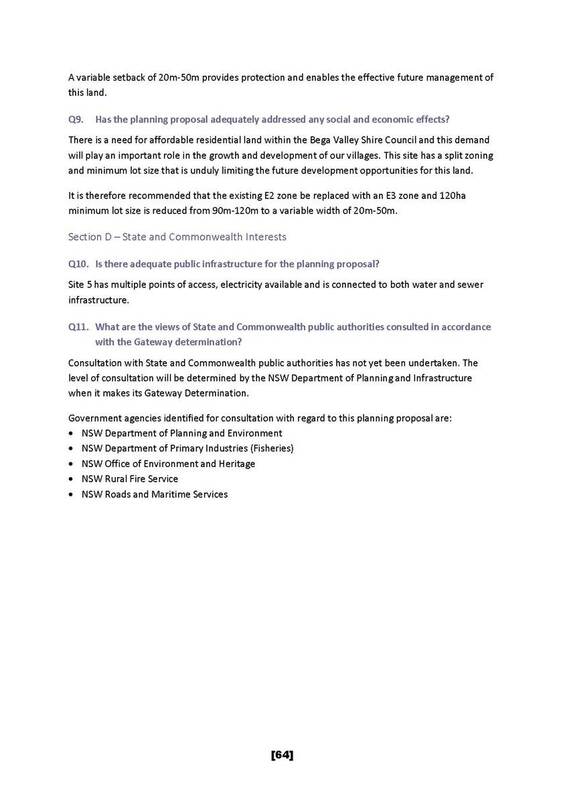 The land is zoned RU2 – Rural Landscape under Bega Valley Local Environmental Plan (BVLEP) 2013, with Recreation Facility (Outdoor) use permitted subject to Development Consent. 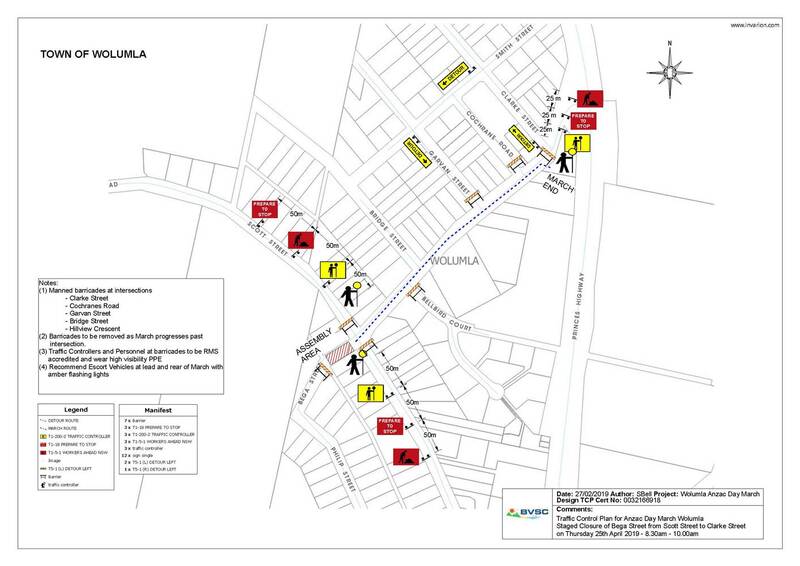 A review of the development in accordance with the aims and objectives of the RU2 zoning has been undertaken. 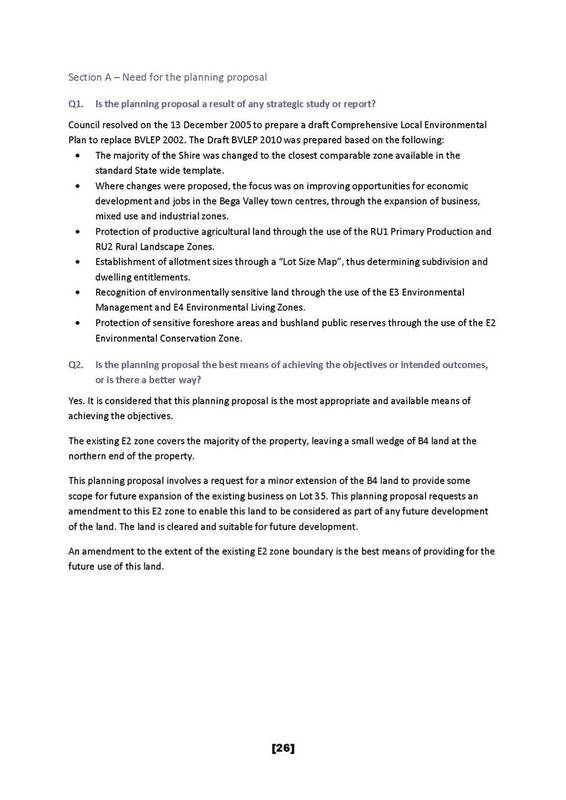 The assessment identified the proposed development would be consistent with the objectives of the zone, as well as other relevant clauses of the BVLEP 2013. The Section 4.55 Application to Modify was placed on public exhibition for a period of 14 days from 30 June 2017 to 14 July 2017. The extent of notification of this Application has been consistent with past applications submitted in respect to the development. A total of 84 submissions were received. Of those submissions, 43 objected to the proposal and 41 submissions supported the Application. Since the notification period closed, Council has received several further submissions objecting to the proposal and raising concerns about the current operations at the site. 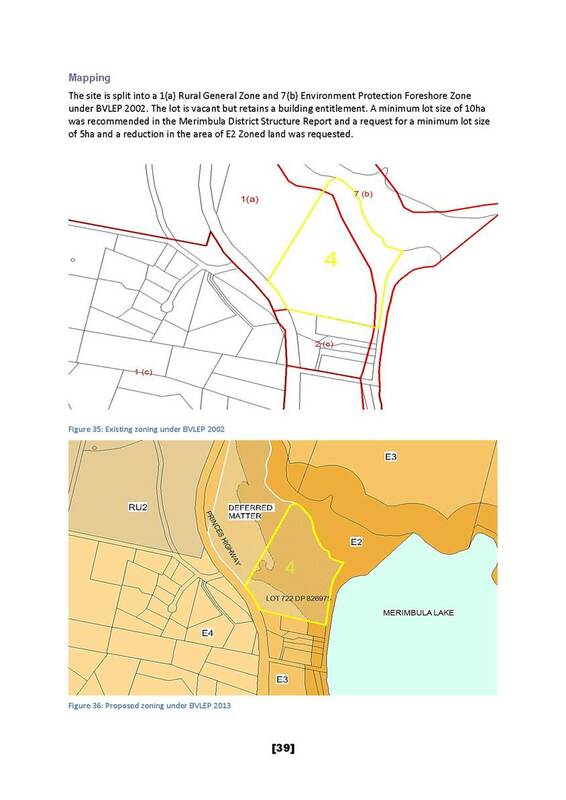 · Impact of noise on the operation of the Four Winds Festival site. 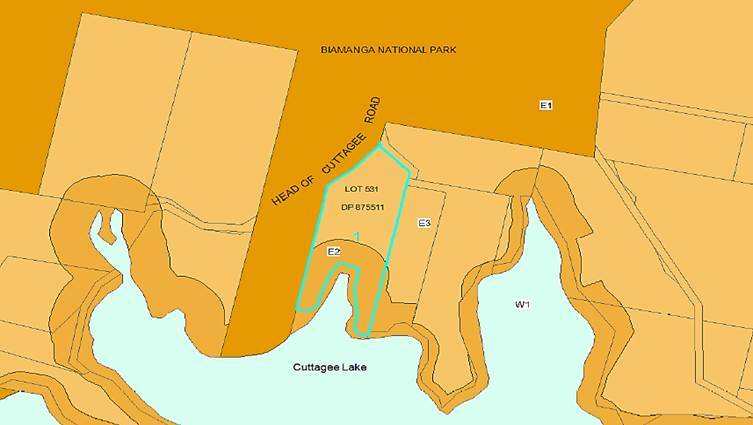 Since the determination of the original Development Application in 1999, there have been additional dwellings and tourist related accommodation approved and constructed within the Murrah and Barragga Bay areas. The impact of noise has previously been reviewed by Health and Building officers and Environmental officers. 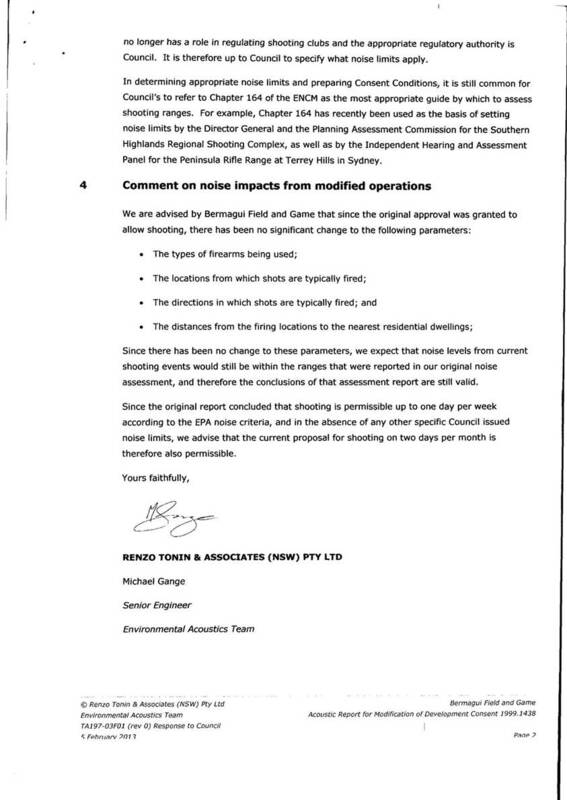 The noise assessment report by Renzo Tonin is the same report that was considered by Council and is still current. The following advice from Council officers is provided in relation to this issue. Weather conditions such as wind direction and temperature inversion can enhance noise levels experienced at receivers. It would be reasonable to conclude there would be greater impact on some receivers that might be downwind of the range and on days where there may be a temperature inversion and as such, noise produced may be more audible in a wider spread of locations. The criterion that has been used to assess the impact of noise relies on guidelines that are used across NSW. 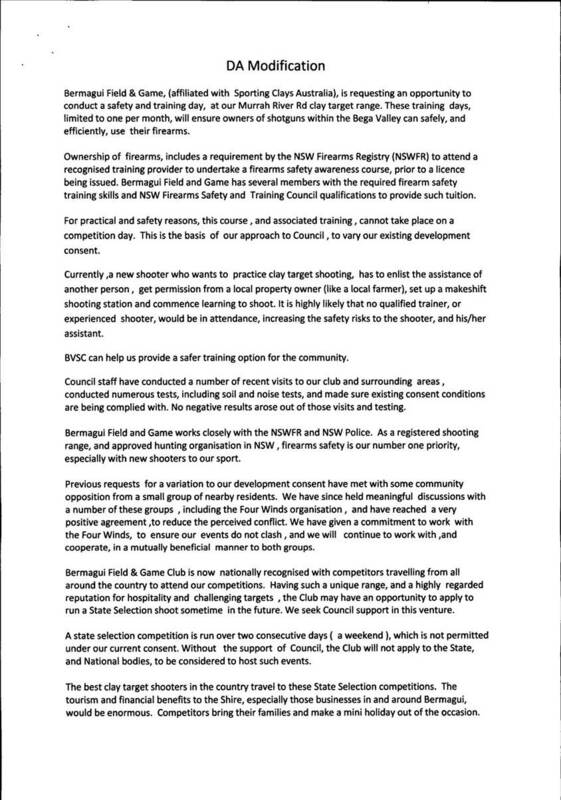 They recognise the general impact of noise and, dependant on peak noise, identify acceptable limitations for shooting ranges as previously specified in Council reports. Council officers have carried out noise monitoring during shooting days, in response to representation by concerned neighbours, with noise levels found to be within the acceptable range. “12. 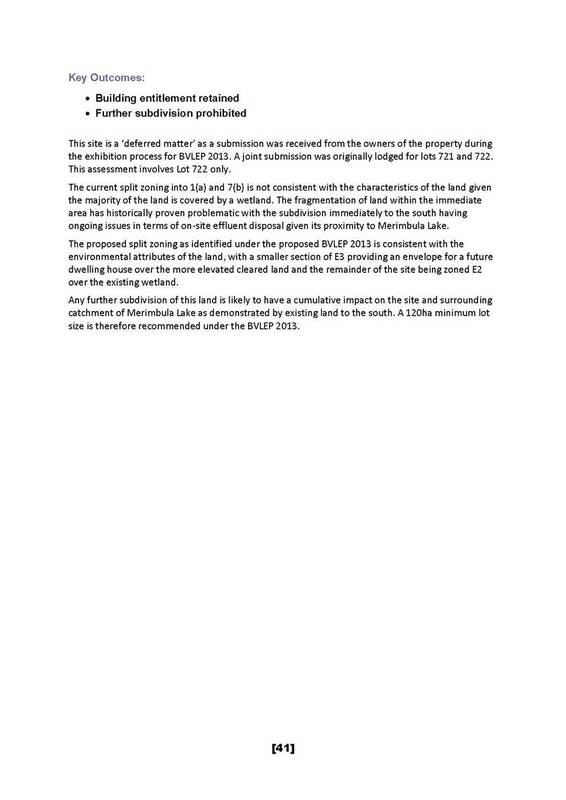 The applicant shall provide Council with a field assessment noise report from an acoustic consultant (not Council) that identifies that noise levels produced from the site do not exceed 90 dB (Lin) Peak Hold at the most affected properties. 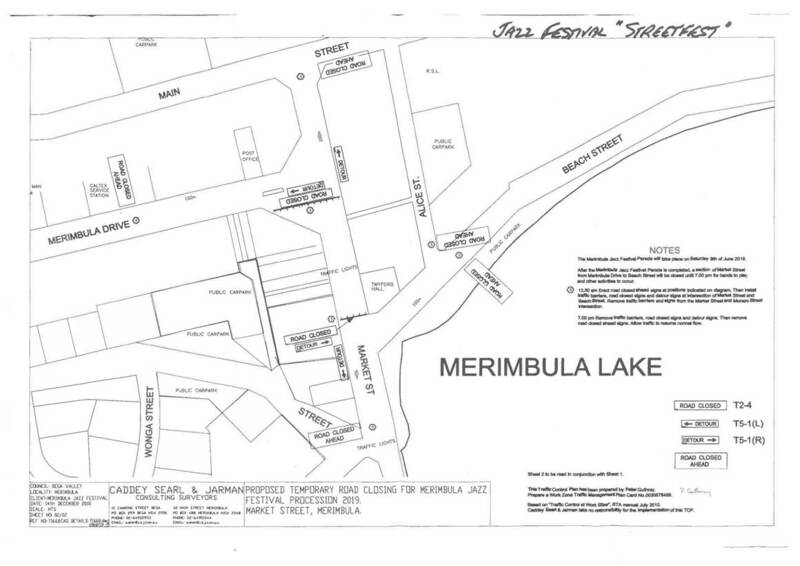 Measurements shall be taken from the 5 locations identified in the Renzo Tonin report dated 7 February 2000. 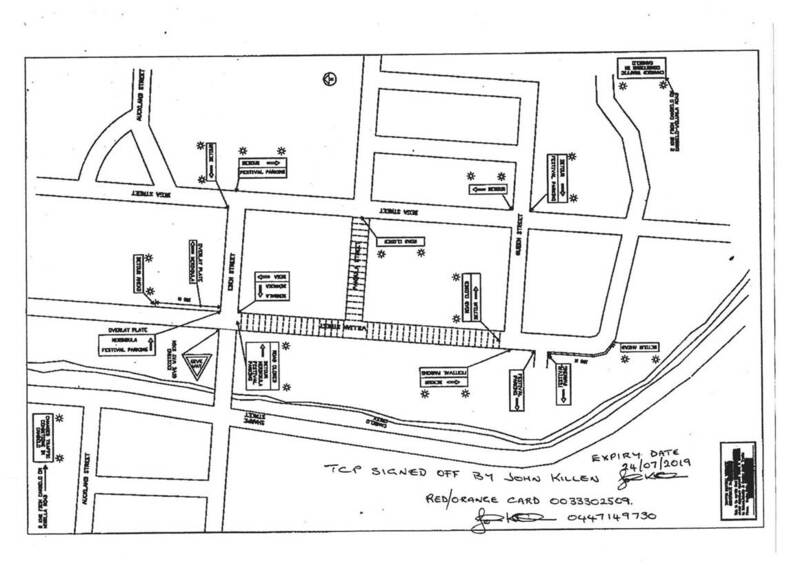 If a new dwelling has been erected between the site or those identified in the Renzo Tonin report, then those dwellings will be used for measurement purposes. The assessment shall be undertaken within three months from the time that the club commences an increased usage of the site in accordance with the approved modification and be undertaken having regard to seasonal wind directions. The Club shall notify Council two week in advance of the increased usage of the site. Various submissions raised concerns regarding the impacts of lead shot generated by the additional training days and potential State Shoot on the surrounding environment. This issue was also raised during the previous Application to Modify. “There should be no argument that the use of lead shot will contaminate the site and any future change of use will require careful assessment to identify the extent of impact and remediation. It is conceivable that the use of the site will remain for the foreseeable future as a shooting range. The assessment of the application has been undertaken in accordance with best practice guidelines available at the time of assessment, and this would provide justification for liability defence if that was necessary in the future. In any event the use of the range has existing consent and impacts associated with the additional use as proposed would have a minor bearing of any case to answer in respect to remediation and potential liability. 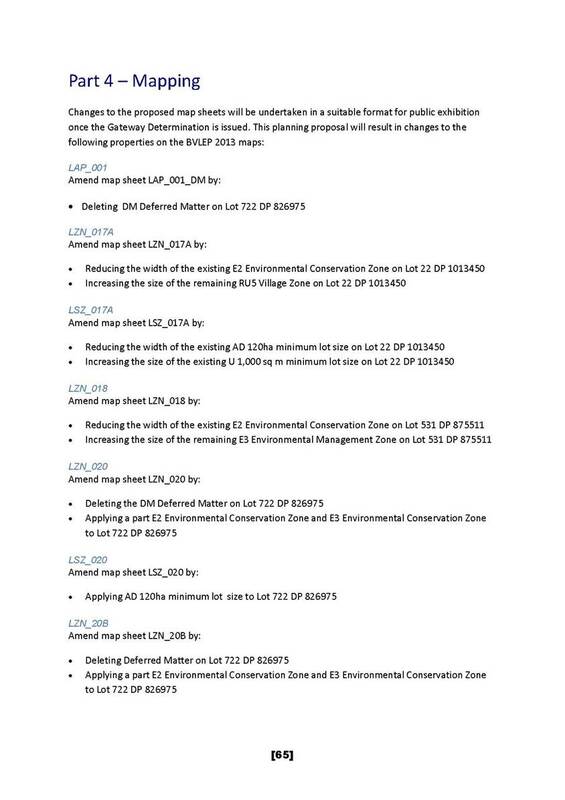 While there are no specific guidelines for consideration of impact of lead shot in these circumstances, advice received from the EPA on best practice suggests that carefully placed sediment fences will aid in limiting any off site migration of lead both in its solid form and impact of oxidation over time. It is also recognised that the topography and vegetation cover assists in the reduction of contamination runoff. The shooting range is confined to ridge locations that in rain events lessen the extent of overland water flow - there is no large catchment that can produce large water flows over the shooting areas. Undisturbed vegetation cover acts to retain and reduce rainfall flows across the site while providing cover to the lead shot as it settles into the ground cover. It is likely that this natural cover lessens the impact of oxidation. Officers have recently inspected the site and found the sediment fencing to be in place and there was no evidence of lead shot migration off the site. Officers will continue to inspect the site and ensure that all approved sedimentation fencing remains in place. Submissions received in support of the additional 12 shoot days cited positive impacts on the economy of the area as a result of additional visitors who would utilise accommodation, restaurants and other businesses in the area. Those submissions objecting to the additional 12 shoot days cited the negative impacts on the tourist-related businesses in the immediate area that have been developed based on the natural environment and the amenity it provides. These include noise impacts to tourist accommodation premises, the Mimosa Winery/Restaurant, the Four Winds venue and those visitors utilising nearby beaches and reserves. No additional information has been submitted by the applicant with regard to the economic impacts on surrounding businesses including tourist accommodation. Two submissions questioned whether there were opportunities to limit the training days outside peak tourist periods. The applicant has submitted they seek to work harmoniously with the adjoining developments and have requested flexibility in the shoot day to enable this to occur. The sound of gun shots will be heard within the surrounding area, which contains a number of tourist-related establishments, namely tourist accommodation businesses of Mimosa Winery/Restaurant and the Four Winds venue site. The impact would be limited to one additional day per month between the hours of 10am and 5pm, effectively doubling the number of shooting days at the site from 12 to 24 times per year. The issue of noise has been addressed above. 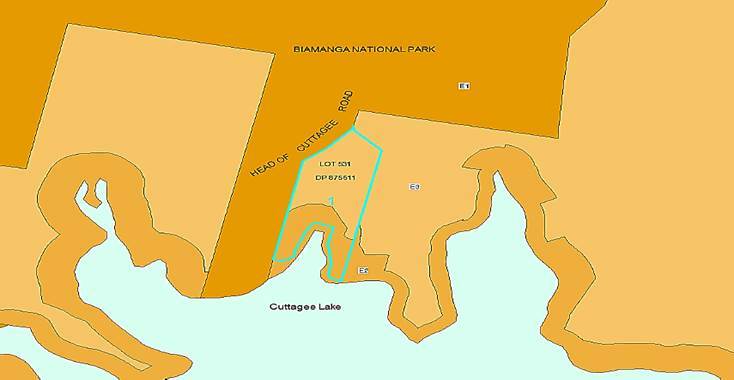 Several submissions raised concerns regarding impacts on the adjoining Bermagui Flora Reserve and potentially koalas. 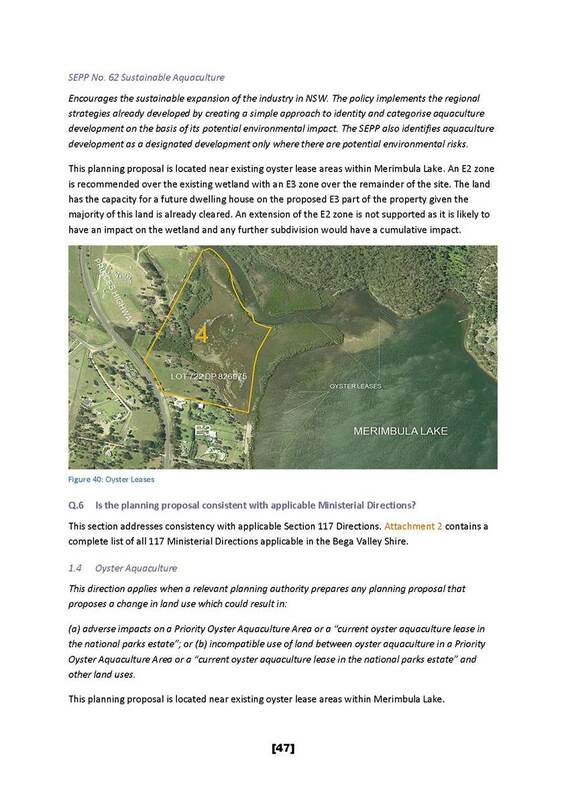 Since approval of the development, the adjoining 11,811 hectares of land to the west and north of the site have been designated as the Murrah Flora Reserves (established in March 2016). The Murrah Flora Reserves encompasses four areas including Murrah, Mumbulla, Bermagui and Tanja Flora Reserves, located between Bermagui and Tathra. The Reserves are habitat for the last significant koala population on the NSW South Coast. Other threatened species, such as the long-nosed potoroo, yellow-bellied glider and the powerful owl, also make their home here. 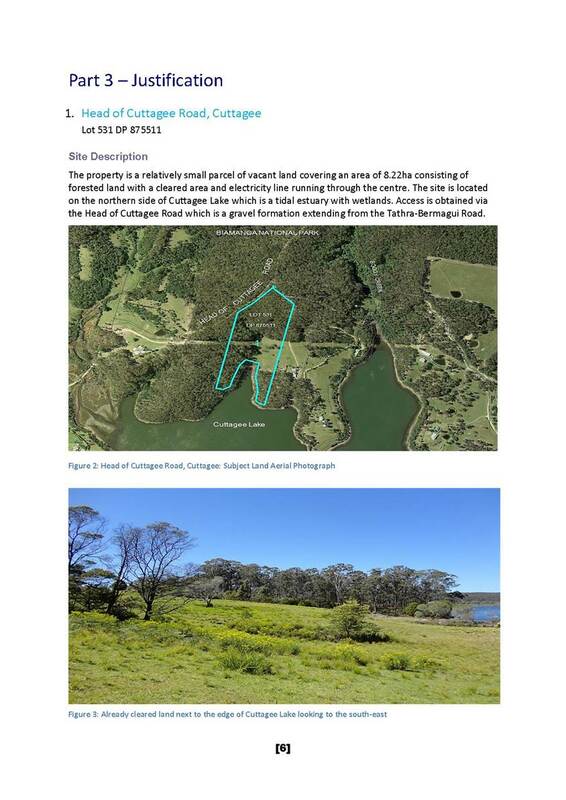 The lodgement of the original Development Application provided a flora and fauna assessment detailing the potential impacts of flora and fauna on the site. The Office of Environment and Heritage has advised the proposed additional training days do not require additional noise testing or threatened species assessments for koalas in the Murrah Flora Reserves. The applicant has advised that before every shoot, the shooting ground is visually inspected to make sure there were no koalas present on the day and this has been done on every occasion since their inaugural shoot. The applicant confirms that in the event koalas are present on the day of the shoot there are ample shoot stations around the site that can be moved to avoid certain locations whilst still accommodating the program of the day. Several submissions raised concerns in respect to the additional traffic along Murrah River Road beyond the section of road maintained by Council. These concerns were that additional traffic would result in additional wear and tear on that road and visitors to the Club do not slow down on this road. Murrah River Forest River is a state forest road. 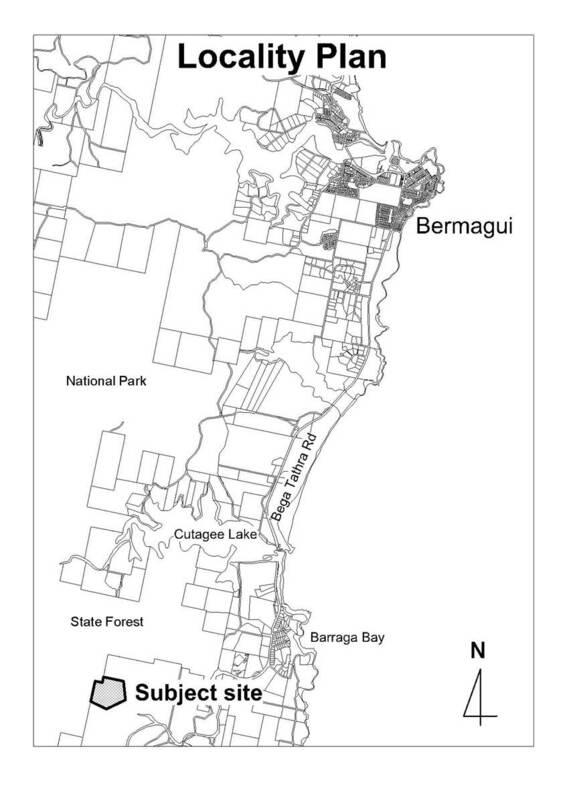 Council only grades the first (approximately) 100 metres of the gravel section of Murrah River Forest Road (with the intersection with Tathra-Bermagui Road being bitumen sealed). 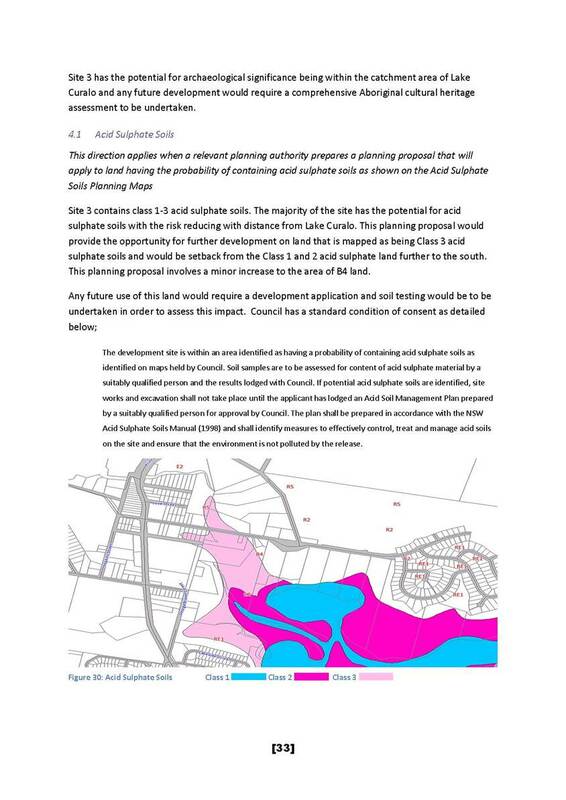 The applicant has previously engaged Council to grade the road when required to maintain adequate access to the site. 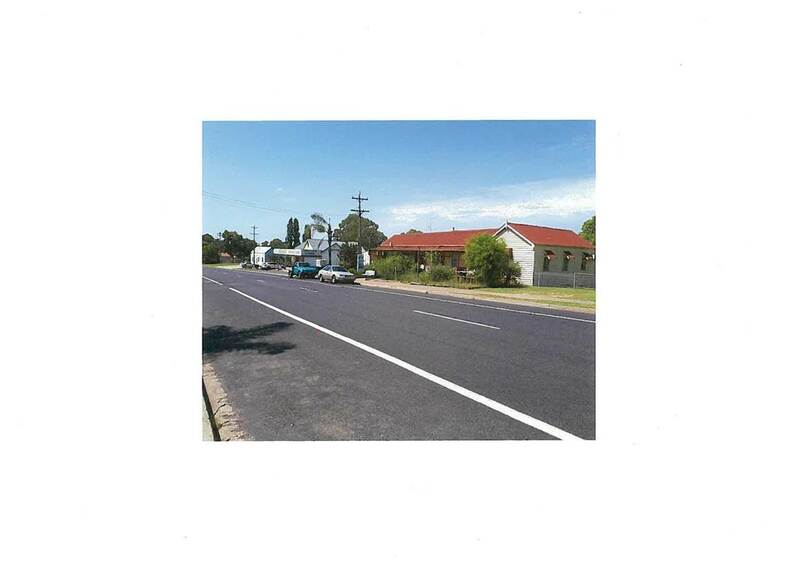 The standard of the road has been reviewed by Council’s Development Engineer who advised the standard of construction and level of maintenance is adequate for the proposed use. A review of the Section 4.55 Application to Modify highlighted that the additional training days are to permit new members to learn and undertake gun safety. 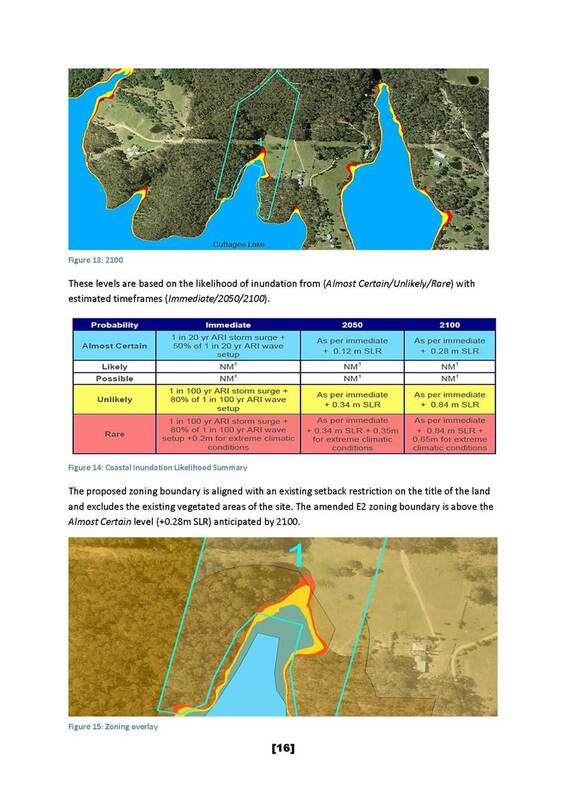 Given the site’s location within a bushfire prone area, it is recommended an additional condition (Condition 13 in Attachment 4) be applied requiring an emergency and evacuation plan to be formulated to comply with Section 4.2.7 of Planning for Bushfire Protection 2006. 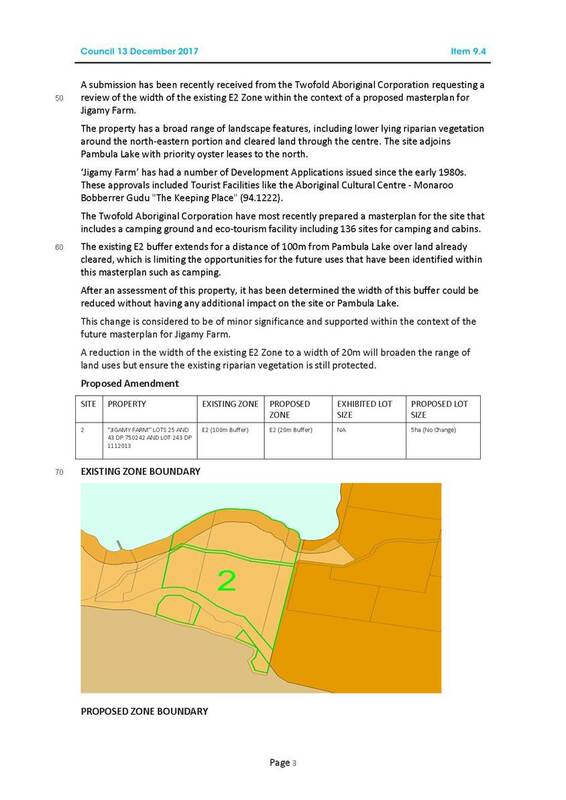 This report seeks to finalise the draft planning proposal for minor amendments to Environmental Zones on four properties. 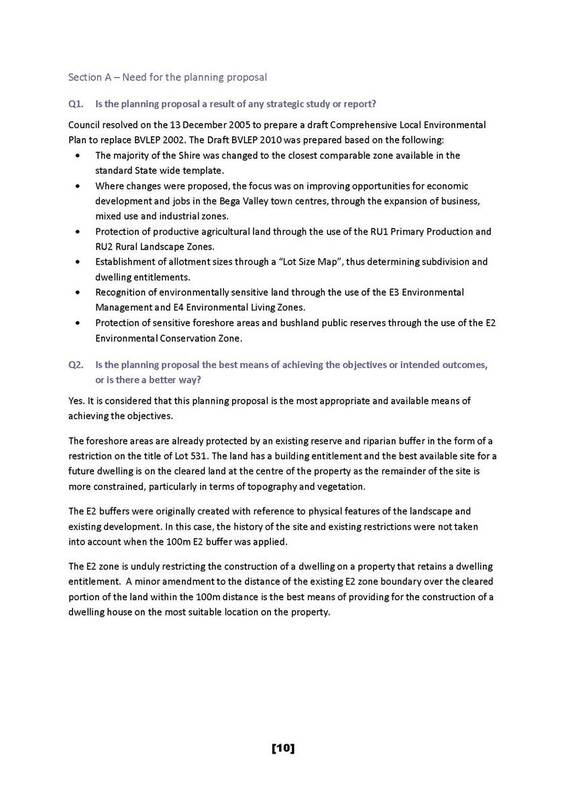 Council at its meeting held on 13 December 2017 considered a report outlining minor amendments to existing environmental zones within Bega Valley Shire. 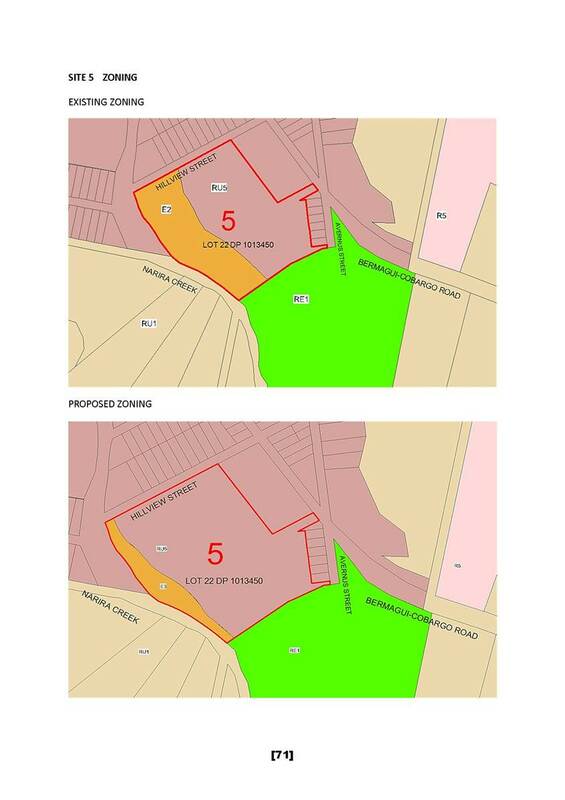 At this meeting Council resolved to support a planning proposal to resolve zoning and minimum lot sizes for one property and make minor adjustments to existing environmental zone boundaries for four other properties. 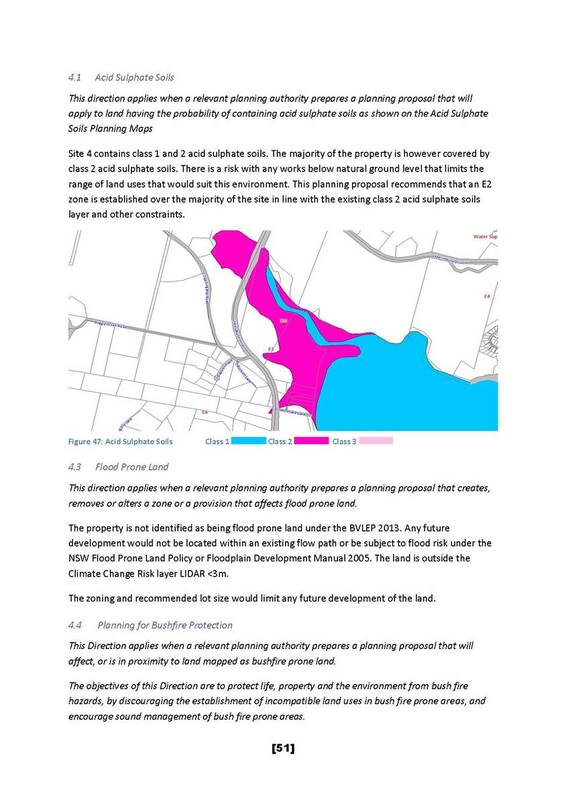 The planning proposal was submitted to the NSW Department of Planning and Environment on 3 January 2018. 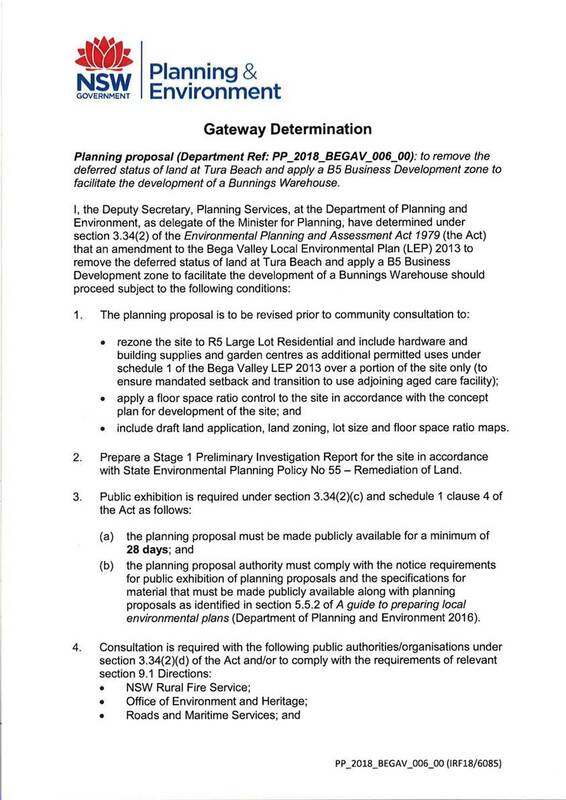 A Gateway Determination was issued on 7 May 2018, subject to the planning proposal being publicly exhibited for a period of 28 days and consultation with public authorities. 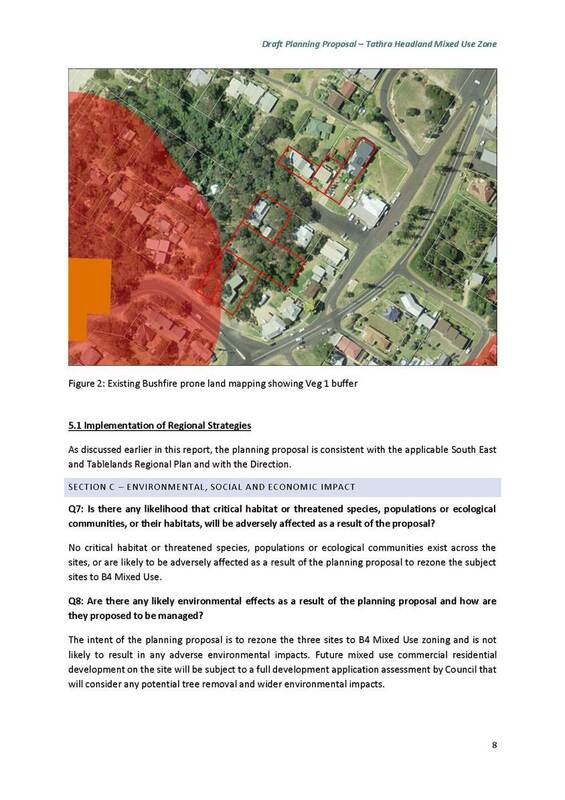 Objections were received from the NSW Office of Environment and Heritage (OEH). 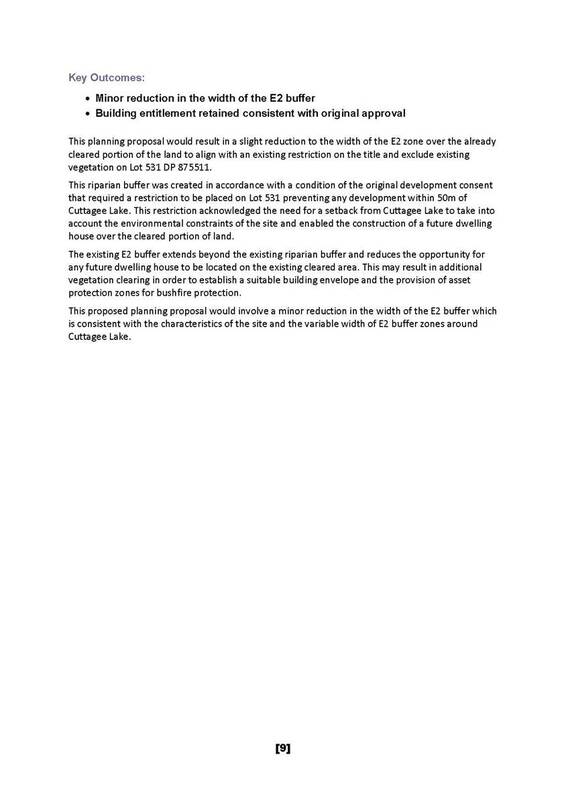 These objections have now been resolved and Council officers recommend Council proceed to finalise the planning proposal subject to the amendments outlined in this report, which include removal of Site 2 from the planning proposal. 1. 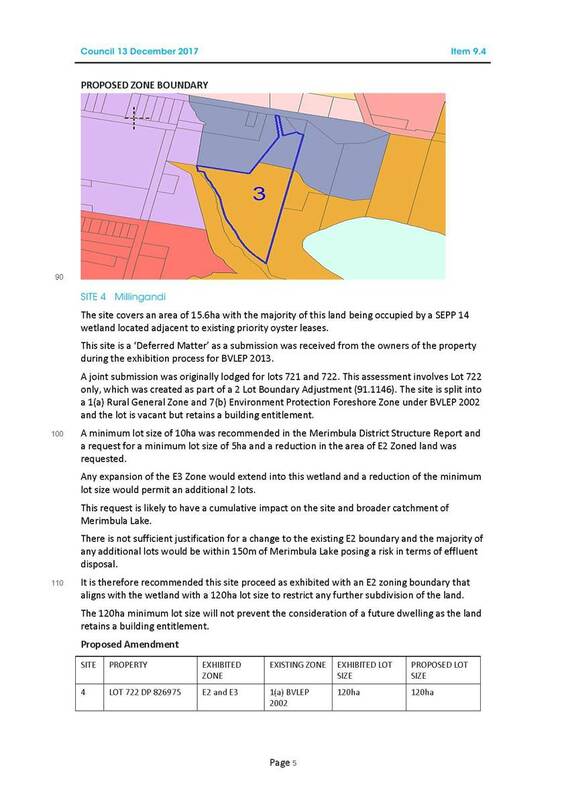 That Council resolve to adopt the recommendations for Sites 1-5 as identified in Attachment 2 to this report. 2. 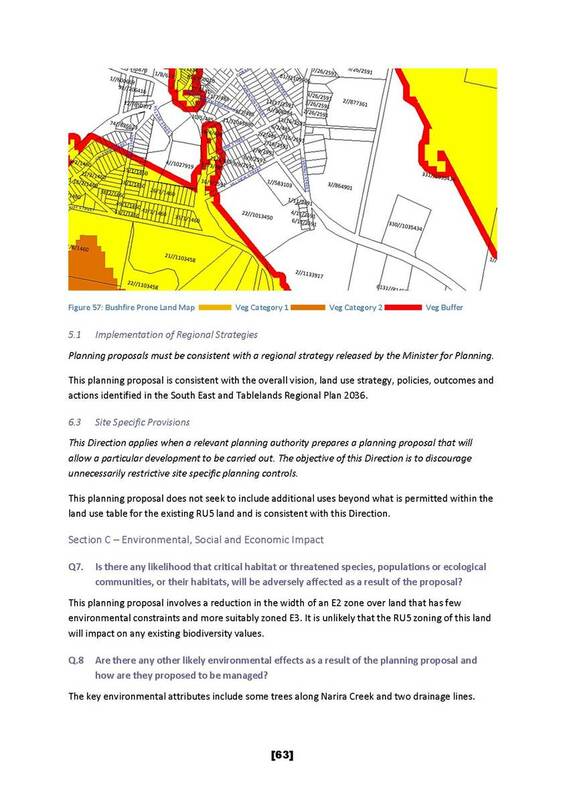 That Council officers be authorised to forward this Planning Proposal for Mapping of Environmental Zones to the Department of Planning for Gateway Determination in accordance with the recommendations contained within this report. 3. That following Gateway Determination, the Planning Proposal is placed on public exhibition and following the exhibition period, a further report be submitted to Council summarising the submissions received during the exhibition period. 4. 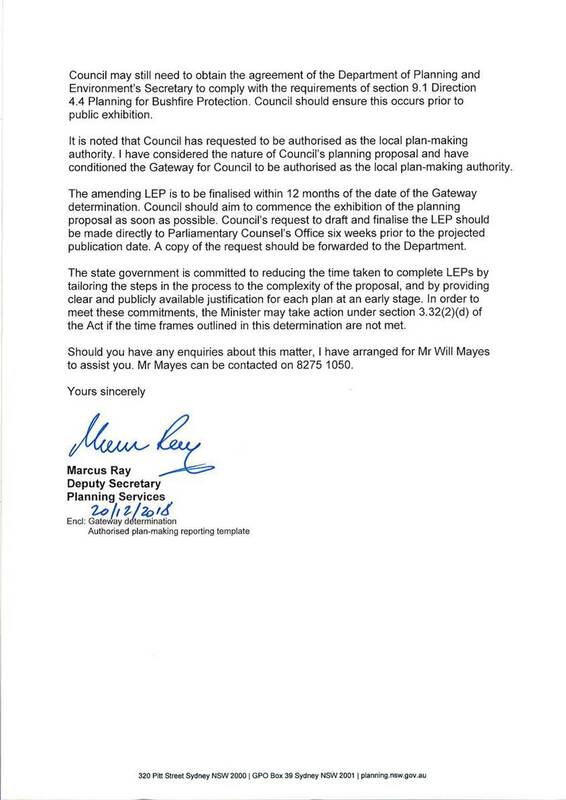 That should no submissions be received during the exhibition period officers progress the Planning Proposal to finalisation and gazettal without a further report to Council. 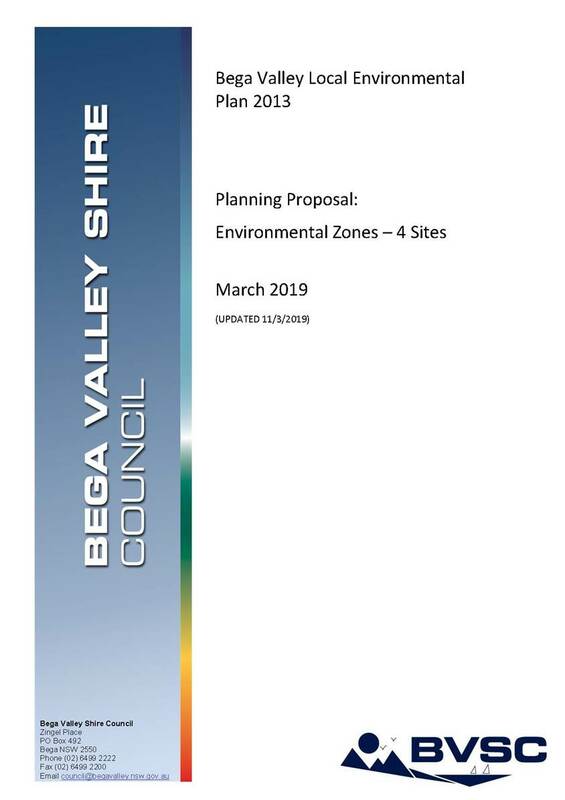 It should be noted that Site 4 is a deferred matter under Bega Valley Local Environmental Plan 2013 (BVLEP 2013) while Sites 1, 2, 3 and 5 are zoned under Bega Valley Local Environmental Plan (BVLEP) 2013. 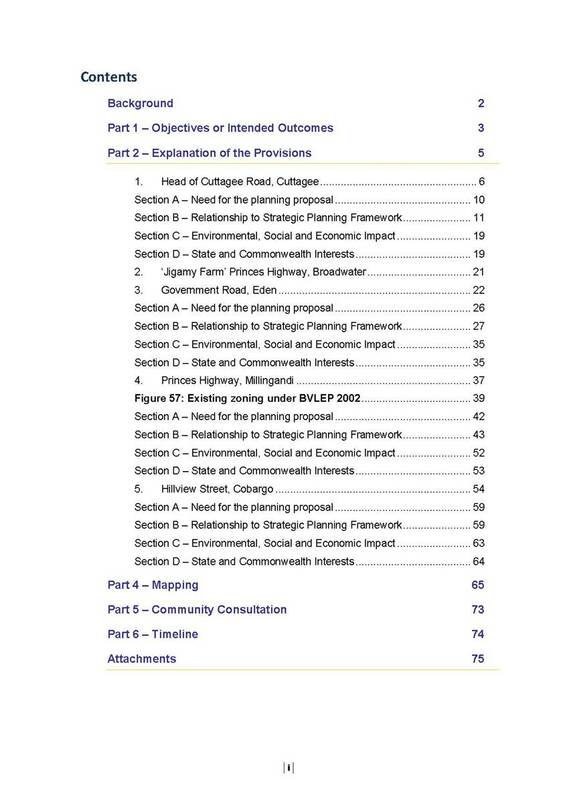 This report summarises the consultation undertaken and agency submissions. 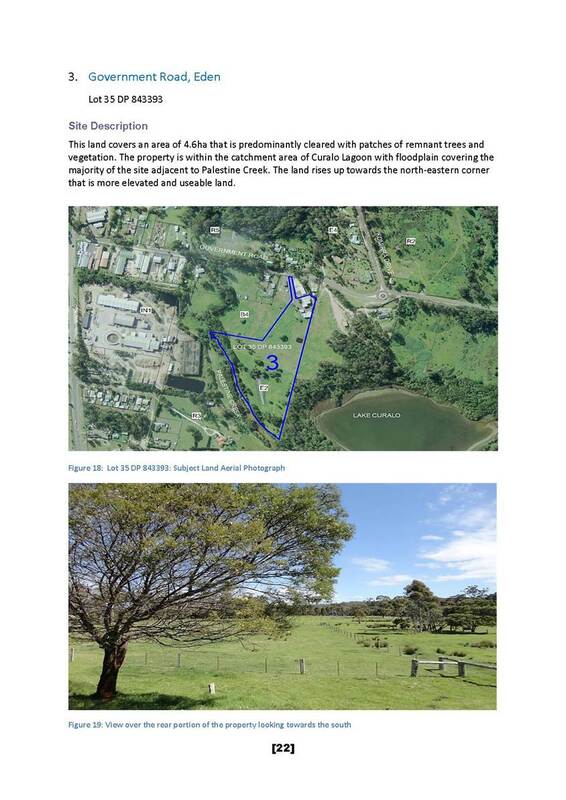 Site 2 has been removed from the planning proposal after discussions with OEH and the Twofold Aboriginal Corporation who manage Jigamy Farm. 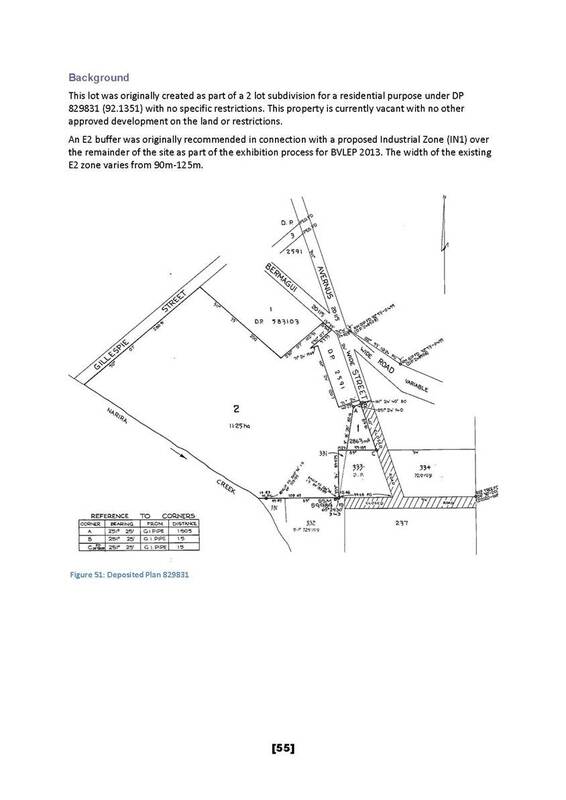 The owners are currently preparing a masterplan for the property and have determined the rezoning is no longer necessary, as the proposed uses can be undertaken under Schedule 1 of the BVLEP 2013. 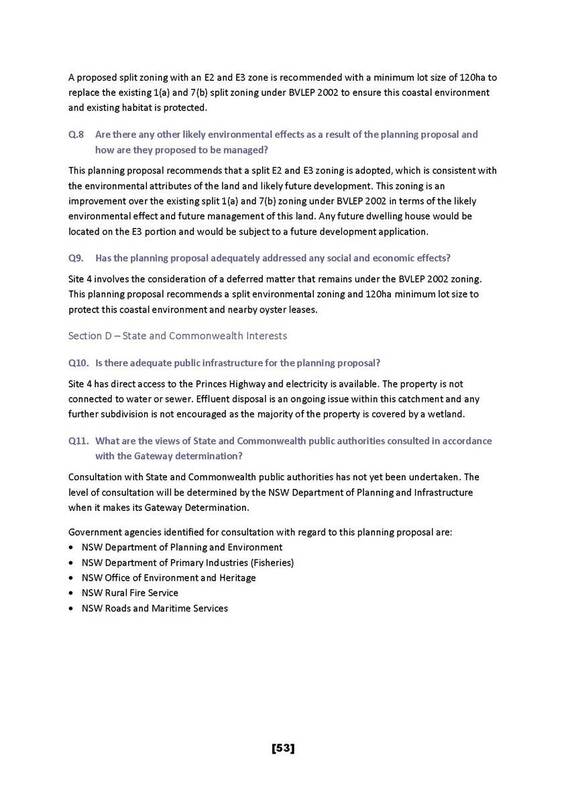 The planning proposal was exhibited for a period of 28 days from 23 July 2018 until 24 August 2018, with no submissions received from the public. Referrals were sent to the NSW Department of Primary Industries, NSW Rural Fire Service and OEH. No comment was received during the referral timeframe or through subsequent invitations to make comment on the planning proposal. No comment was received during the referral timeframe. 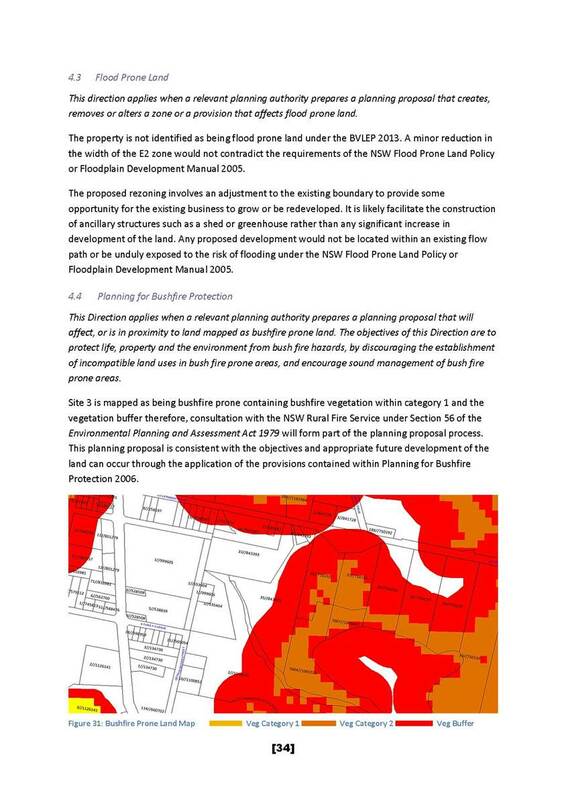 Advice was received through subsequent requests confirming the NSW Rural Fire Service did not object to the planning proposal subject to any future subdivision or dwelling applications complying with the relevant bushfire legislation and guidelines. 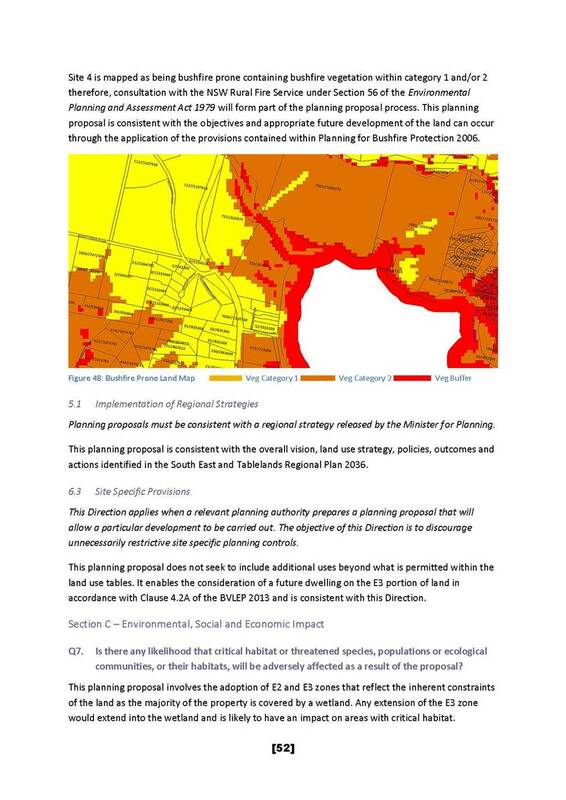 OEH initially objected to the planning proposal and requested additional information concerning flooding, coastal risk and cultural heritage to support each of the proposed sites. 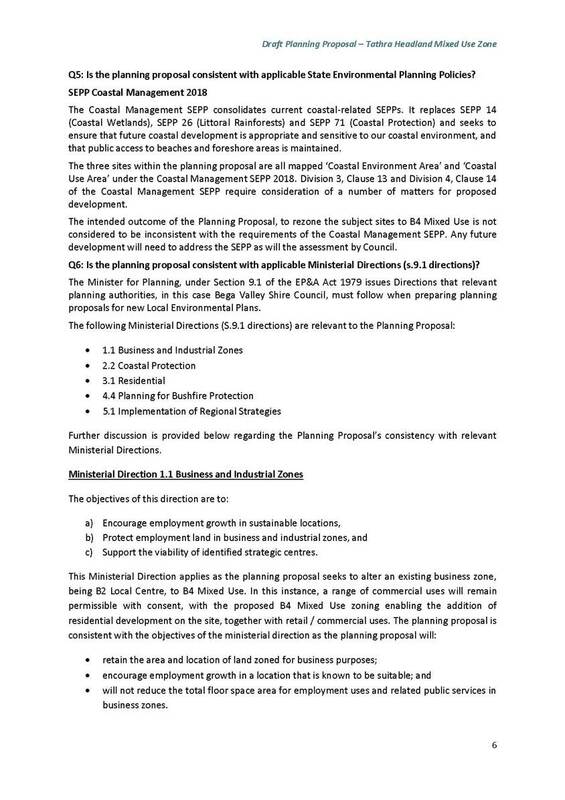 Additional coastal risk mapping and assessment has been undertaken to justify each of the proposed sites and a meeting arranged with OEH staff to review each of the sites with the following outcomes. 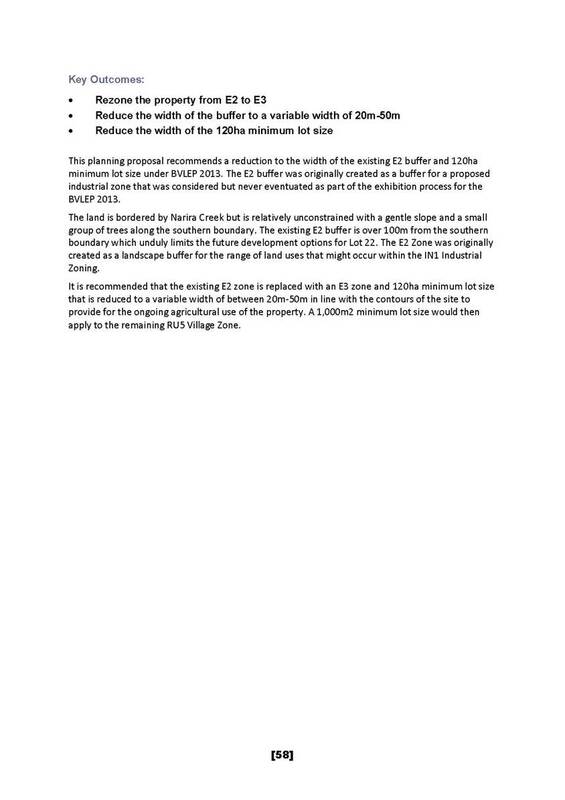 The planning proposal recommended a minor reduction in the existing E2 Environmental Conservation buffer to retain the building entitlement consistent with an existing approval on a portion of the site that is already cleared. The primary concern for OEH is the potential for vegetation loss within the E2 Environmental Conservation Zone. 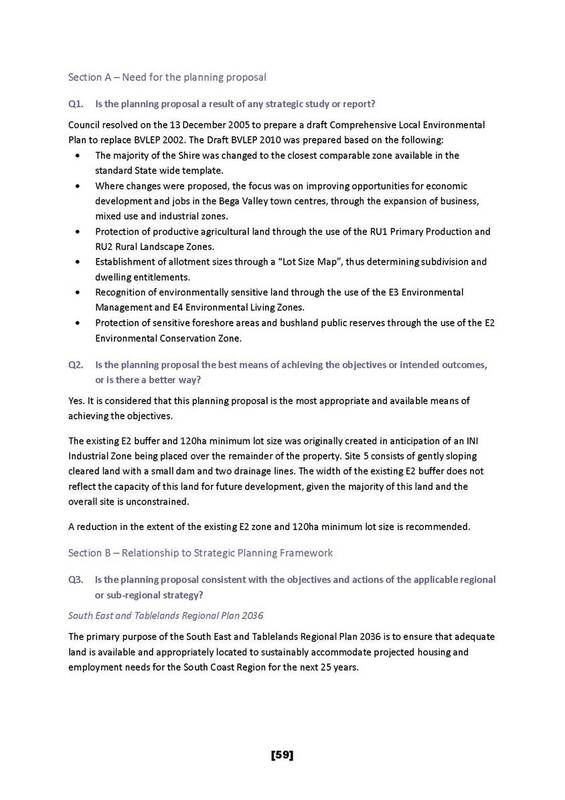 Outcome: The proposed E2 Environmental Conservation zone boundary exhibited in the planning proposal has been amended to preserve the 100m buffer over existing vegetation and ensure that future devleopment is contained within the already cleared portion of the land. Further consultation has been undertaken with the owner who has confirmed support for these minor changes. The planning proposal recommended a slight adjustment between the E2 Environmental Conservation and B4 Mixed Use boundary. 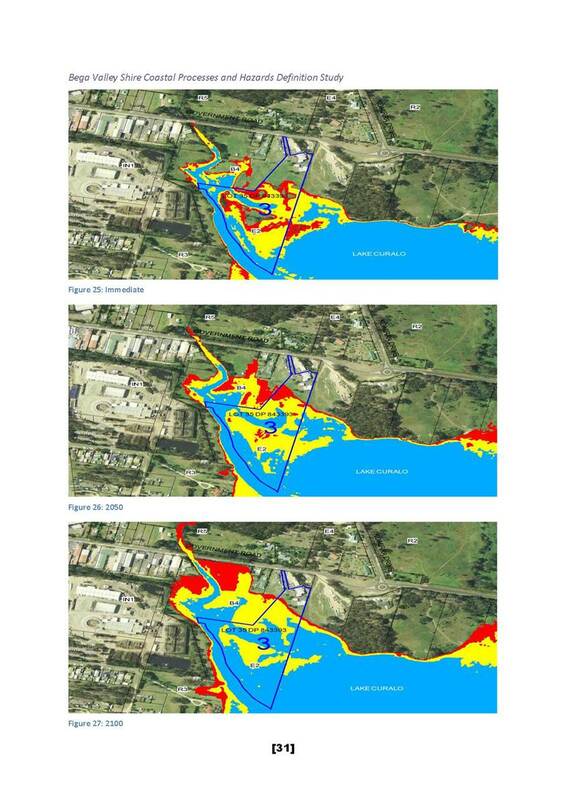 The main concern for OEH was the potential inundation of the site. Additional assessment has been provided under Direction 4.3 - Flood Prone Land of the Environmental Planning and Assessment Act 1997 (EPA) and the implications of coastal hazards. 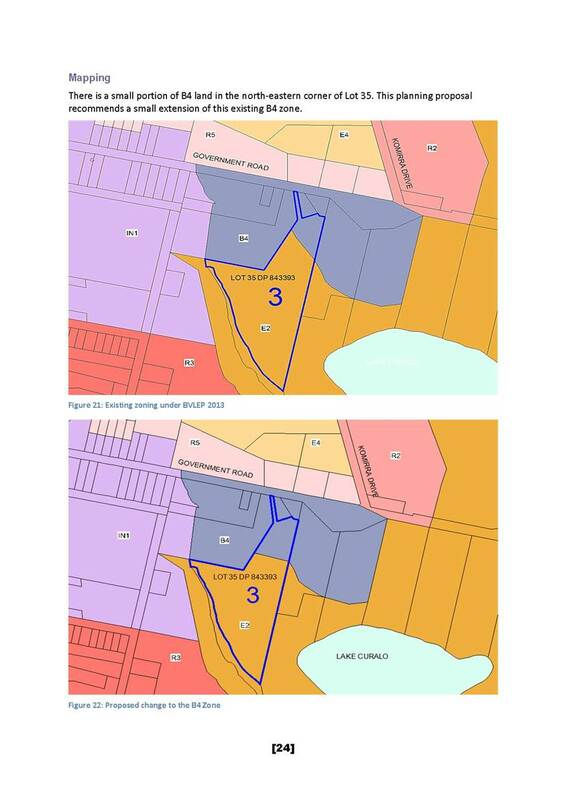 Outcome: The proposed E2 Environmental Conservation zone boundary has been slightly refined in line with the anticipated flood inundation level in 2100. 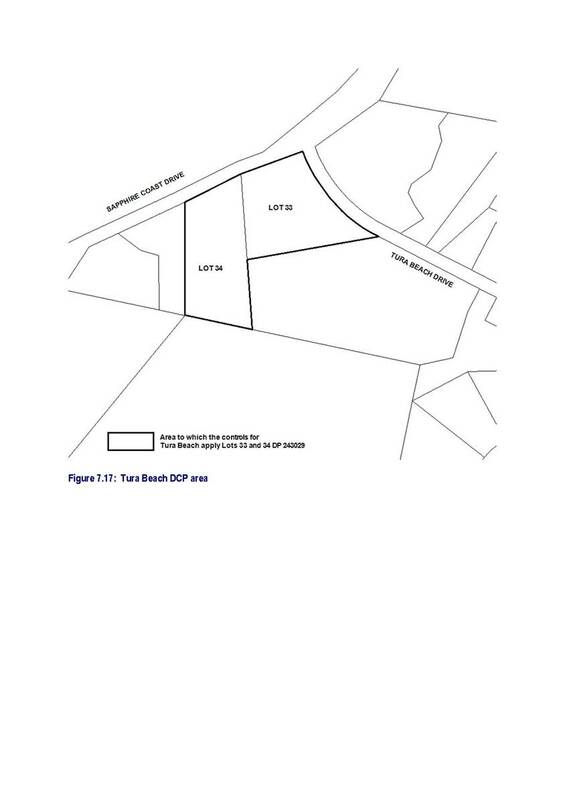 This site is deferred from BVLEP 2013 and the planning proposal recommended the land be zoned a combination of E3 Environmental Management and E2 Environmental Conservation to enable the building entitlement to be retained within the E3 zone and restrict further subdivision of the land. 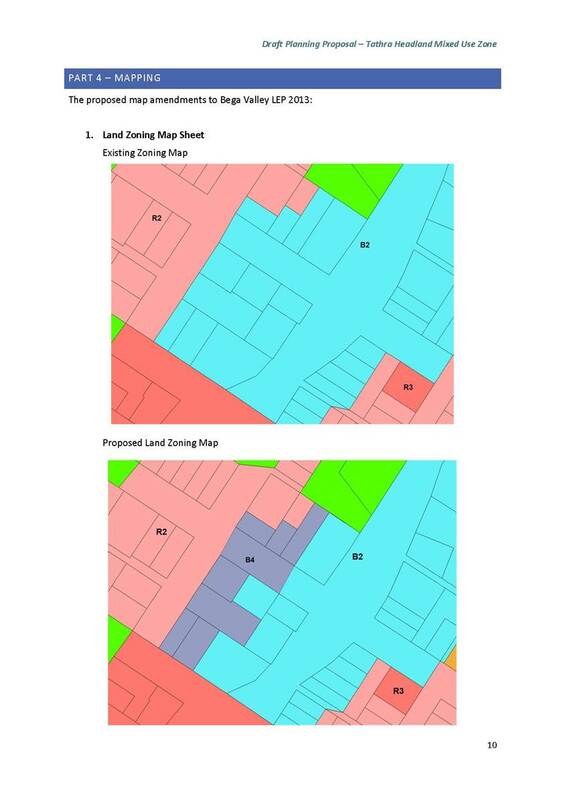 The main concern for OEH was the alignment of the zoning boundary with the inherent constraints of the property. An assessment has been made in accordance with the Coastal Management Framework and additional assessment has been provided under Direction 4.3 - Flood Prone Land. 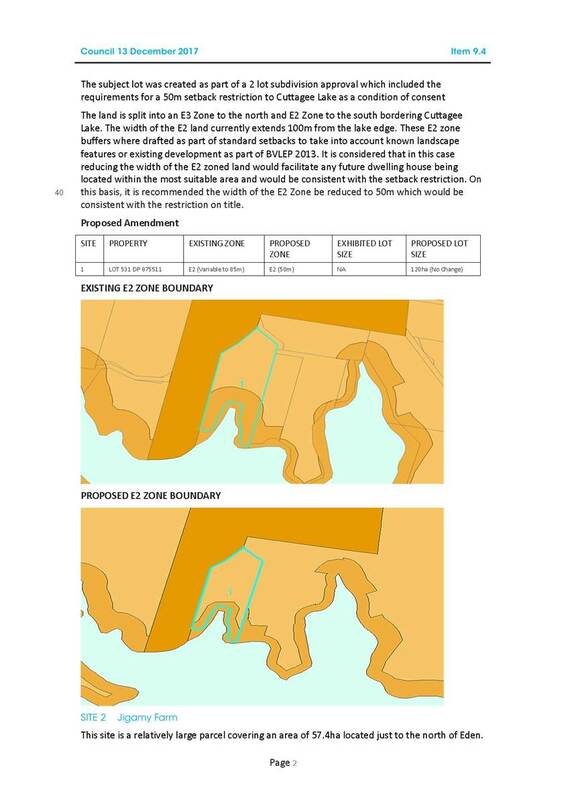 Outcome: The proposed E2 Environmental Conservation Zone boundary has been slightly refined in line with the anticipated flood inundation level in 2100 and existing wetland extent. 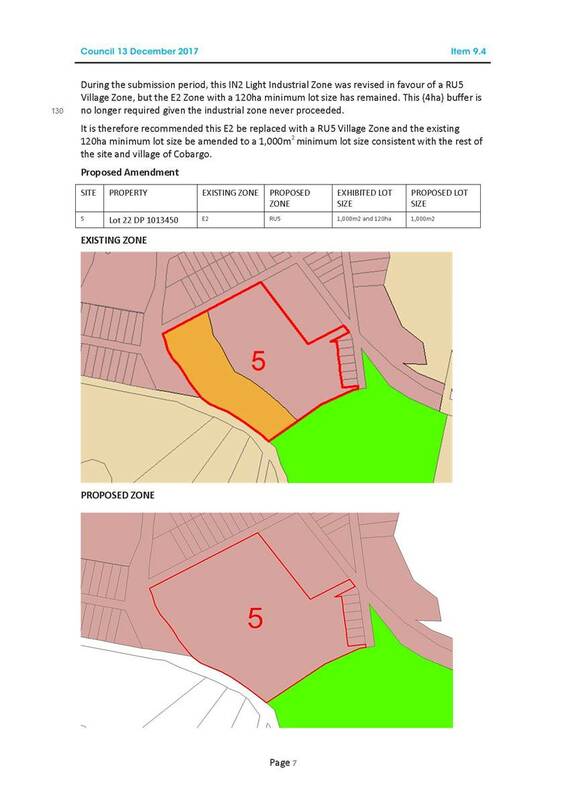 The majority of the land is zoned RU5 Village and the planning proposal recommended the E2 Environmental Conservation buffer on the land be zoned E3 Environmental Management and reduced to a variable with of 25-50m with a corresponding adjustment in the appropriate lot sizes. 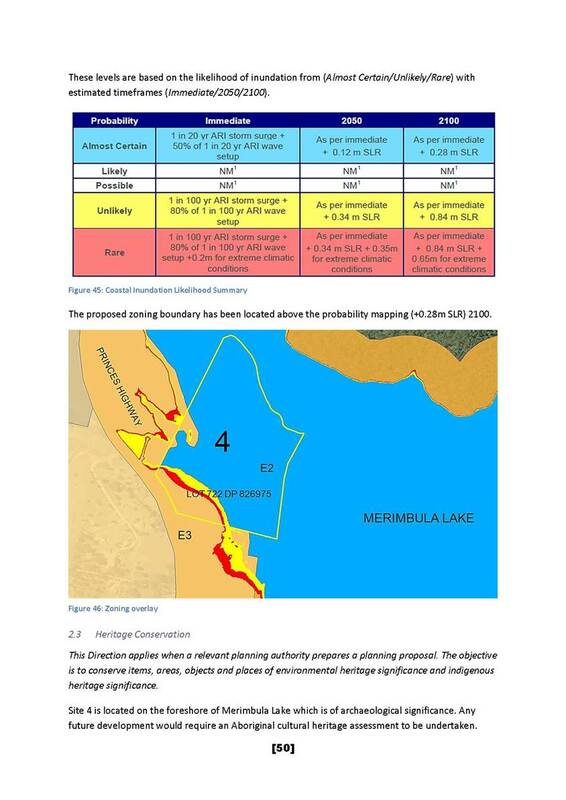 The main concern for OEH was the removal of the E2 Environmental Conservation zone and the potential for future development adjacent to Narira Creek. 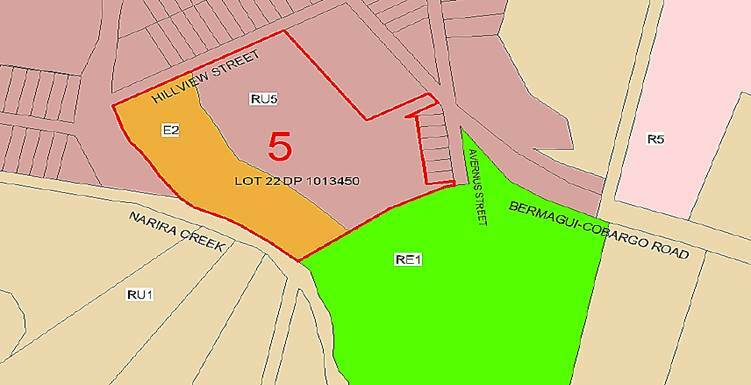 Outcome: It has been resolved with the owners and OEH to adopt an E3 Environmental Management zoning that aligns with the natural contours of the site with a variable width of between 25m-50m. An E3 Environmental Management zoning is more in keeping with the characteristics of the site and provides for the ongoing agricultural use of this property. The planning proposal has been assessed in accordance with the EPA Act and the requirements under the Coastal Management Framework. 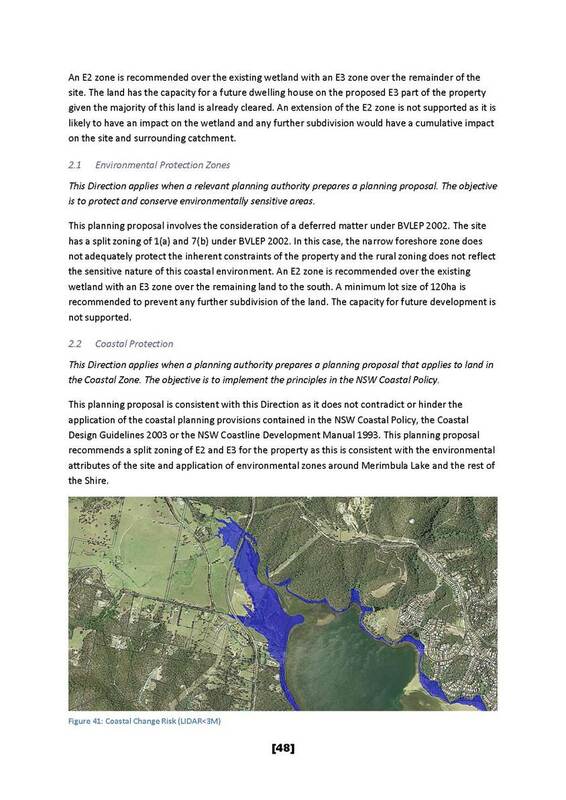 Referrals have been sent to the relevant NSW Government Agencies and amendments made to provide for the preservation and protection of these environmental zones. Council officers are of the opinion Council has the necessary delegation to proceed with the making of this planning proposal given the minor nature of the changes from the exhibited version. 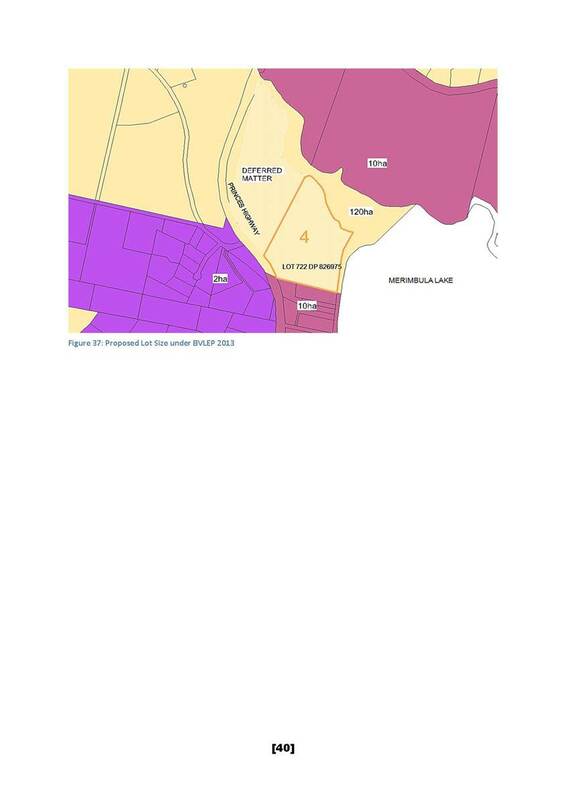 This report recommends amendments to the Bega Valley Shire Development Control Plan 2013 in relation to Lots 33 and 34 DP 243029, corner of Sapphire Coast Drive and Tura Beach Drive, Tura Beach. 1. 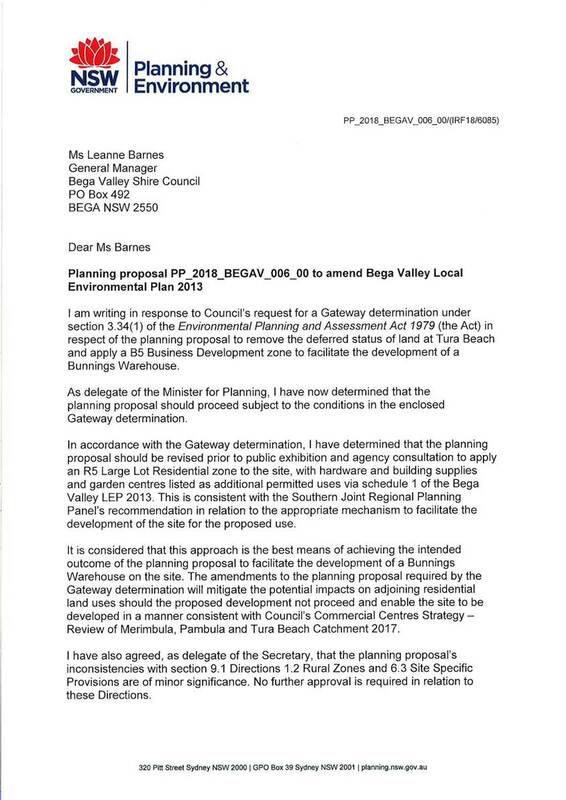 That Council resolve to place an amendment to the Bega Valley Shire Development Control Plan 2013 for the detailed land at Tura Beach, the subject of this report, on public exhibition for a period of 28 days. 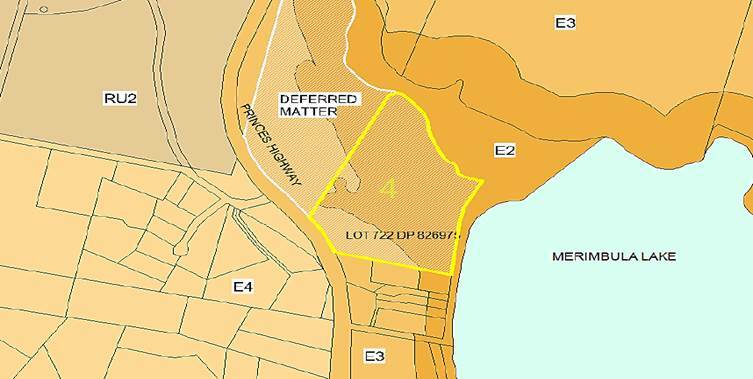 Lots 33 and 34 DP 243029 on the corner of Sapphire Coast Drive and Tura Beach Drive, Tura Beach are currently the subject of a Planning Proposal (PP) to rezone land to R5 Large Lot Residential, with the inclusion of "hardware and building supplies and garden centres" as additional permitted uses under Schedule 1 of the Bega Valley Local Environmental Plan (BVLEP) 2013. 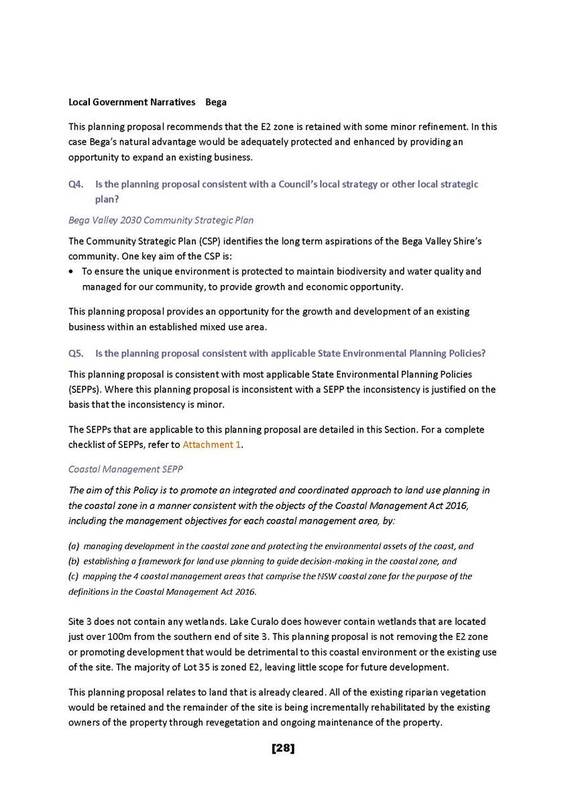 It is recommended that, in addition to amend to the BVLEP provided by this PP, Bega Valley Development Control Plan (BVDCP) 2013 also be amended to address design considerations. 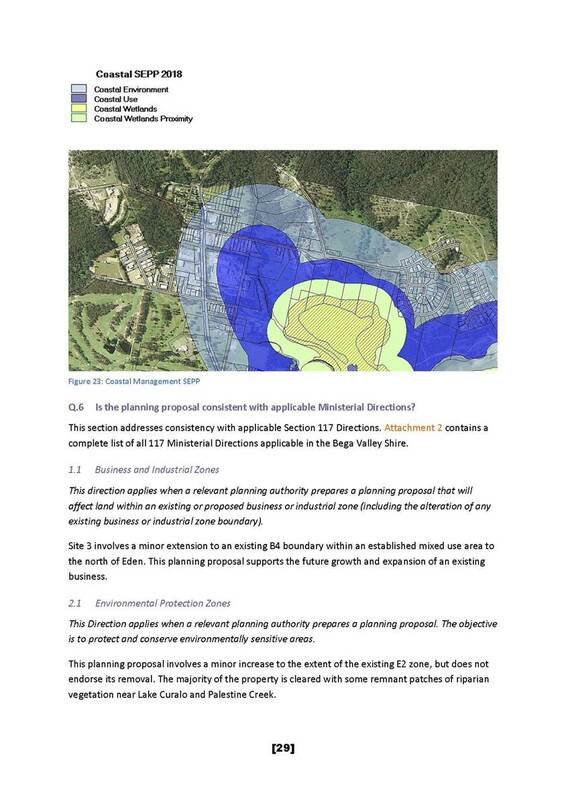 This report recommends that design considerations contained within the Commercial Centres Strategy Review of Merimbula, Pambula and Tura Beach Catchments be included as site specific requirements under Chapter 7.9 of BVDCP 2013 to provide clear direction for the future assessment of any commercial development of the site. 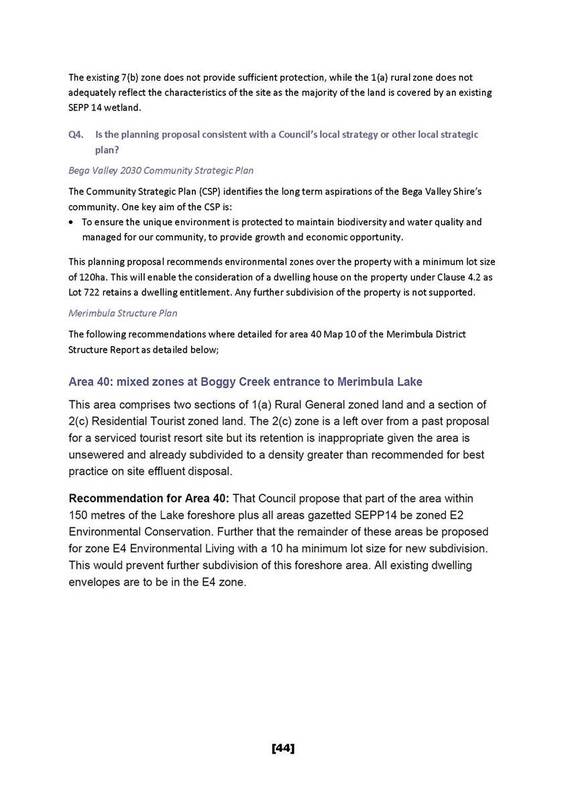 · Apply an R5 Large Lot Residential zone with hardware and building supplies and garden centres listed as additional permitted uses via Schedule 1 of the BVLEP 2013 consistent with the Southern Joint Regional Planning Panel (SJRPP) recommendation in relation to the appropriate mechanism to facilitate the development of the site for the proposed use. 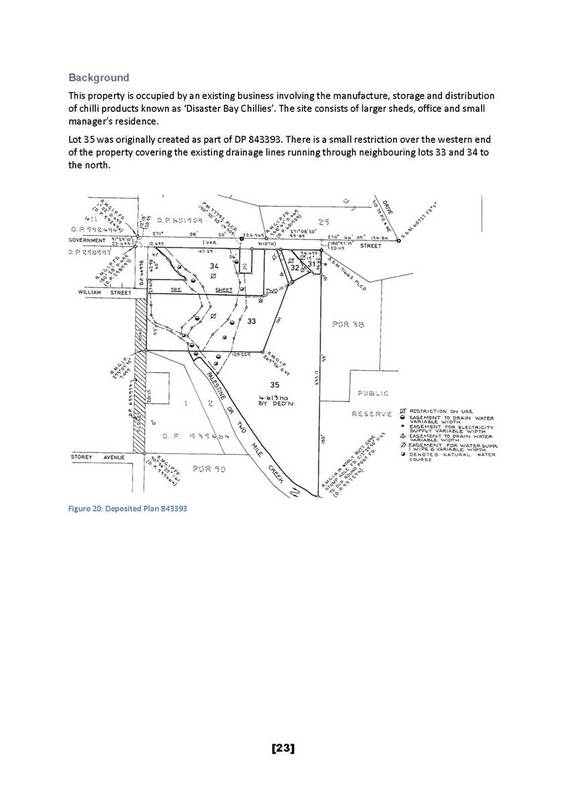 · Zoning the site to R5 Large Lot Residential. · Permitting the use of hardware and building supplies with approval as an additional Schedule 1 use over a portion of the site only (to ensure mandated setback and transition to use adjoining aged care facility). 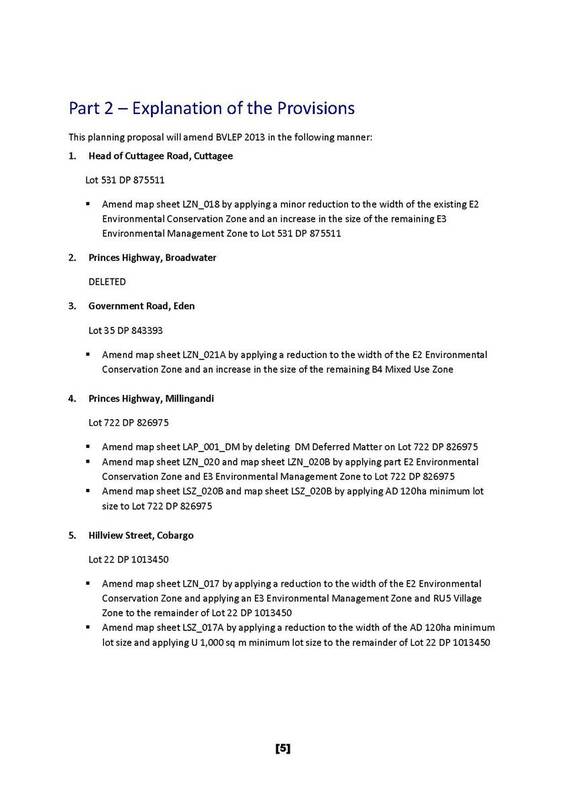 · Controls such as floor space ratio and height are included in BVLEP 2013 in relation to this site to mitigate impacts and provide a limit to development. · Include controls in BVDCP 2013 to address landscape, siting, setbacks of structure, finished levels, acoustic requirements, light and light spill and hours of operation. The PP includes a land application map that outlines the building envelope, gross floor area and floor space ratio where any future ‘hardware and building supplies and garden centres’ can be located. 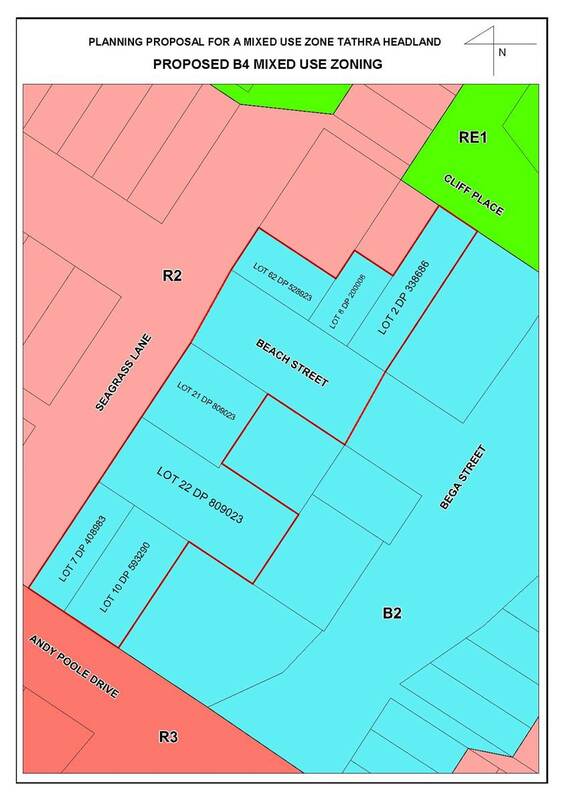 The zoning and land application map requirements would sit under Schedule 1 of the BVLEP 2013. 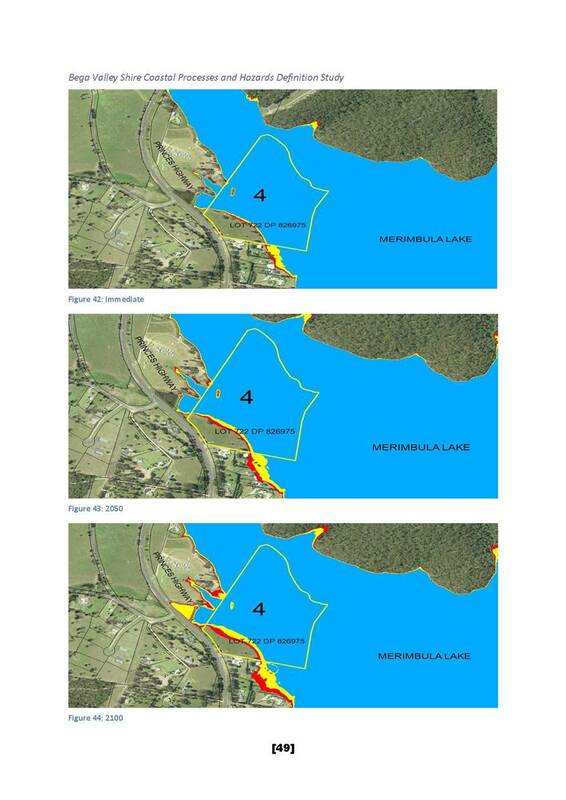 The proposed controls were included as design considerations within the Commercial Centres Strategy Review for the Merimbula, Pambula and Tura Beach catchments that was publicly exhibited and then subsequently adopted by Council on 21 February 2018. The proposed controls would provide direction for the development of the land as a ‘hardware and building supplies and garden centres’ in terms of building elements, colours and materials, landscaping, amenity, infrastructure and gateway controls. 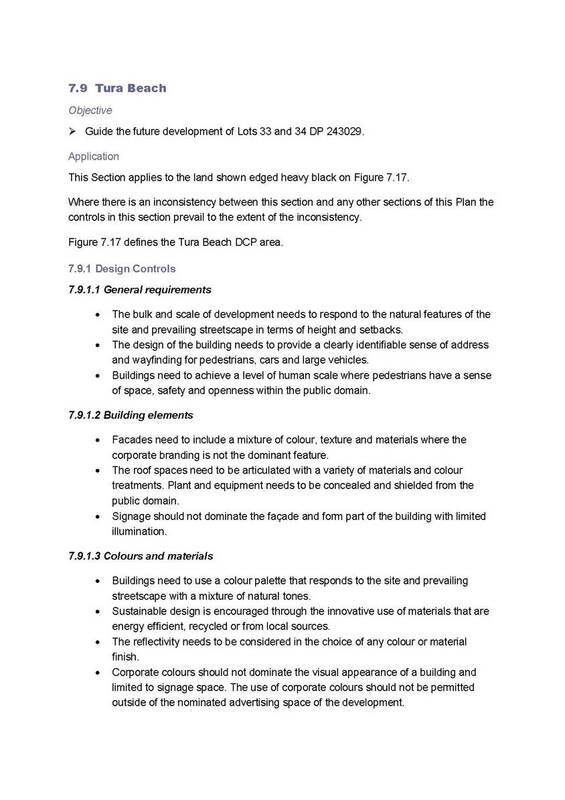 The inclusion of these design controls as a separate section (7.9) of the site-specific requirements chapter in BVDCP 2013 would ensure the design considerations adopted by the Commercial Centres Strategy Review are addressed as part of the future development of the land and is also consistent with the recommendations of the SJRPP. 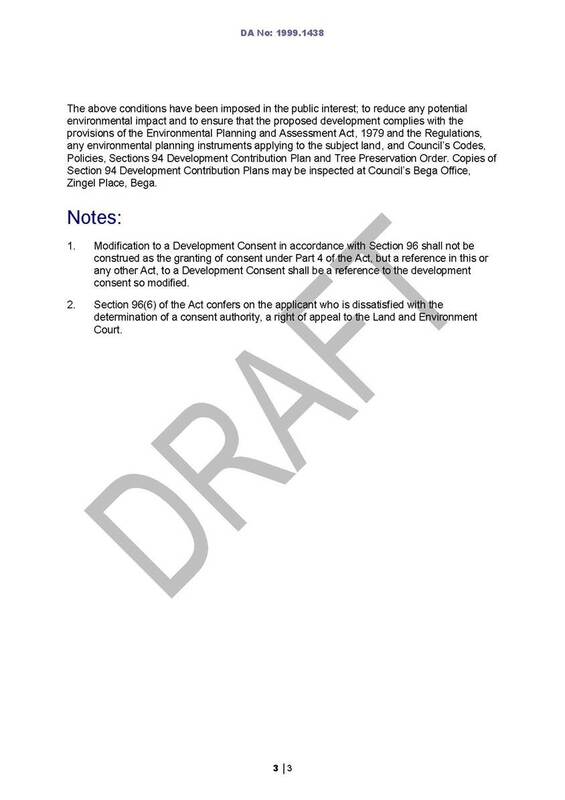 The proposed amendment to BVDCP 2013 will be placed on exhibition for a period of 28 days in accordance with public exhibition requirements under the Environmental Planning and Assessment Regulation 2000. 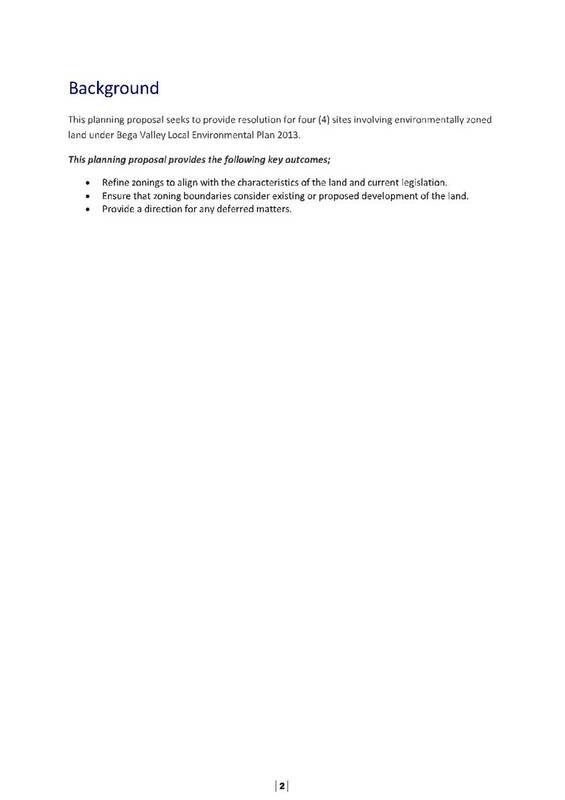 The Bega Valley community will have the opportunity to comment on the proposal during that period. 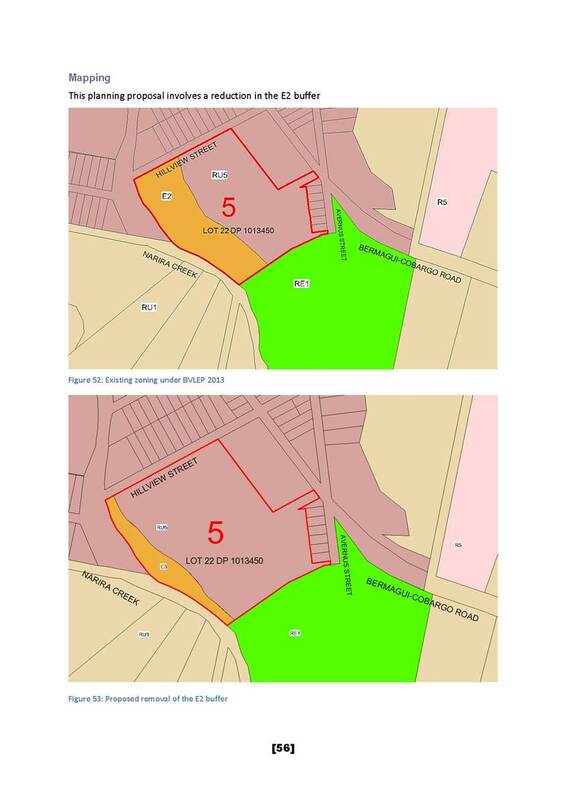 This proposed amendment would require any future commercial development of Lots 33 and 34 DP 243029 to address the detailed design controls described in the proposed additional section under BVDCP 2013. The proposed new section (7.9) provides greater guidance for the future commercial development of the subject land within the context of the PP, Gateway Determination and advice of the SJRPP. 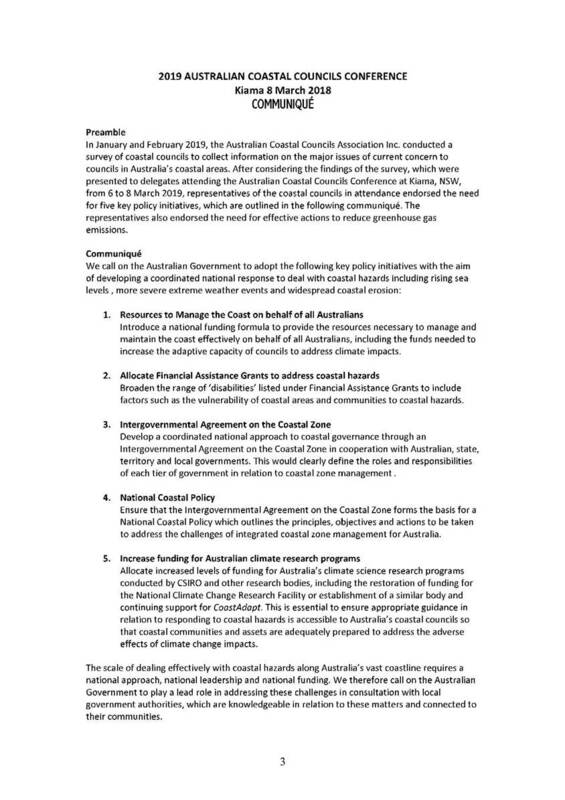 Delegates to the 2019 Australian Coastal Councils Conference have resolved to adopt a Communiqué calling on the Australian Government to implement five key policy initiatives. This report seeks Council’s endorsement of that communiqué. 1. 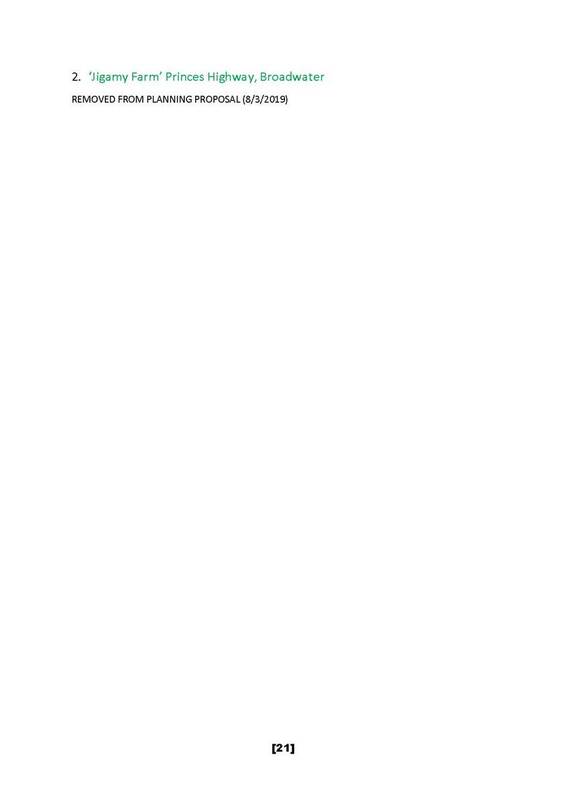 Endorse the 2019 Australian Coastal Councils Communiqué (Attachment 1). The Australian Coastal Councils Association Inc (ACCA) is the peak organisation representing councils on coastal issues. The ACCA holds an Annual Conference, at which delegates draft and adopt a Communiqué (Attachment 1) calling on the Australian Government to adopt key policy initiatives. The aim of these initiatives is to develop a coordinated national response to deal with coastal hazards including rising sea level, more severe extreme weather events and widespread coastal erosion. This report recommends that Council endorse the Communiqué and write to relevant Australian Government Ministers calling on them to implement the policy initiatives it describes. · Holding an annual conference to assist coastal councils to keep pace with coastal policy and technical developments, and to share the findings of coastal research projects. The ACCA’s 2019 Conference, held at Kiama, from 6 to 8 March 2019, was attended by representatives of coastal councils from across Australian, in addition to members of the coastal research community and representatives of relevant government agencies. · Not endorse the Communiqué. The Communiqué was developed based on a survey of member councils conducted by the ACCA and the input of delegates to the 2019 Conference. There are no direct financial and resource implications associated with the recommendation. Resources to implement the recommendation are available within Council’s 2018-19 budget. The recommendation is consistent with Council’s adopted policy approach, including its current Climate Change Strategy. Goal 3: Our economy is prosperous, diverse, and supported by innovative and creative businesses. Goal 5: Our air and water is pristine and our natural environment and rural landscape are protected. Goal 7: Our Shire continues to be a vibrant, enjoyable, sage and affordable place to live. There are no direct environment or sustainability implications associated with the recommendation. 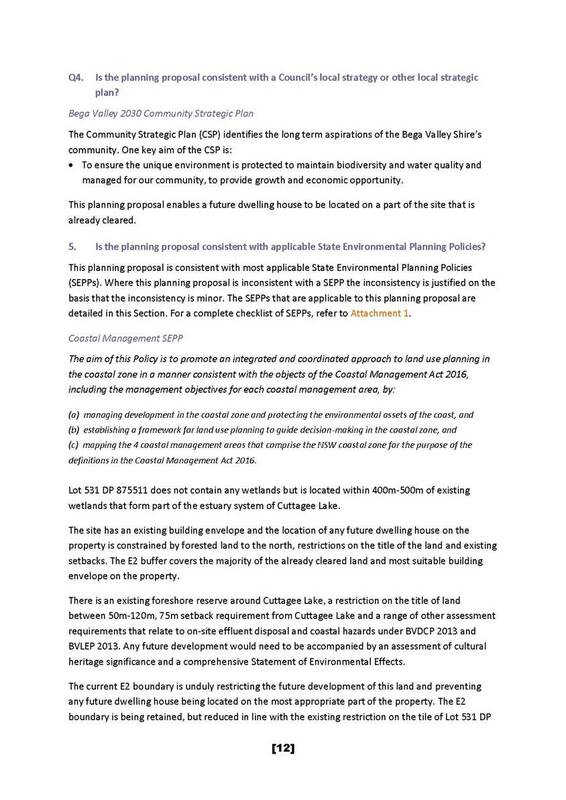 Benefits that may flow to Bega Valley Shire Council (Council) should the Australian Government implement the policy initiatives identified in the Communiqué include improved resilience of natural systems to climate change impacts. There are no direct economic implications associated with the recommendation. 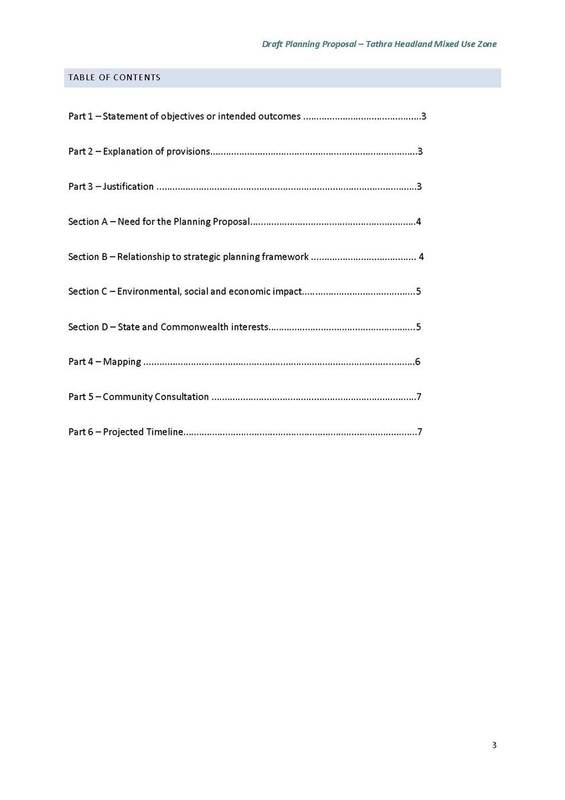 Benefits that may flow to Council should the Australian Government implement the policy initiatives identified in the Communiqué include improved resilience of the local economy to climate change impacts. Engaging with higher levels of government in relation to policy initiatives is a common activity undertaken by Council and the risks are well understood. 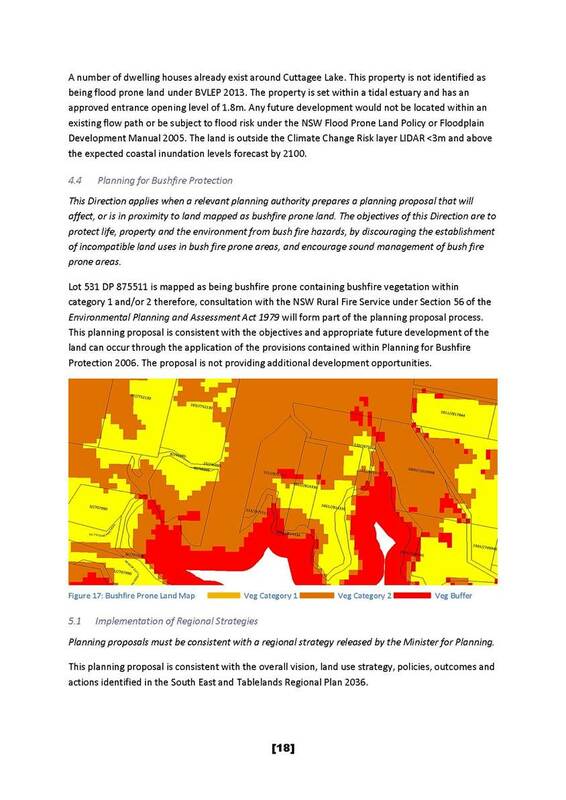 Given that significant climate change risks to the Shire have been identified, in Council’s Climate Change Strategy as well as work funded by the NSW and Australian Governments, advocacy for an improved national approach to this issue is considered an appropriate risk management measure. There are no direct social or cultural implications associated with the recommendation. There are both positive and negative indirect implications of the recommendation. 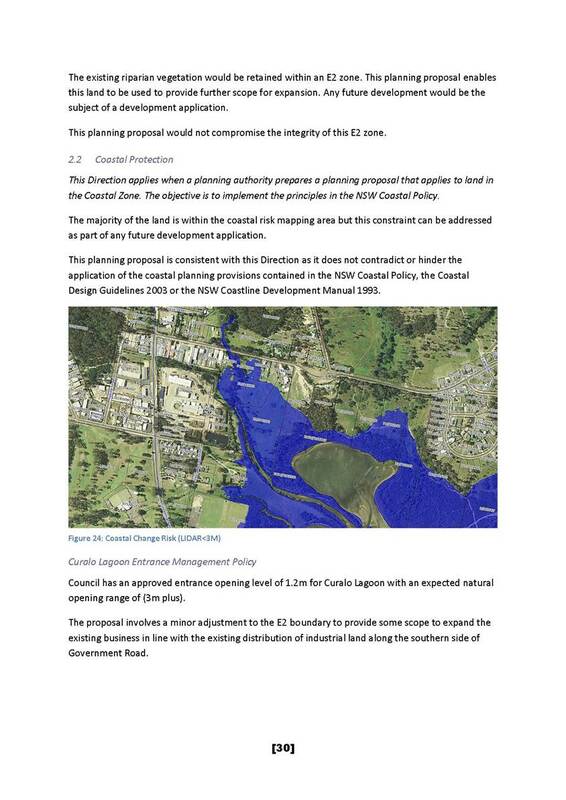 Should the Australian Government adopt the initiatives identified in the Communiqué, local communities could expect improved coordination in relation to management of coastal hazards, which could lead to improved safety and security. However, the Australian Government may divert resources from other programs, which communities may feel are more important in the short term. The report details the results of the Expression of Interest (EOI) process recently carried out for the use of the (former Tura Tavern) manager’s residence at Tura Beach. 3. 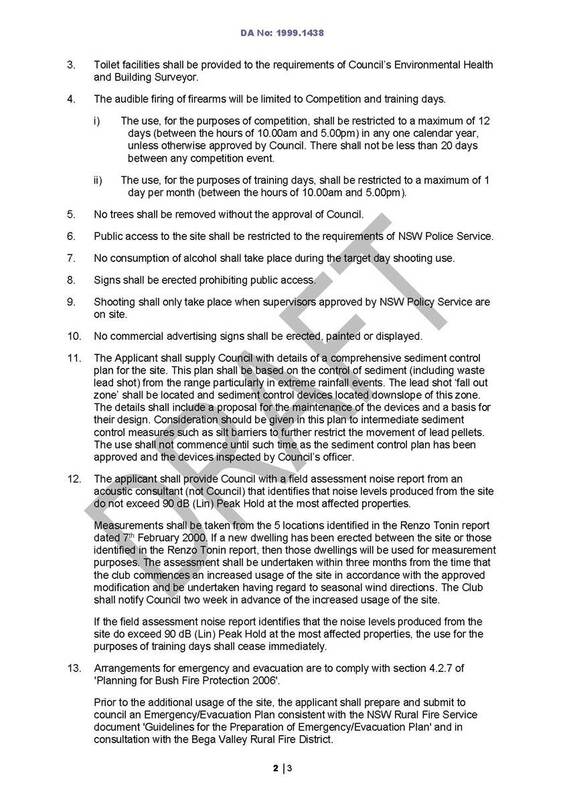 That Council consider the Council officers’ recommendation as detailed in the attached Confidential Report. 4. That Council authorise the General Manager and Mayor to enter into negotiations in order to execute the necessary lease documentation to provide tenure to the successful applicant. 5. That Council authorise the General Manager and Mayor to enter into negotiations with the second applicant should the successful applicant decide not to accept Council’s conditions in relation to lease responsibilities. 6. 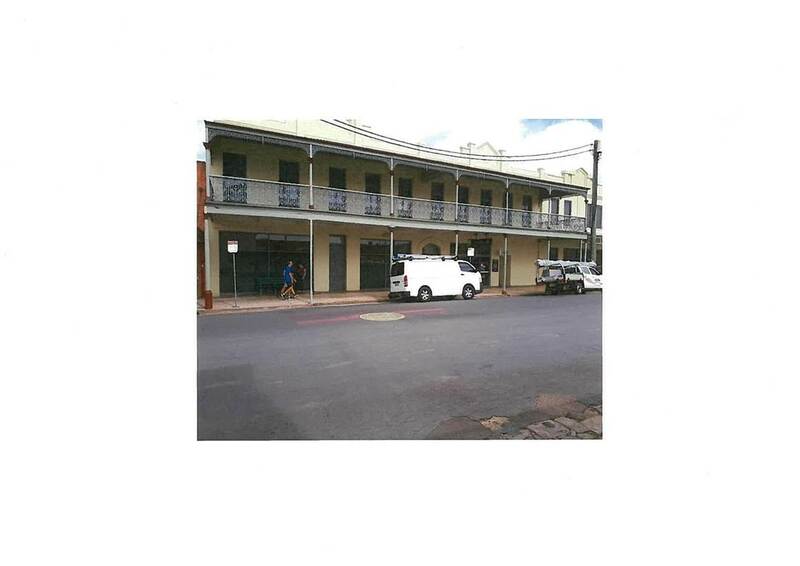 In the event that neither submission progresses to execution of a lease, Council approve the ‘making good’ of the residence for leasing; and appoint a local Real Estate Agent to market the property and lease out for residential purposes in line with the current approved use of the building. The report details the results of the Expression of Interest (EOI) process recently carried out for the use of the former (Tura Tavern) manager’s residence at Tura Beach on the basis of a financial return to Council. 6. That Council call for expressions of interest for the use of the former manager’s residence on the basis of a financial return to Council and that any proposal must meet all planning and building regulation requirements at the cost to the proponent. 7. In the event that no proposals are received, that Council approve the ‘making good’ of the residence for leasing; and appoint a local real estate manager to market the property and lease out for a suitable purpose allowable under the Planning and Building Regulations on the basis of a financial return to Council. 8. That the General Manager and Mayor be authorised to execute any documentation to facilitate the use of the facility in line with Council direction. The Expression of Interest 78/18 process (EOI) was conducted by Council officers between 19 December 2018 and 20 February 2019. The EOI document was available on Council’s e-Tendering portal. A total of two (2) EOI’s were received and evaluated against the set criteria by a Tender Evaluation Panel comprising: Council’s Economic Development Manager; Procurement and Contracts Coordinator; and Property and Facilities Coordinator. Both submissions were considered conforming and are attached as Confidential attachment for the information of Councillors. 1. 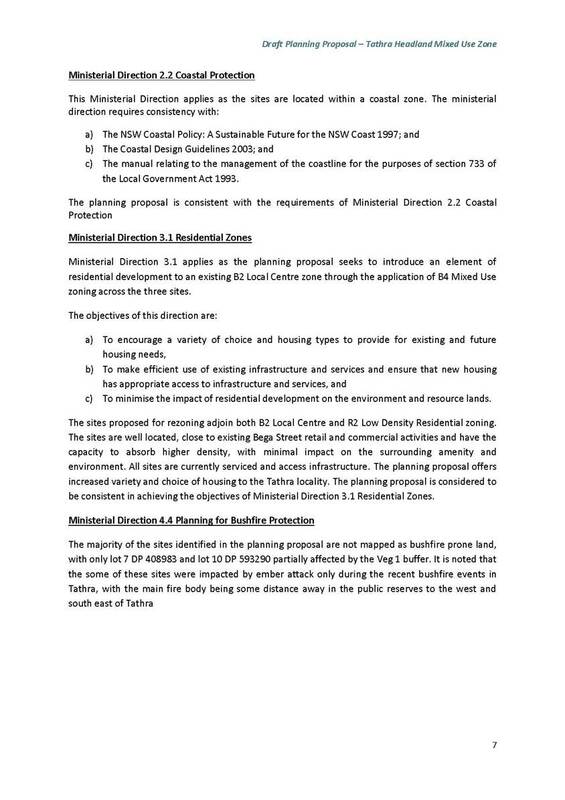 Accept the recommendation provided by Council officers in the attached recommendation report and resolve accordingly. 2. 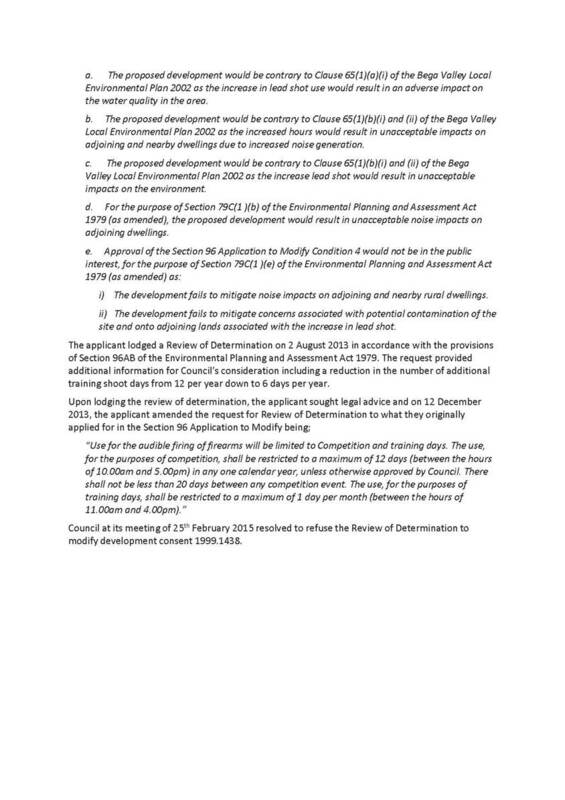 Decline to accept the EOI submissions received and advise submitters of Council decision. 3. This Council owned property at Tura Beach could remain vacant. Note: maintaining vacant possession of the property will require the identification of funds to undertake necessary works on the building and ongoing maintenance and operational budgets. 4. Other options, as raised and resolved by Councillors. Council officers completed an EOI process via public tender between 19 December 2018 and 20 February 2019. The tender was available on Council’s e-Tendering portal and publicly advertised on Council’s website and Facebook page. Council officers will liaise with third party applicants who submitted EOI submissions to advise of Council’s decision and formalise use/occupation of the premises over the coming weeks. The proposed financial return to Council for each submission has been summarised by Council officers in the attached Confidential Report. • All lessees/licensees shall be responsible for the payment of all outgoings on the property; including (but not limited to) Council rates and charges (if applicable), land tax, water, electricity, gas, telephone, and any other operating costs associated with their respective activities. Council officer time has been required to conduct the EOI process and ongoing management of a lease during its term will also need Council officer resources as required. 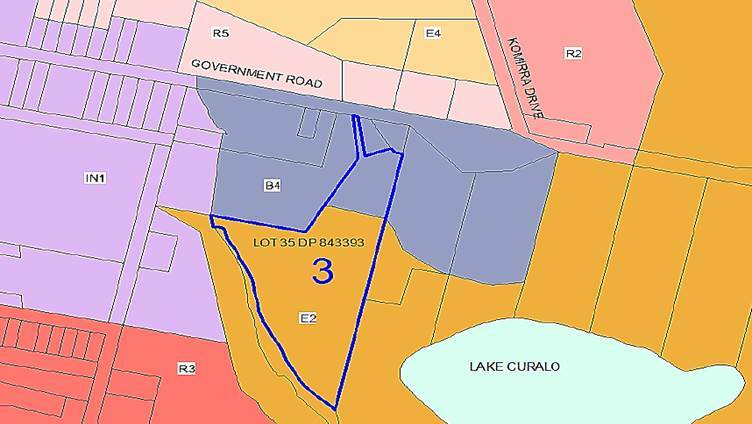 This Council owned property is contained on Lot 158 DP 1140729 Tura Beach Drive, Tura Beach and is classified as Operational Land under the Local Government Act 1993 (NSW). A lease enables exclusive use over a particular piece of land or building for a specified term and purpose. A lease is considered the best form of agreement if longer-term security of tenure is an important factor to the user of the land – such as where commercial uses are proposed and major financial outlay is required. · Invitations for expressions of interest. 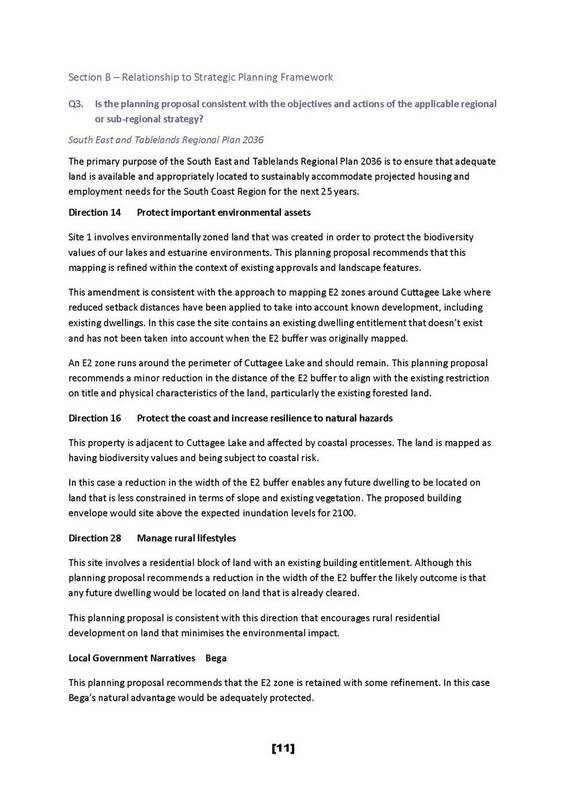 · The permitted use under Council’s Local Environmental Plan. Council’s preferred maximum lease term is 20 years however a longer term can be justified if major capital investment is involved which is the case in this instance. All community organisations who wish to lease or licence Council owned or managed land or buildings will be required to provide a Certificate of Incorporation issued by the NSW Department of Fair Trading. All lease/licence documentation is only to be executed by authorised officers of the incorporation/organisation. Demonstrate how the proposal will be funded and the financial return to Council. Demonstrate how the proposal will generate local economic activity and support for the local community. 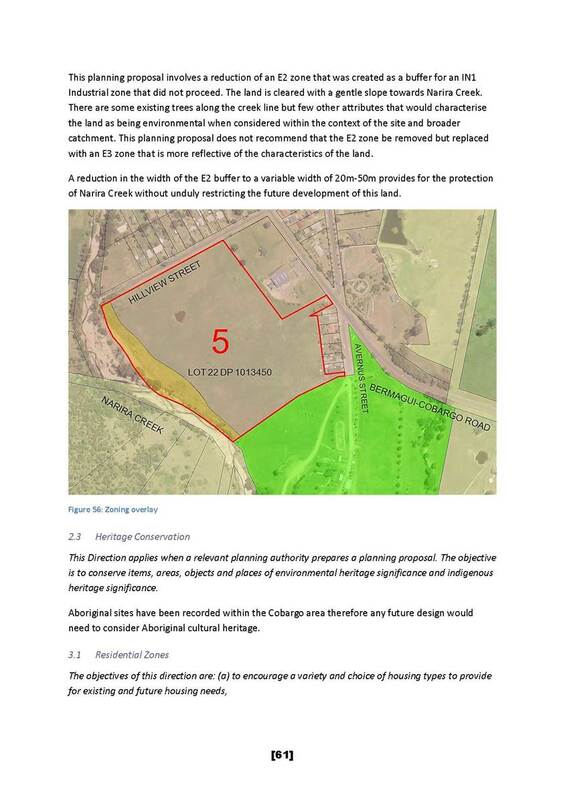 Demonstrates how the proposal will complement the site for use by the community. Evidence of how the proposal complies with all Planning and Building regulation requirements. The tenderer shall provide a statement with respect to the proposed length of tenure required. The tenderer shall provide a statement with respect to how they shall, if successful, recognise local outcomes including demonstration of support for local business and community enterprise through delivery of the proposal. Are contractors proposed to carry out works registered and accredited with BNG? Demonstrated previous experience in the proposed activity. Have reference been provided with the submission? The tenderer shall provide a statement with respect to community benefit and participation through the delivery of this proposal. The tenderer may provide additional data, project descriptions, capability statements or other information to demonstrate capabilities and experience specifically relevant to their proposal. Each of the proposals received provide a level of economic activity or benefit to Council and the community. There are no adverse risks in allowing the building to be occupied as long as the use is authorised by way of a formal Lease Agreement which contains appropriate indemnity and insurance clauses. (1) The grounds on which part of a meeting is closed must be stated in the decision to close that part of the meeting and must be recorded in the minutes of the meeting. 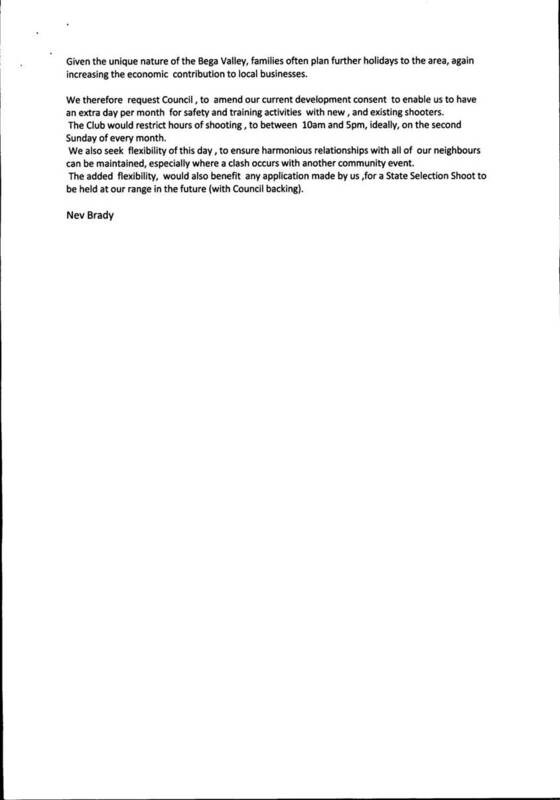 (c) the reasons why the part of the meeting is being closed, including (if the matter concerned is a matter other than a personnel matter concerning particular individuals, the personal hardship of a resident or ratepayer or a trade secret) an explanation of the way in which discussion of the matter in an open meeting would be, on balance, contrary to the public interest. 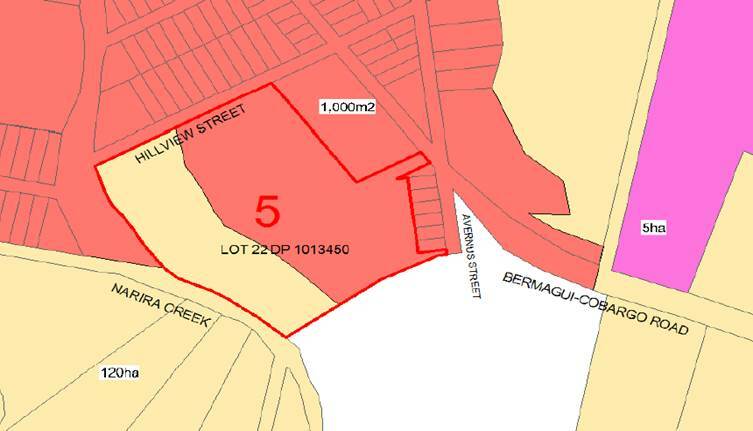 Land at the Bermagui Bega Valley Shire Council (BVSC) Operations Depot is needed to expand the Bermagui Sewerage Treatment Plant (STP). Awarding the tender for a new shed will allow existing site storage to be consolidated into the one shed and the STP upgrade to continue. 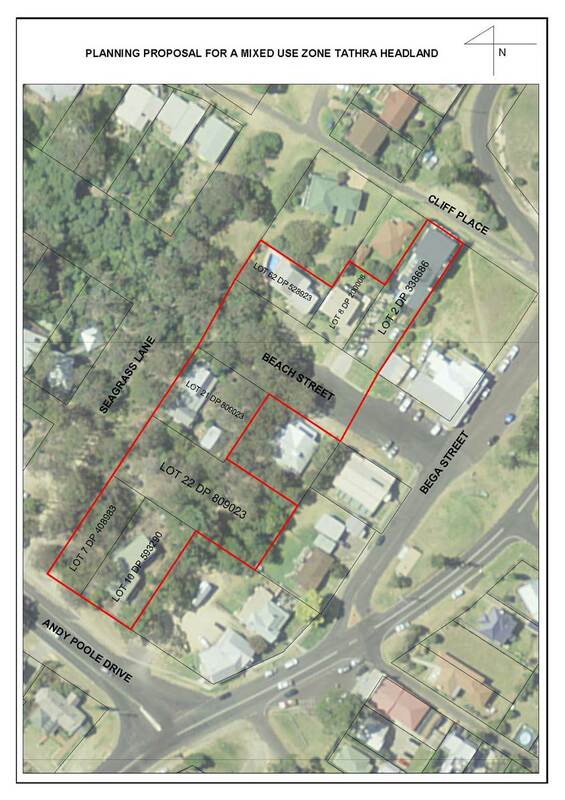 This report is an update on the Bermagui STP upgrade and a tender recommendation for the construction of a new shed at Bermagui operations depot. The Bermagui Depot and STP is currently undergoing a reconfiguration to better accommodate the demands of the STP. A significant upgrade to the STP is underway in two packages of work – ‘Civil’ and ‘Process’. 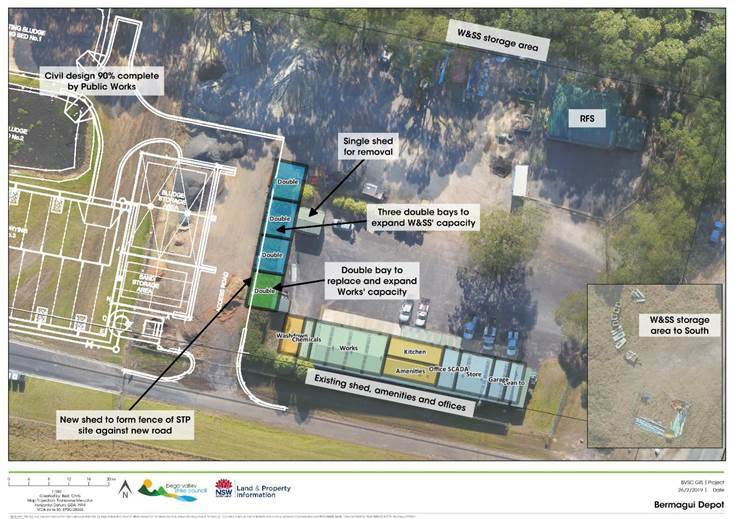 To better utilise the STP site footprint and more efficiently utilise space at the adjoining Bermagui Operations Depot, a storage area reconfiguration is currently underway. 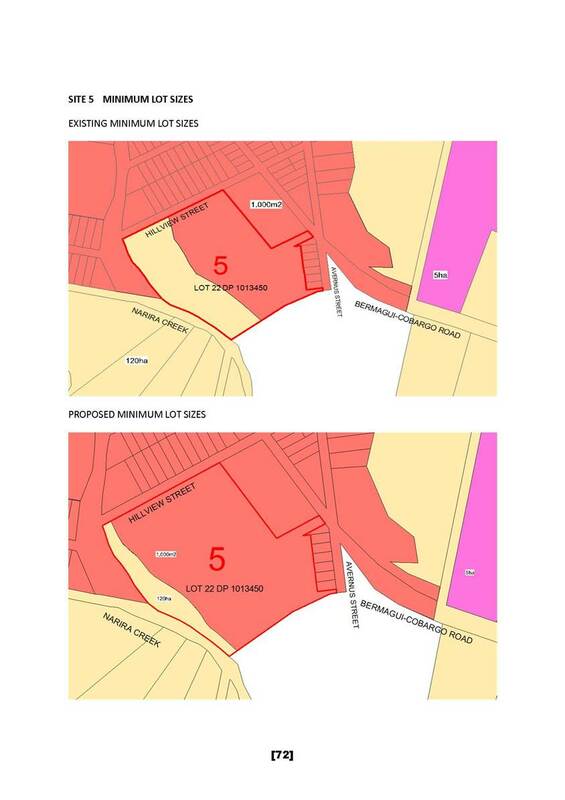 The reconfiguration includes some relocation of stockpile areas on the Depot site to accommodate the erection of a new shed to store water and sewerage resources. The new shed will also result in better storage capacity for operations teams, extra and improved secured storage and greater organisational event response capacity due to better stockkeeping and availability. In the future, the Water and Sewer SCADA control room will be expanded to the East, into the store room, with the SCADA upgrade underway for network operations. The SCADA upgrade to ‘Clear SCADA’ at Bermagui STP was completed in February 2019. 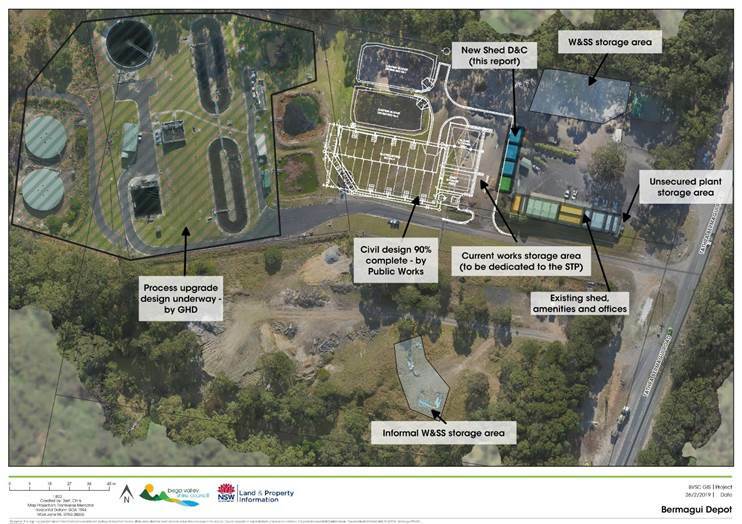 ^ Overview of Bermagui depot and STP facility showing major works packages and their progress as well as Water and Sewer (W&SS) storage areas which can be mostly consolidated into the new shed giving space to Works Section for material storage. The upgrade of Bermagui STP is a Pollution Reduction Program (PRP) condition on our Licence EPL 1738 added in October 2013 to upgrade ‘sludge handling’ and ‘high flow treatment’ (peak Christmas treatment capacity). 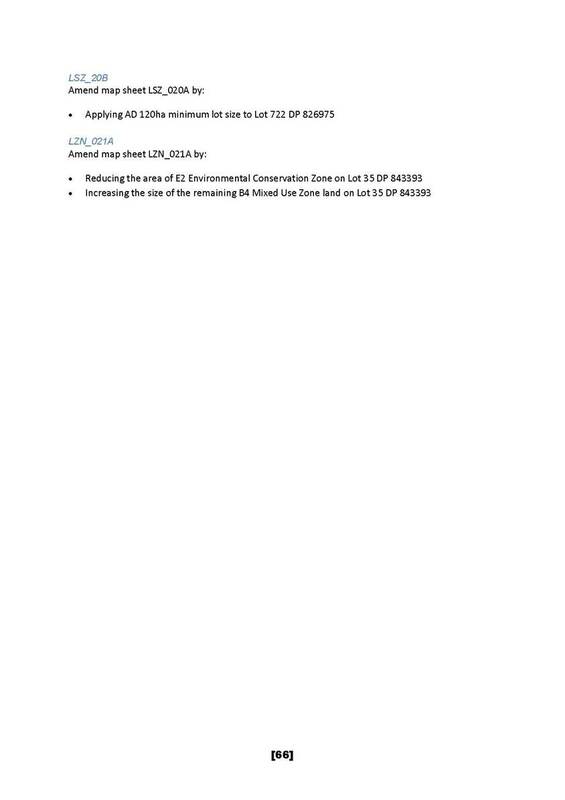 a) By 31 January 2019, in accordance with the letter sent to the Environment Protection Authority (EPA) dated 27 March 2018 (EPA Reference DOC18/185159), provide the EPA’s Manager Regional Operations – South East Region with a detailed design and timetable for construction of any necessary infrastructure for onsite sludge management detailed in b) below. c) By 31 January 2021, undertake an assessment of the requirement for increasing sludge lagoon storage capacity and report the findings and associated recommendations to the EPA. 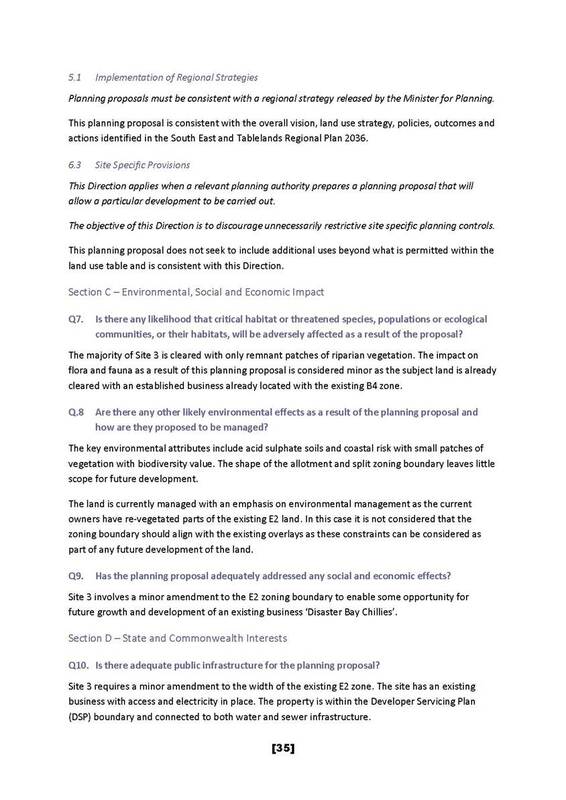 a) By 30 June 2019, in accordance with the letter sent to the EPA dated 27 March 2018 (EPA Reference DOC18/185159), provide the EPA’s Manager Regional Operations – South East Region with a detailed design and timetable for construction of any necessary infrastructure detailed in b) below. · Renew the highest pressure section of the outfall pipe (Phase 1 of the outfall pipe renewal). 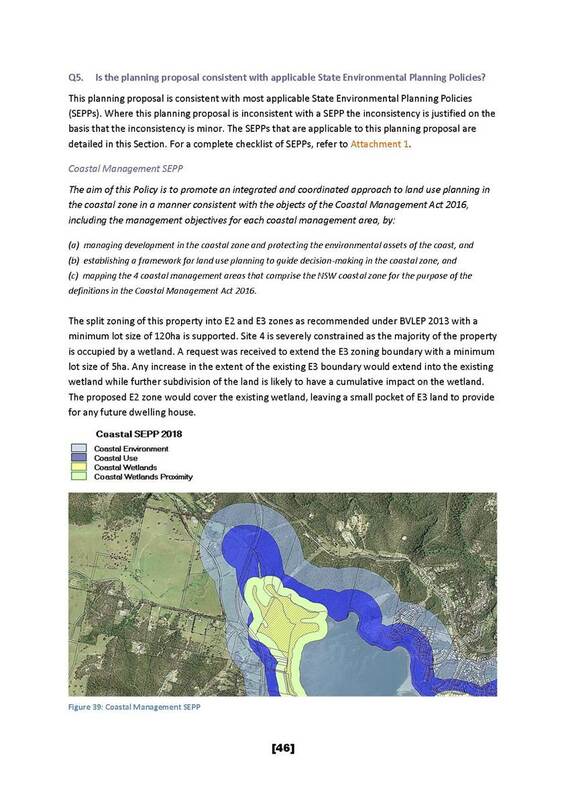 In addition, Eurobodalla Shire Council have indicated a desire to connect Akolele to sewer and pipe the sewage to Bermagui STP. They will not be able to do this until capacity is increased at the STP. The budget is allocated for this project in the current adopted Long Term Financial Plan for the Sewer Fund with appropriate allocations in the current year’s Operational Plan. This is an example of effective headworks collection, funding headworks growth upgrades. The upgrade will not require additional operational capacity however, it may reduce the running costs of the STP. This is because less contractor time will be required for biosolids handling and less operator time for high flow periods. 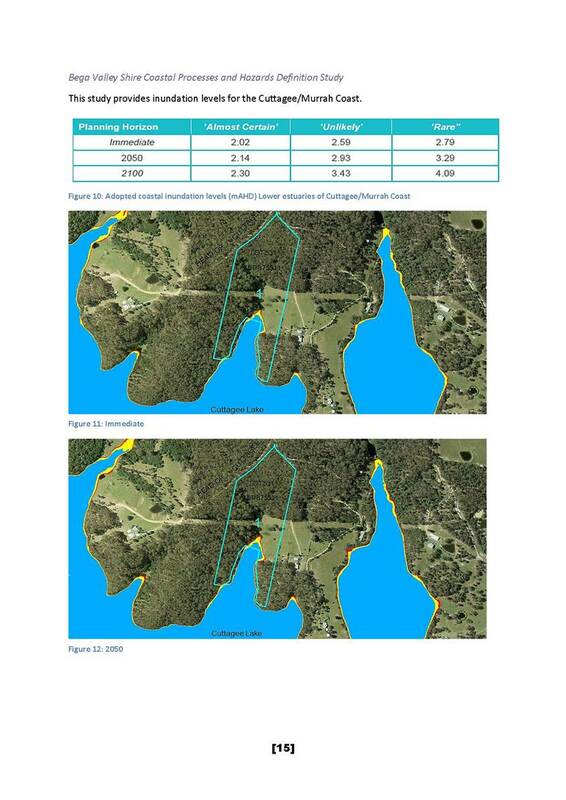 The ability to connect Akolele would result in a headworks contribution from Eurobodalla Shire Council which will significantly offset the upgrade cost. Public Works Advisory (PWA) completed the procurement of the new shed via a publicly advertised Request for Tender (RFT) process. PWA will project manage the delivery of the shed as well as the following stages of design and construction for the STP upgrade. PWA use robust procurement and contract management methods which are very low risk to Council and compliant with NSW legislative requirements. The Local Traffic Committee is primarily a technical review committee and is not a Committee of Council. Local Traffic Committees operate under delegation from NSW Roads and Maritime Services (RMS) who are responsible for traffic control on all New South Wales roads. Their role is to advise Council on traffic control matters that relate to prescribed traffic control devices or traffic control facilities for which Council has delegated authority. It is a requirement for Council to formally adopt the recommendations from this Committee prior to action being taken. The recommendations were supported unanimously by the Committee. The recommendations in this report are a direct reflection of the recommendations of the Local Traffic Committee. 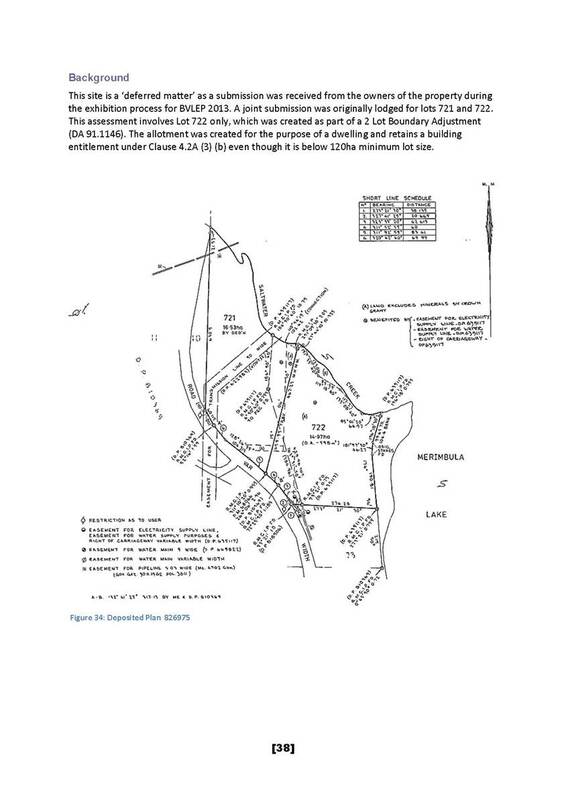 Maps identifying locations these recommendations relate to are attached. 3⇩. Photos - Timed bus zone Loftus Street, Bemboka. Photos - Timed bus zone Loftus Street, Bemboka. Nominations to Sportsground Site Committees for the Bega Sportsground and Pambula Beach Sporting Complex as well as a S355 General Sportsground Committee nomination have been received and are presented to Council for consideration. 1. 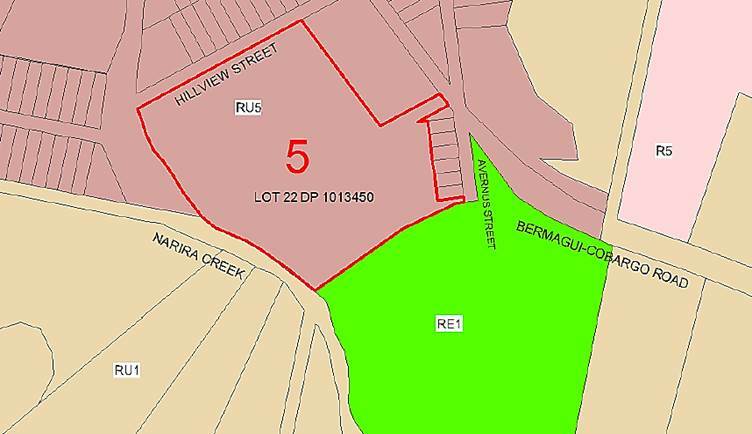 That the nominees listed in the Confidential Attachment for membership of Bega Sporting Complex Site Committee and Pambula Beach Sports Complex Site Committee, as well as the nomination for the Section 355 General Sportsground Committee be endorsed. Sportsgrounds are highly valued by the Bega Valley Shire community with many residents participating as a player, administrator or spectator. An active lifestyle and involvement in sport and recreational activities provides physical and social health benefits. Individual and team sports promote social cohesion, networking and development of friendships and can improve social skills. The participation of volunteers in the care and management of Council’s Sportsgrounds is an important way in which these facilities are activated, maintained and remain available to user needs. Volunteer input and assistance in the management and operations of sportsgrounds across the Shire is through a two-tier Committee structure. Site Sportsground Committees are made up of user group representatives and community members interested in the operations and management at individual sites. The S355 General Sportsgrounds Committee is made up of representatives from each Site Committee. · Nominations were called in late 2016 for people interested in membership of the various Community Sportsground Committees. 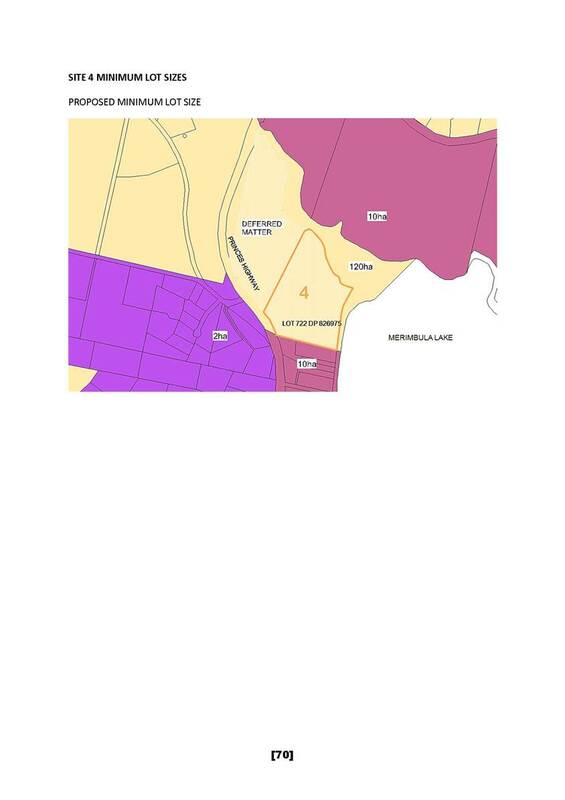 · Pambula Beach Sports Complex Site Committee held a meeting in February 2019. The three attached nominations include representatives from Pambula Pony Club, Merimbula Pambula Bulldogs Minor Rugby League Club (replacement of resigned member) and Lumen Christi who did not have an endorsed member on the site committee. 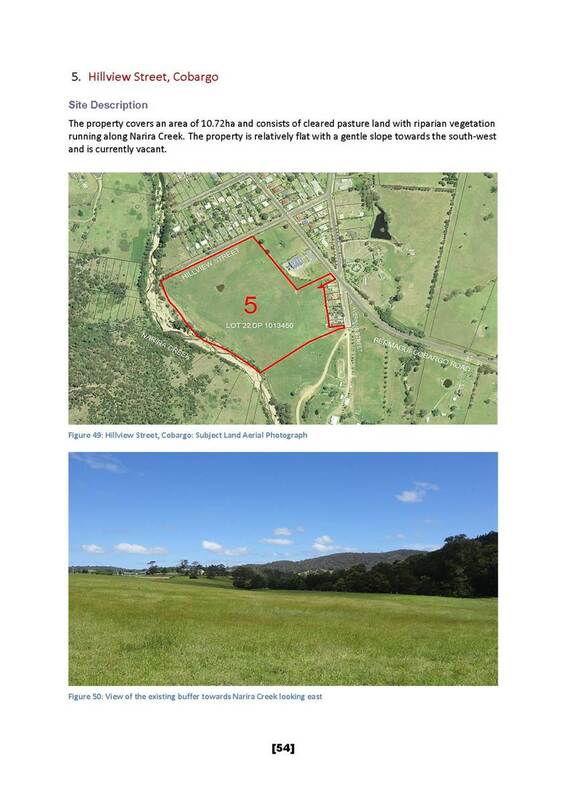 · Bega Sporting Complex Site Committee held a meeting in February 2019 and put forward a representative for the Section 355 General Sportsground Committee vacancy due to resignation of the previous representative. Council’s framework for working with the community in the management of sportsgrounds is based on two levels of committees – the S355 General Sportsgrounds Committee and Sportsground Site Committees for individual sportsground sites. Section 355 (b) and Section 377(1) of the Local Government Act 1993 enables Council to exercise its functions by a Committee of Council and to do so conditionally. 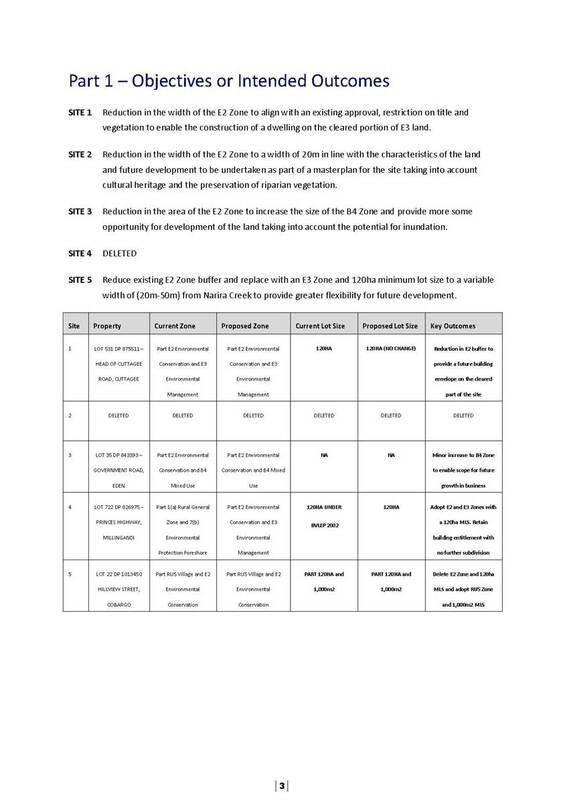 The delegated functions of the S355 General Sportsground Committee are set out in the Sportsground Committee Guidelines which prescribe the manner the S355 General Sportsgrounds and the Site Committees operate. The intent of the guidelines is that committee membership is balanced and reflects users of the sites and levels of use. Members of the Sportsground Site Committees are appointed by Resolution of Council. This report relates to nominations for individual Sportsground Site Committees, and a nomination for S355 General Sportsground Committee. Council advertises for nominations for Sportsgrounds Site Committees members at the beginning of the Committee term, which align with the Council term. Mid - term nominations are not unusual. Typically, additional nominations can come about through changes in involvement in local sports clubs or, as is the case reason for this report, increased interest in being involved in the site committees or resignations from those on the committees. Mid Term nominations are welcome. Reporting nominations to Council gives a mechanism for nominees to be formally appointed to site committees. Council’s sportsgrounds provide opportunities across the Shire for our community to come together, create connections between people and build stronger communities. The involvement of volunteers helps ensure these facilities are well utilised and better able to meet community needs. Involvement in sportsground committees also provides benefits to many individual volunteers by increasing their community connections and building their capacity through participation. Council recognises the number and quality of sportsground facilities could not be provided without the efforts of committees and the wide range of volunteers who assist the committees in their work in managing and maintaining these facilities. · Section 14 of Government Information (Public Access) Act 2009 No 52 applies. (2) The public interest considerations listed in the Table to this section are the only other considerations that may be taken into account under this Act as public interest considerations against disclosure for the purpose of determining whether there is an overriding public interest against disclosure of government information. 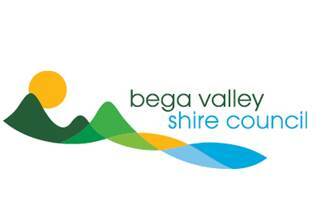 The Bega Valley Medallion Committee has considered the seventeen nominations received for the Community Service Award in 2019 and recommends that Council endorse the awardees. The Medallion Committee considers nominations received by the deadline for each year and makes recommendations to Council on which nominees should receive an award in the current year. A copy of the nominations received has been provided to Councillors separately. The Committee recommendations have been provided to Council via a Confidential Memorandum. Community engagement included media releases, Facebook posts, distribution of nomination forms and background information to Councillors, Medallion Committee Members and a wide range of community groups and organisations. An article was also included in Council’s Staff Newsletter and Council News. 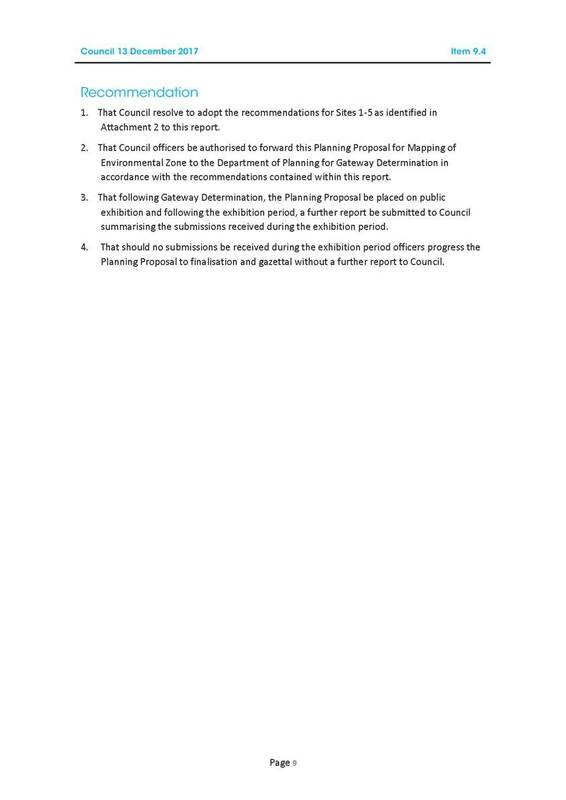 Council is required to exhibit its draft annual plans under the Integrated Planning and Reporting framework. These include the Delivery Program; Operational Plan; Budget; Rates and Charges; and Fees and Charges for a period of 28 days. 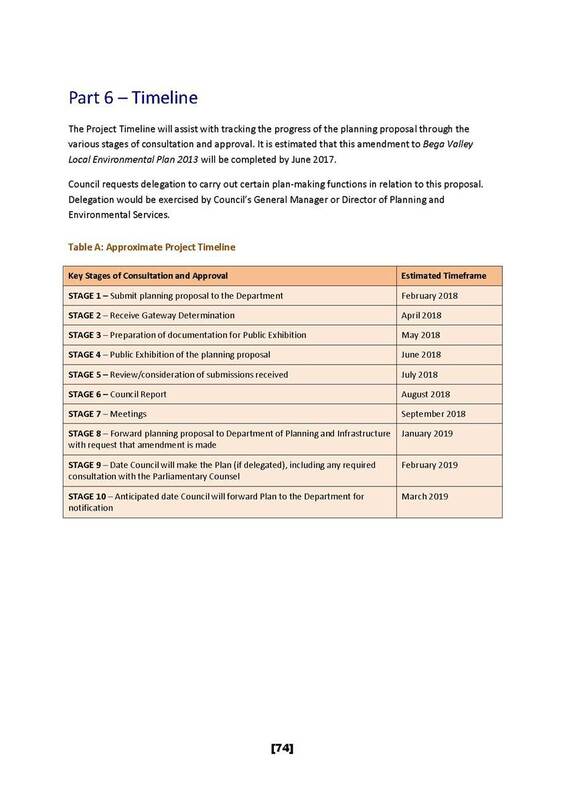 The draft Operational Plan outlines the individual projects and activities that will be undertaken for the year to achieve the commitments made in the adopted Delivery Program 2017-202.1 The drafts are now proposed to be publicly exhibited with the feedback considered by Council before adoption. The Delivery Program and Operational Plan are presented in one document which also includes financial estimates for the four-year period and a detailed budget for the operational activities to be undertaken as well as a statement of Revenue Policy for the applicable financial year, 2019 – 2020. 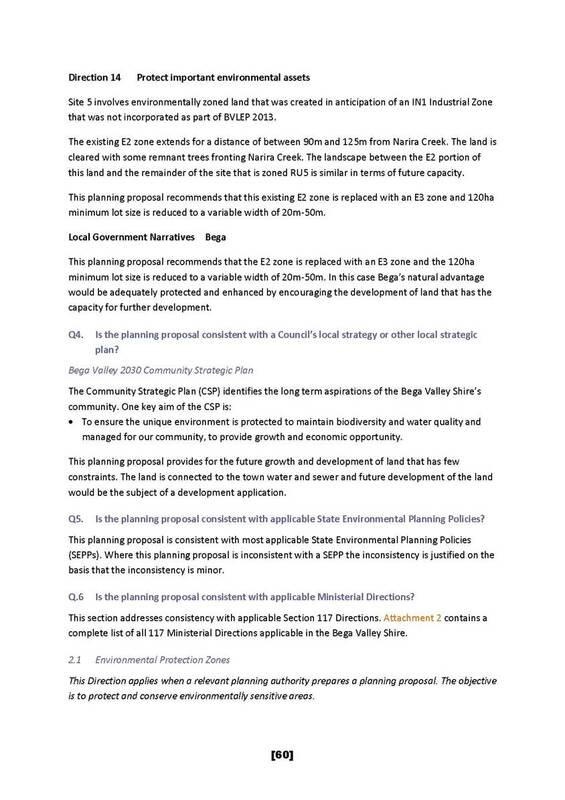 The Delivery Program outlines which aspects of the Bega Valley Community Strategic Plan 2040 (CSP 2040) are under the direct control and responsibility of Council. It identifies what actions Council is going to undertake in the medium term to work towards the goals and strategies in the CSP 2040 within the resources available. The program also presents a description of what each of Council’s Service Areas will do and indicates which Service Area is responsible for achieving the actions. 1. The Tathra and District Bushfire response and recovery. This is expected to impact Council programs and resourcing for up to 18 months. 2. The unprecedented level of funding being delivered in particular by the State Government through the Regional Growth Funds. This program is very positive for regional NSW as it provides the opportunity to deliver additional and upgraded infrastructure in a range of areas including transport, sport and recreation, buildings and tourism related areas. It also brings with it a necessary diversion of staffing resources to deliver the projects and potential impacts on forward planning for other projects including operations and maintenance. The Delivery Program 2017-2021 has also been revised to reflect the new organisational structure and resulting redirection of services, legislation changes, the impact of the Tathra and District Bushfire and Yankees Gap response and recovery and an increase in funding opportunities particularly from the NSW State Government. In the area of grants a significant increase in funding (in the order of $80m across all activity levels) has already been received which will see additional works programs and activities across a number of areas. The Highlights Section in the Draft Delivery Program summarises these. A number of applications are still be finalised and appropriate amendments will be made at the time. Once resolved by Council the documents will be made available publicly for a period of 28 days for comment and submission. The Operational Plan and Budget is developed every year to directly address the actions outlined in the Delivery Program and identify the projects, programs or activities that Council will undertake within the financial year towards addressing these actions. · borrowings proposed for the 2019-20 financial year. The Council determines fees and charges for a range of services such as: Planning and Building; Library; Children’s Services and facility usage. These fees and charges form part of the Revenue Policy. The fees and charges proposed for these services and facilities for the 2019-20 year is detailed in the draft Fees and Charges document, and are aligned to Council’s pricing policy, some of which are set by statute. Council management committees have been provided the opportunity to submit their draft fees for 2019-20, and these have been included. The draft Operational Plan also includes a 2019-20 Budget Summary which provides an overview of the total estimated income and expenditure for each of Council’s General, Waste, Water and Sewer Funds as well as a breakdown of expenditure by Council services. Considerable community input was integrated into the development of the plans over the period 2016 to 2017. This involved community surveys, workshops, market stalls and a range of engagement sessions. The resulting “Understanding Our Place” report informed some clear strategic direction. 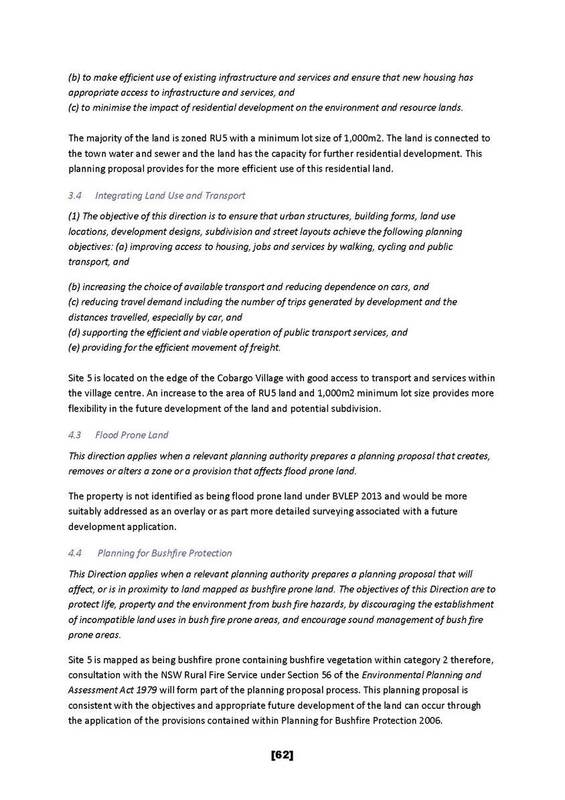 Formal public exhibition of the Draft Operational Plan 2019-2020 in accordance with the requirements of the Local Government Act 1993 will occur. This exhibition will focus on all elements of the draft Delivery Program and Operational Plan including the Budget, Revenue Policy, Fees and Charges and Financial Estimates. Public exhibition will include the document being available in all library branches, on Council’s website and advertisements in local newspapers and electronic media. Community feedback from the public exhibition period will be considered by Council before the final document is adopted in June 2019. Under the Local Government Amendment Act 1993, Council is required to develop plans as outlined above and to publicly exhibit documents in the IPR framework for a period of 28 days. The Delivery Program and Operational Plan are key components of Council’s IPR Framework. The Delivery Program and Operational Plan outline projects, programs and activities that Council will undertake towards addressing environmental and sustainability issues. The Delivery Program and Operational Plan outline projects, programs and activities that Council will undertake towards aiding economic growth in our region. The Delivery Program and Operational Plan outline projects, programs and activities that Council will undertake towards building social and cultural capacity in our community. Council has been requested by the tourism sector to investigate and consider raising additional revenue for local destination marketing and support of Visitor Information Centres through a targeted Special Rate Variation (SRV) application or other revenue method. Over the past two years Council has been progressing discussions with industry groups, the Office of Local Government (OLG) and other Councils with a significant tourism focus in relation to funding options for tourism marketing and promotions. A Special Rate Variation (SRV) or other appropriate mechanism to support increased funding for tourism marketing and promotion have been investigated. This report outlines options available and the expected impact of progressing any option. The draft Operational Plan 2019-2020 includes a draft action and associated budget to progress work to prepare a rate increase option. This report seeks to provide Council and the community with an update on the expected impacts of this. Council currently has two SRVs allocated to cover costs associated with tourism impacts on local assets in the Bega Valley Shire and another to grow the broader tourism and visitor economy within the Shire through marketing and promotion activities. In 2006/07 an SRV was successfully applied for to apply a small rate increase in perpetuity on all ratepayers for expenditure on tourism infrastructure. 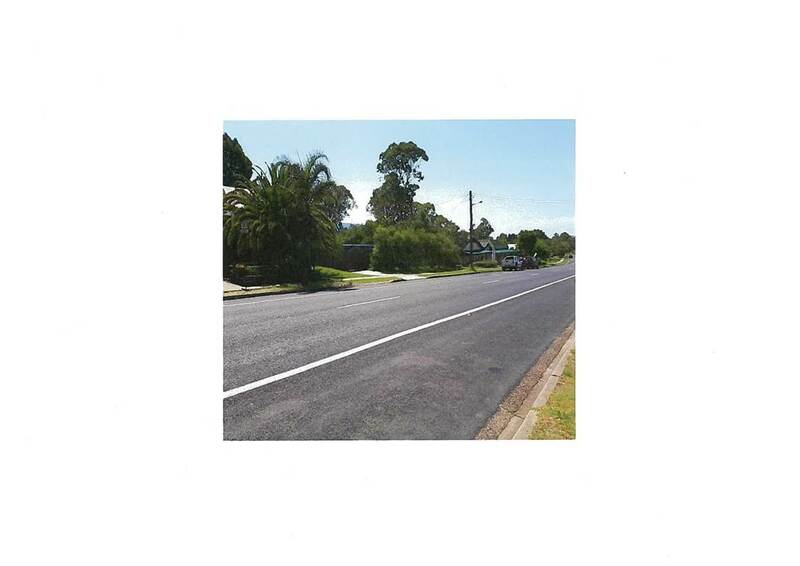 This SRV currently achieves an income amount of approximately $195,000 per annum and has been directed over the past 13 years to improve a range of infrastructure used by locals and visitors including BBQs, boat ramps, beach access and tourism signage. It is currently being used to fund Council’s resolved contribution to the Eden Port project. The second SRV was successfully applied for and commenced 2010/11 and is raised from commercially rated properties in the Shire. This SRV has been approved for 20 years and supports Council’s tourism marketing, and promotion and support for the accredited community run Visitor Information Centres (VIC). This SRV currently achieves an income amount of approximately $295,000. In May 2018 Council approved a tender for Shire-wide destination marketing to an external contractor, Sapphire Coast Destination Marketing (SCDM). SCDM’s role involves destination marketing, industry development, liaison and partnerships with regional, state and national tourism bodies and funding attraction where possible. SCDM also facilitate relationships with the VICs and tourism businesses locally to build strong alignment to the Sapphire Coast brand. There are 854 commercially rated properties that currently contribute to the $295,000 amount raised through the SRV. This is raised through the base rate and the ad valorem components of the rates so more highly valued properties contribute a greater proportion. 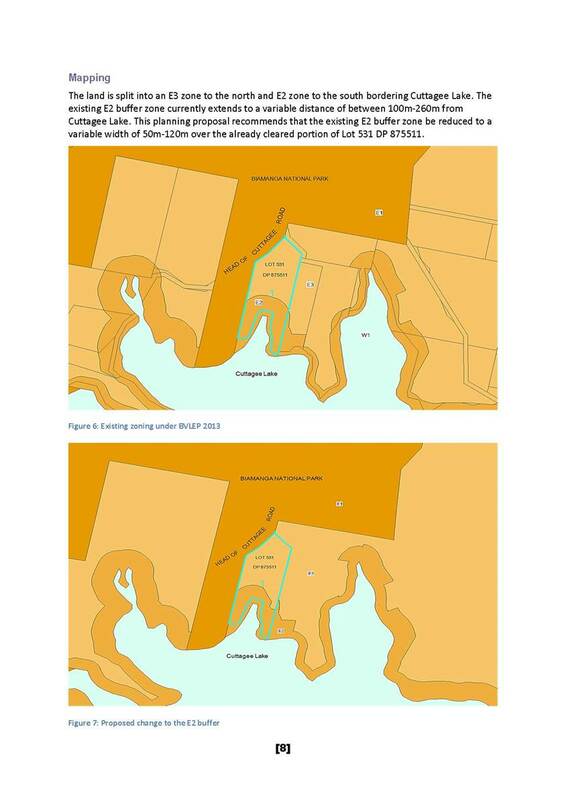 An example of how this applies is that one of the highest contributors to the SRV amount would be the Sapphire Club in Merimbula due to the high value of their commercial land. The properties that contribute are located in designated commercial areas in the Shire. Several properties in these areas, whilst having a business activity carried out on the premises, are also residential and in some cases the property owner has applied to have the residential rate applied and therefore do not contribute to the SRV. In order to ensure the Shire can be promoted effectively into key visitor markets, the previous Sapphire Coast Tourism Inc, who held the marketing and promotions contract with Council until 2018, requested additional funding above the SRV income, to undertake digital marketing and promotion. This was funded by Council, following Council Resolution, through the General Fund for each of the three years. 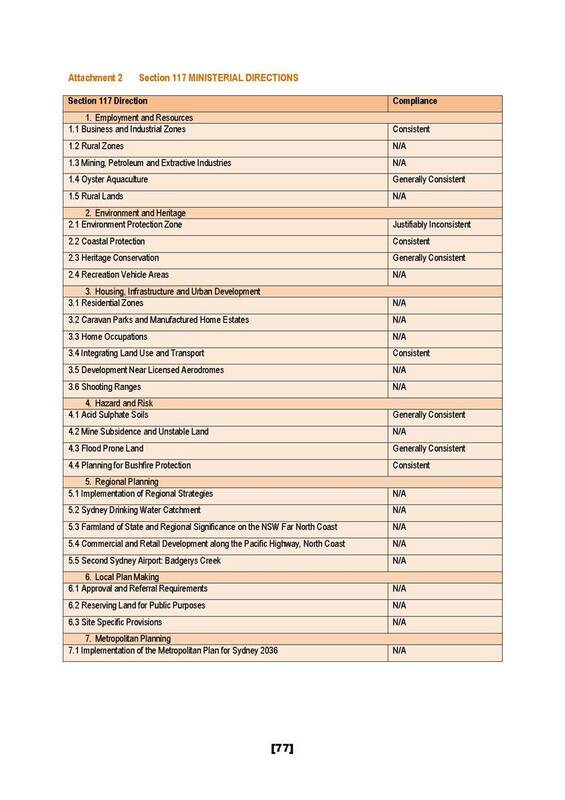 This has not been allocated in 2018/19 and is not in the 2019/20 draft Budget. There were some issues raised initially, when the current marketing SRV was introduced, as a number of tourism related businesses that for various reasons are not rated under the business category do not contribute to the current SRV yet benefit directly from the tourism economy. This is not an issue isolated to the Bega Valley. 1. That Council authorise staff to continue modelling a special rate variation application based on raising funds to fully implement the six pool facilities strategy and provide for additional tourism marketing program and other tourism related expenses. 2. That a communications program is developed to present the program and all potential impacts to the community. 3. 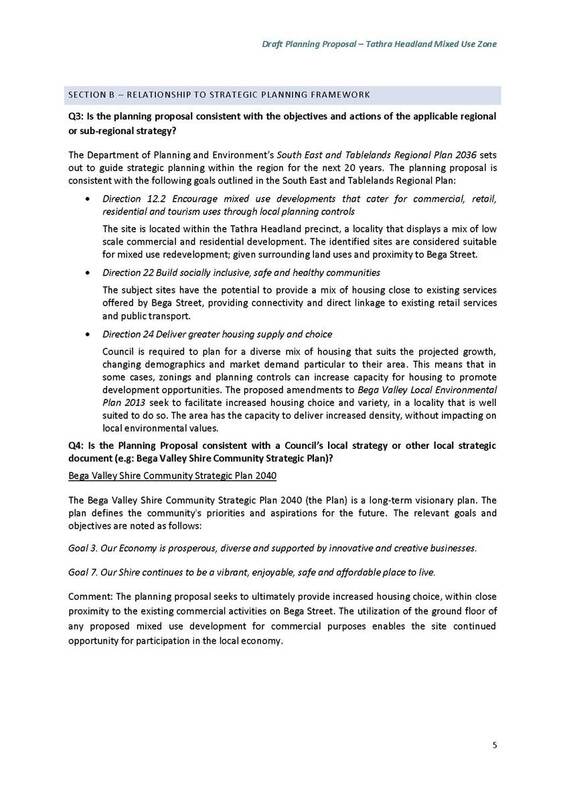 That Council include the development of a special rate variation application proposal as a key item in the draft 2019/2020 operational plan for formal consideration and resolution by Council prior to submission to IPART in February 2020. 4. That Council, in conjunction with other Councils, lobby the NSW Government to amend the Local Government Act to include provision for the application of a special levy for tourism. Council officers have been progressing actions against this Resolution. This report focusses on the aspects relating to tourism marketing and other related expenses referred to in the Resolution. A separate report is being prepared in relation to maintaining six pools into the future. In 2016 Council commissioned a Review of Tourism Services in the Shire. This Review looked at current models of tourism marketing and promotions and options for the future and funding models. · Council allocation from general revenue. Council has been working through this issue with the support and advice of the VICs and SCDM since that time to identify the most effective and equitable approaches in a complex legislative and logistical environment. As noted previously, Council already has two SRVs in place focussed on supporting its tourism related activities – infrastructure and marketing and promotions. 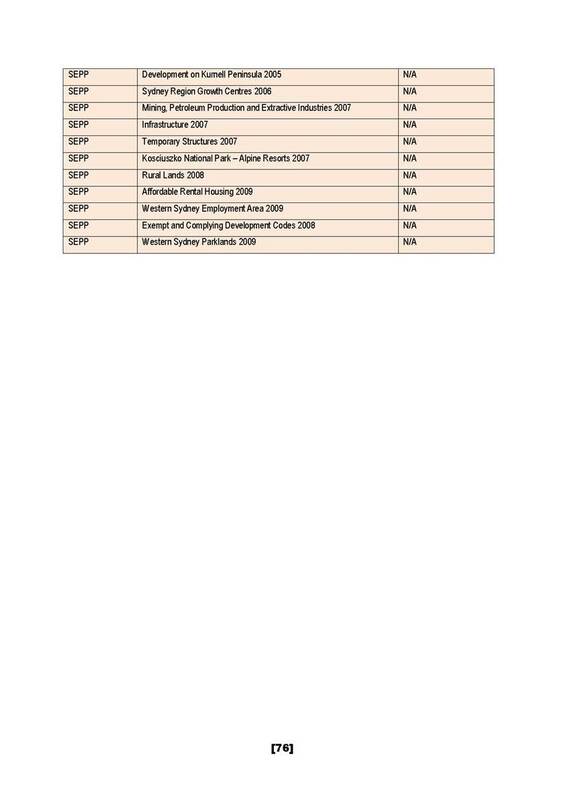 In 2006/07 Council went through an extensive review of tourism funding directly paid by the General Fund which at that time, was in the order of $1M. A sector restructure was undertaken and over the period of 2007/08 and the subsequent year, Council worked with the VICs and the Bega Valley Shire Business Forum to establish a new model and set up Sapphire Coast Tourism Inc funded by an SRV which was approved for a period of 20 years. Since that time the VICs, SCT Inc and now SCDM have worked to provide excellent marketing and promotions for the area on a relatively limited budget. Whilst a smaller local government commitment statistics for the local area rank extremely high compared to other comparable areas. The State Government instituted, through IPART, a review of rating in local government in 2015/16. 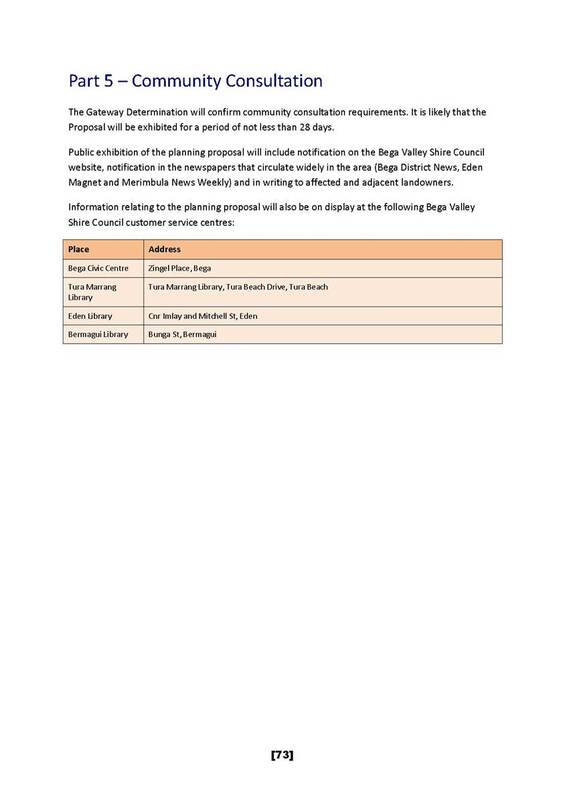 Bega Valley Shire Council made a submission as part of the consultation in relation to that process. IPART delivered their report to Government in December 2018 however no response has yet been provided by the State Government. Council officers have been researching work undertaken by other Councils in this area. 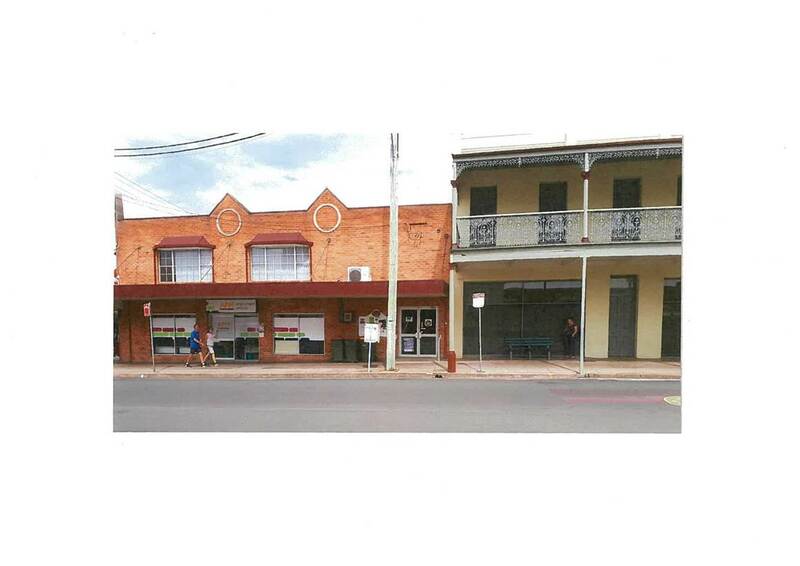 For example, Byron Shire Council has looked at a range of models and most recently investigated a point of sale, voluntary contribution that would contribute to local government tourism related expenses. This has not progressed. Over the past three years the NSW Government has significantly restructured State funded tourism services in NSW. The former Regional Tourism Organisations (RTOs) have been replaced by Destination Boards. These are funded by the State Government and have been predominantly established to reflect the now legislated Joint Organisation of Councils footprints. Destination Southern NSW (DSNSW) represents our area and is responsible for the development of Destination marketing plans and strategies. SCDM works very closely with DSNSW to ensure there is integration in planning and programs. SCDM then works with local community run VICs and Council to ensure adequate information and integration. This is a new model in its infancy but there has been good intent through all involved to date. Council also provides direct support for VICs through provision of facilities etc in some areas and a portion of the funding provided by the current SRV, and paid to SCDM is provided to VICs to support their work. 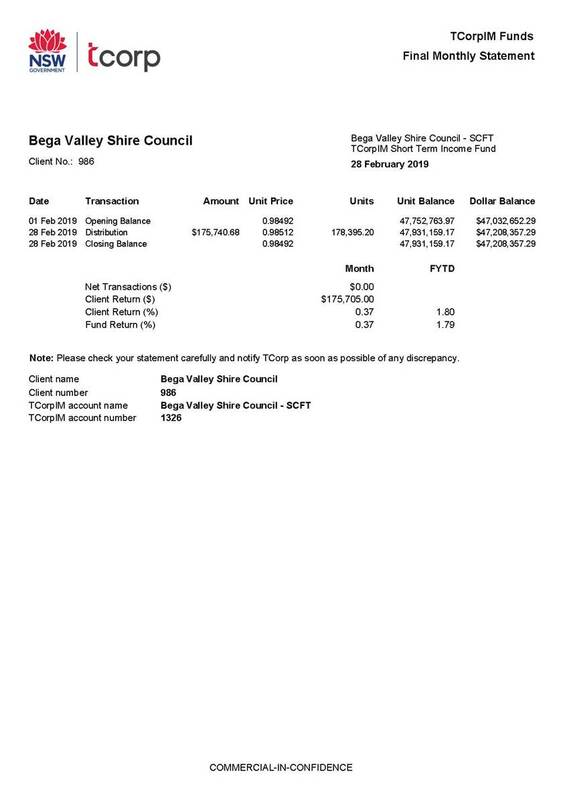 Tourism Snowy Mountains (TSM) has been very active in looking at a range of models including a bed tax on accommodation providers; a business tax capturing all businesses; and application of a rate increase via an SRV on all rate payers. TSM have also presented a case to Destination NSW and to the Destination Southern NSW (DSNSW) Board on working to develop a position on this to present to State Government for consideration. This work commenced late in 2018. The General Manager has also met with staff from the OLG in relation to options. 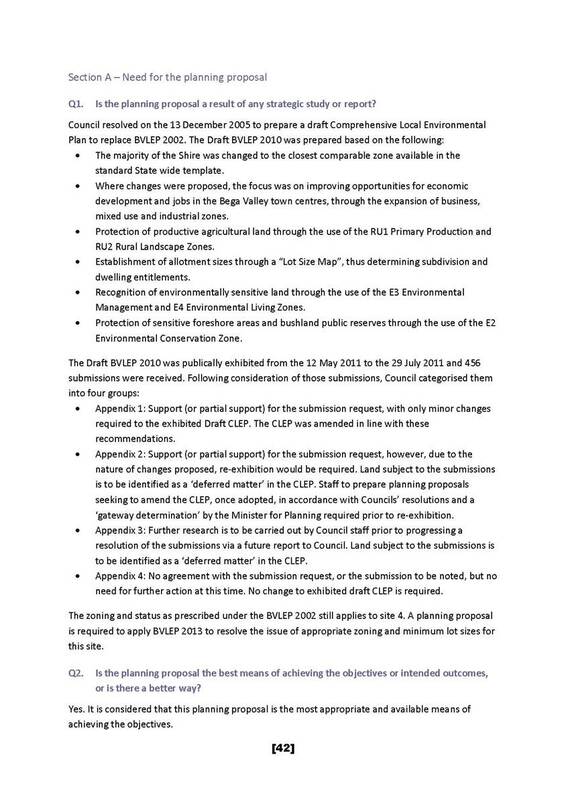 This would require legislative change, either by a change to the LGA as undertaken with the introduction of the capacity to levy for coastal protection works (S496A of the LGA) or as in the case of Blue Mountains emergency service levy, through separate legislation. This is a tourism sector led approach which has been considered by TSM and Byron Shire Council and others. 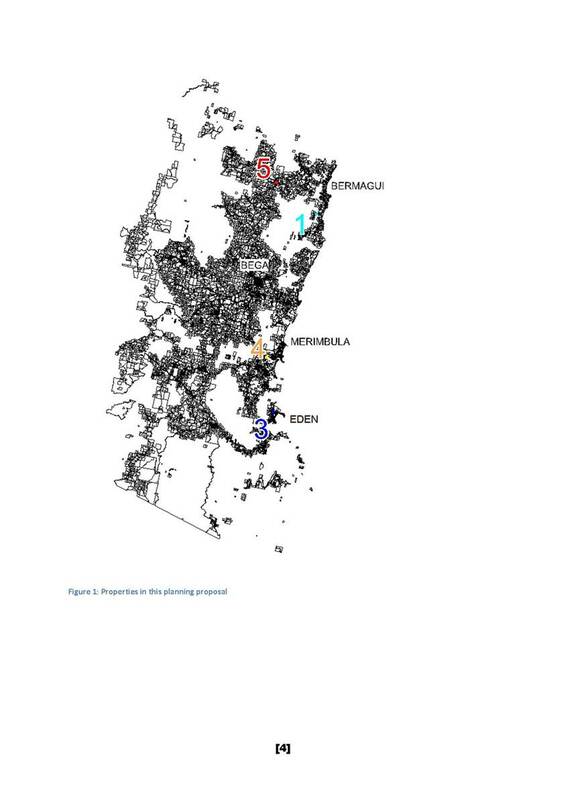 A model where all properties in the Shire contribute (e.g. residential, rural) is achievable. Council currently has this in place in relation to funding tourism infrastructure which when it was introduced, had wide appeal as it contributed to infrastructure that residents and tourists would benefit from. General feedback from Councillors to date indicate this is not a preferred approach. o expected that this model may take several years to achieve. Under S495 of the LGA Council could resolve to identify properties that directly benefit from tourism marketing and promotions and apply a levy amount. This is different to an SRV and only applies to those properties directly benefiting from the service (tourism marketing and promotions) provided. The amount is raised by an increase in the base rate and the ad valorem component. Council should continue to utilise the local government sector to present a new model that potentially leads to legislative change (e.g. utilising CRJO and ISJO and Destination NSW). There is considerable interest in presenting a case for a new model to the State Government, though this takes resourcing and a long-term commitment. An alternative model may be for Council to support and promote a membership model and collect membership fees which it then distributes rather than a rating model. A key challenge is that this, by its nature, would be a voluntary membership and there is already a membership model within the VIC structure. There is potential that any additional funds raised above these memberships may be minimal. The “pay to play” model is currently partly in use and has been over many years . This sees operators or groups contribute to a specific campaign. 1. Apply to have the current marketing and promotions SRV extended to all properties in the Shire (amend a current S508(A) approval). 2. Seek approval to increase the current SRV commercial property levy amount levied on businesses (amend a current S508(A) approval). 3. Investigate and develop a model that creates a new mixed use rating category and maps all properties in the Shire with a tourism business activity (utilising S518B of the Local Government Act 1993 (LGA). 4. Investigate and develop a special levy on properties benefiting from tourism marketing and promotion by way of a special levy (utilising S495 of the LGA). 5. Promote legislative change with other local government bodies to implement a special levy for tourism through amendment to the LGA or by way of separate legislation. This relates to item 4 of the Resolution of October 2018 and work has commenced in this area. 6. Advocate for increased State funding for local government areas with significant tourism activity which benefits NSW. This could be through funding direct to local government or to the Destination Boards. 7. Support the local industry to increase revenue through membership models. 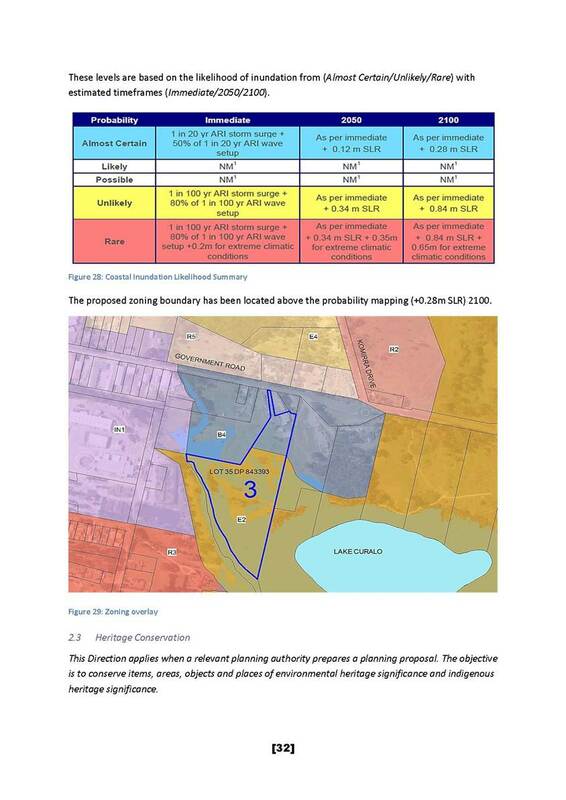 Of the options, a Special Levy, may be achievable with the least amount of impost on the organisation and the community and with additional Council resources may be progressed and developed to present to the affected property owners for consideration by Council at the end of 2019 or in 2020. If this model is endorsed then a report would be prepared for Council to consider in August of 2019. An amount of $100,000 has been nominally included in the 2019/20 draft budget to cover the expense of undertaking this work and the development of the rating model and application. The State-wide solution which sees a funding allocation to Shires with significant impacts from, and reliance on tourism, or introduction of legislation that allows those Shires to implement a dedicated Tourism levy is also seen as one that should continue to be progressed with the CRJO, ISJO , Destination Southern NSW and Local Government NSW (LGNSW). This option will require considerable leadership, lobbying and time to implement. The VICs and industry bodies have been meeting with Council officers to look at how to gain community support for a model that will ensure all tourism related businesses contribute to increasing the capacity of Council to support additional marketing and promotions activity for the Shire. Council will continue to liaise with the industry bodies and the sector. If Council resolves to progress with preparing an SRV application in the 2019/20 year for introduction in the 2020/21 year, then there will be a requirement of a community information program as part of the process. If a Special Levy is to be considered, then direct engagement with the affected property owners will be required to gain their support for any application. Council has considered this matter on a number of occasions and the action is adopted in the Council’s current Delivery Program 2017-21. Council currently has two SRVs aligned to the tourism and visitor economy. The SRV – Tourism Services (commercial ratepayers only) provides assistance to the local tourism and visitor economy through destination marketing and engagement, and VIC management arrangements. The SRV – Tourism Infrastructure supports a range of assets directly used by the broader Bega Valley Shire community as well as visitors. This infrastructure includes recreational assets and signage. The tourism / visitor economy sector is also supported by significant in-kind resource support from Council officers, subsidised rental arrangements (where relevant) and funding assistance through State and Federal Government programs where possible. In order to develop a new tourism funding model for consideration by the industry and aimed at applying to individual properties that have a tourism related business and subsequent consultation and application to IPART, it is expected Council costs will be in the order of $100-$150K. This amount covers the required property mapping, the development of rating models, the consultation and application process. This amount would need to be provided by the General Fund however it is understood that if a new levy was successful, these funds would be able to cover this cost retrospectively. Industry requests for additional funding, through the TILG consultation, indicated to that in their view to adequately market and promote the area an additional $340,000 through to approximately $1M would be required. In October 2018 Council resolved to continue modelling for a new tourism related SRV in the order of $300,000. The allocation of funding by Council must be directed by the adopted strategies and actions outlined in Council’s adopted Delivery Program, Operational Plan and Budget. The development of a rating model that increases funding able to be allocated to market and promote the local area has been included in Council’s current adopted documents. Visitation is identified as a focus area in Council’s Economic Development Strategy 2016-2021. The natural environment of our region is the key regional tourism related asset promoted to potential visitors. The discussions by the TILG recognised this asset was the key destination marketing aspect that sets the Sapphire Coast apart from other regions in Australia. Tourism and the visitor economy is a key local industry with an estimated value of up to $430M annually. Domestic day, domestic overnight and International tourism totals: 460,000; 520,000; and 35,000 visits respectively with many local businesses supported by this economic activity, though they may not identify as a ‘tourist’ business. The value of the tourism and visitor economy is significant to the Bega Valley Shire. Supporting sustainable growth in this key sector supports local jobs and growth. The Review of Tourism Services in the Bega Valley Shire (2016) report clearly articulates the important role Council plays in ensuring the broader Bega Valley Shire benefits from the tourism and visitor economy into the future. The tourism and visitor economy is a key sector in the Shire that aligns directly to a range of cultural events (e.g. Four Winds, Merimbula Eat). It also supports social outcomes including employment and training opportunities. 3. That applications are called for in July 2019 for fund events and projects for the financial year 2019/20. Council has received advice as to the 2019 Southern Phones dividend. This amount must be allocated to activities with community benefit and has previously been identified as a funding source to support community events and festivals. Due to uncertainty in the amount for the current year, no funding allocation was made against the expected income. It is proposed the dividend amount when received should then be allocated in the subsequent year’s Budget and should continue to support community events and reimbursements. Council was a founding shareholder of the Southern Phone Company Ltd which is an unlisted Public Company with only local councils as shareholders. This means all profits are returned to the community through dividends paid to local councils. Southern Phones was formed in 2002 after receiving $4.77 million in funding from the Australian Government’s Networking the Nation scheme. The objective of the company is to deliver more affordable telecommunications services to regional communities and to share their success with those communities, through dividends paid to our Local Government shareholders and used for the benefit of their local communities. The dividends are calculated utilising the number of Southern Phone subscribers in each local government area. In the early days the dividend amounts were small and Council considered allocating them when received. Over time the amount of the dividends increased annually and Council moved to include the dividend as an allocation to community based outcomes. In July 2016 Council resolved to utilise a portion of the annual dividend to fund some of its Community Grants Program. The 2015/16 dividend reached $130,887 and of this $105,500 was utilised to support this program. In 2017 Council received advice from Southern Phones indicating that a number of factors was decreasing the dividend payable and Council officers immediately took action to minimise commitments against the planned dividend so as not to exceed the Budget allocation. · That the funding model proposed to identify some allocation for events and community support [following reduction of the Southern Phones dividend funding] not be applied. Instead, staff prepare a report to Council with the first quarterly budget review, following reconciliation of the end of year financial results, outlining potential avenues of funding to support the restoration of a community events funding allocation of $40,000, potential allocation to also be identified for the Merimbula VIC relocation and fit out, Bermagui charrette, and the sealing of the Plumb Motors Auckland Street Car park. Council, at a subsequent meeting allocated funding from other sources to the Merimbula VIC relocation and additional WiFi for the Emergency Operations Centre in Bega. Council has now received advice in relation to the 2019 dividend, which is $65,097.68. In order to ensure we deliver community outcomes from the dividend, which is a requirement of the Southern Phones Constitution, it is recommended Council allocate the dividend post annual announcement each year for the following year. It is recommended this amount be allocated for expenditure in the 2019/20 Budget to support festivals and events funding of $50,000 and community group reimbursement and support of $15,000. This would support a process which would call for applications in July 2019 and fund events and projects for the financial year 2019/20. Council can determine to allocate the dividend amount to any project or activity that achieves community based outcomes. Council has in the past allocated the dividend to community projects and in the most recent period since 2015 supported a range of community festivals and events and offsets to costs for community groups. 2. Allocate the funds to a one-off Council or community project. In addition, it would be good practice to set in place a strategic approach that directs officers to annually budget the amount for the financial year following the announcement of the dividend amount. Council officers’ resources are currently in place and the process is already established to administer a funding application process. The funding provided would be directed to groups that have been assessed against the festivals and community events funding criteria. Council is a local government shareholder of Southern Phones Company Ltd. The Constitution of Southern Phones includes a clause ensuring dividends are paid to shareholder local councils, to support activities and projects of community benefit. Council has included festivals and events in its Strategic Plans and supports a number of events. This aspect of the program would cover community run festivals and events. The value to the local community in terms of economic, social and cultural outcomes is important and visible. This program has been seen to support new and emerging events and not to support well established and self-supporting local events. This report details Council’s Investments at the end of February 2019. 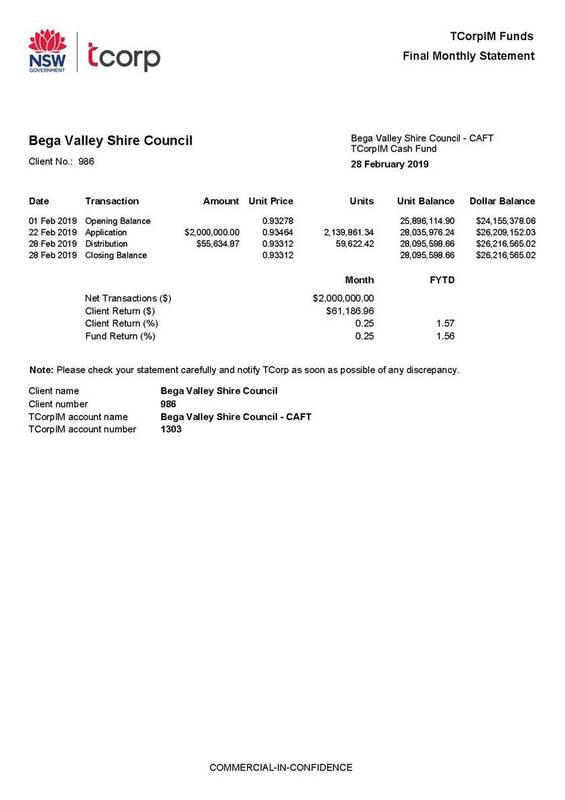 I, Graham Stubbs, as the Responsible Accounting Officer of Bega Valley Shire Council (BVSC), hereby certify the investments listed in the attached reports have been made in accordance with Section 625 of the Local Government Act 1993 (the Act), and clause 212 of the Local Government (General) Regulation 2005 and Council’s Investment Policy. Also, all investments have been appropriately recorded in Council’s financial records and reconciled on a monthly basis. Under the legislation and regulations mentioned below, the Responsible Accounting Officer must present to council monthly basis, the status of the investments held by Council. The Responsible Accounting Officer must detail the investments held, and their compliance with both internal Policy and external regulation under the Ministerial Order of Investments. In accordance with the recommendations made by the Office of Local Government (OLG) Investment Policy Guidelines published in May 2010, the monthly Investments Reports are attached to the Business Paper. This allows a stand-alone report to be published on Council’s website for the public to view without having to peruse the Council’s Agenda for the relevant meeting. With respect to the Fund’s monthly distributions, the custodian calculates the Fund’s earnings at month end and then pays a distribution based on these earnings. Distributions are paid to investors by way of the issue of additional units. Section 625 of the Act determines money may only be invested in a type of investment authorised by Order of the Minister for Local Government and published in the Local Government Gazette. The most recent Ministerial Order of Investment was published 17 February 2011. Council has an Investment Policy published under Policy number 6.07. This Policy is reviewed every 4 years by Council and annually by Council officers. TCorp has provided BVSC with their Investment Stewardship Policy (attached to the Business Paper to Council on 31 January 2018). In order to deliver the best long-term risk adjusted returns for clients, TCorp integrates Environmental, Social and Governance (ESG) factors into the investment processes of the appointed investment managers. TCorp will evaluate the ESG policies and practices of its investment managers as part of the manager selection process, as well as during periodic manager reviews. A constitutional referendum can be held at the time of the next election in 2020 and would then, if successful, allow for the election of a popularly elected mayor at the 2024 Council elections. Holding such a referendum to coincide with Council elections is the most cost effective manner in which to undertake this and allow for community input. 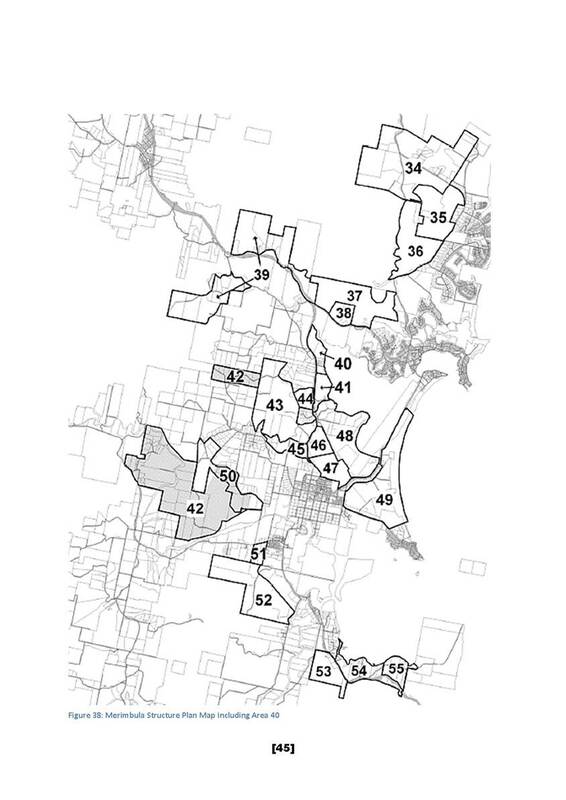 Councillors have previously been advised in 2016 and 2014 that advice from the NSW Electoral Commission is that the expected increase in election expenditure would be in the order of $20-30,000. That Council reinstate its annual sculpture acquisition prize of $10,000 per annum for the next three years, with funding drawn annually from the Southern Phones dividend. In 2019-20, the prize would be funded by reducing the Festival and Events budget to $45,000 and the community group reimbursement to $10,000. Council has previously supported an acquisitive sculpture prize linked to the Bermagui Sculpture event. The works acquired have been installed permanently in Bermagui, Eden, Merimbula, and a piece has been purchased for installation in Bemboka. Public art adds considerably to the quality of local places and celebrates our cultural community and local heritage. There are a number of communities in Bega Shire that would benefit from installation of public art works. Council has also included public art in Council projects, such as the works in Littleton Gardens and Merimbula streetscape. Neighbouring shires offer substantial sculpture awards, which are essential to maintaining the quality of acquisitive art works. An acquisitive approach provides an excellent mechanism to continue to contribute to the community’s collection. Selection criteria and approach would need to be developed, and if works cannot be sourced annually, then the money could be held over for allocation in a subsequent year. Allocation of funds for an acquisitive sculpture prize from the Southern Phone dividend would affect proposed 2019-20 allocations to Festivals and Events ($50,000) and/or community group reimbursement and support ($15,000) which is proposed to be funded by the Southern Phones dividend advised to Council earlier this year. Funding availability in future years would be subject to the amount of dividend returned by Southern Phones. 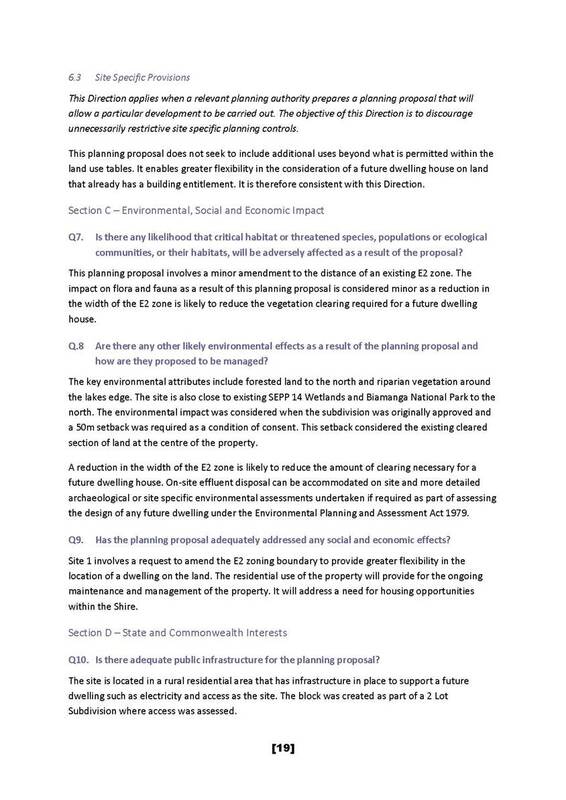 Response to Cr Griff’s Question on Notice (Item 20.4) at the Council meeting of 30 January 2019. The question was taken of notice by the Director Community, Environment and Planning. 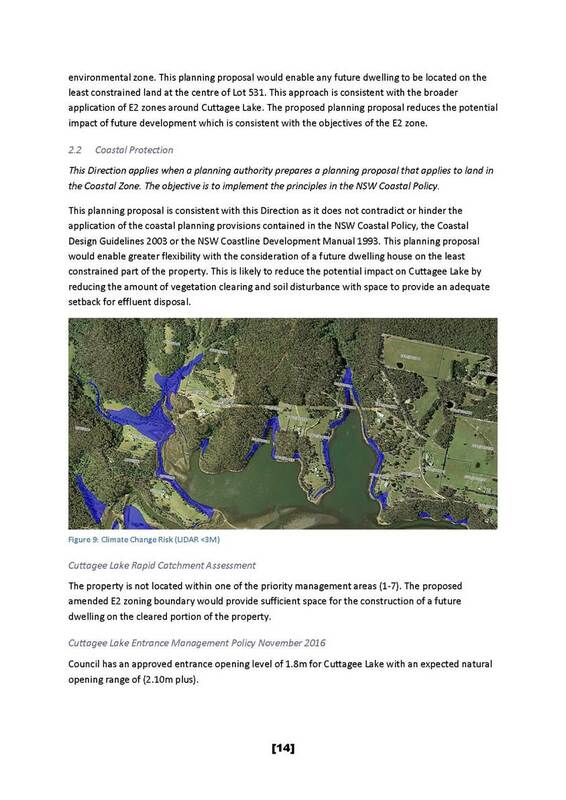 Council has now received a response from Land and Housing Corporation’s Regional Asset Director. Land and Housing advises it manages ‘a couple of hundred’ residential dwellings within Bega Shire. A specific figure was unavailable at the time of request. 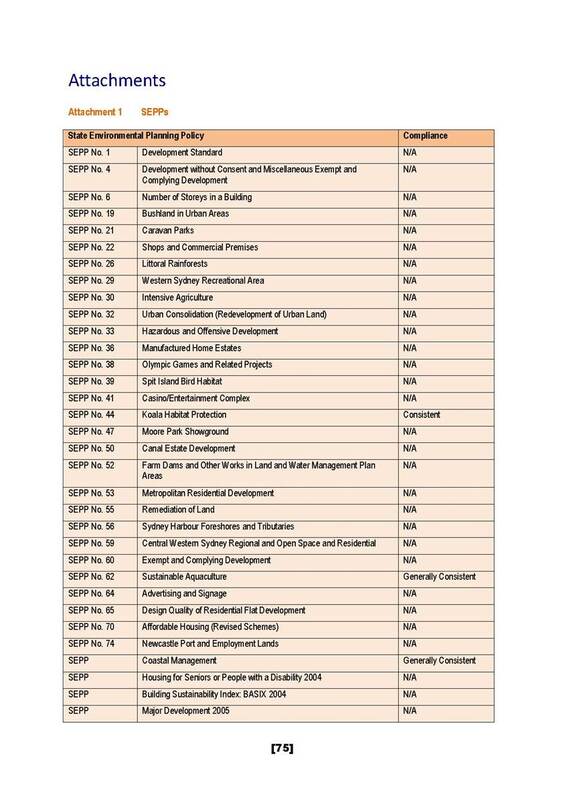 Of that housing stock, 11 properties are currently vacant. Land and Housing usually has a 28-day turn around for repairs between tenants and would generally expect around 7-8 properties to be vacant at any given time, pending any repairs required prior to re-letting. In Bega Shire, there are 3-4 dwellings that require considerable repairs to return them to habitable status. Land and Housing acknowledges the need for public housing within Bega Shire and has now committed resources to complete repairs to those properties in the next few months. A request for more specific information about available housing stock has been made and is pending.